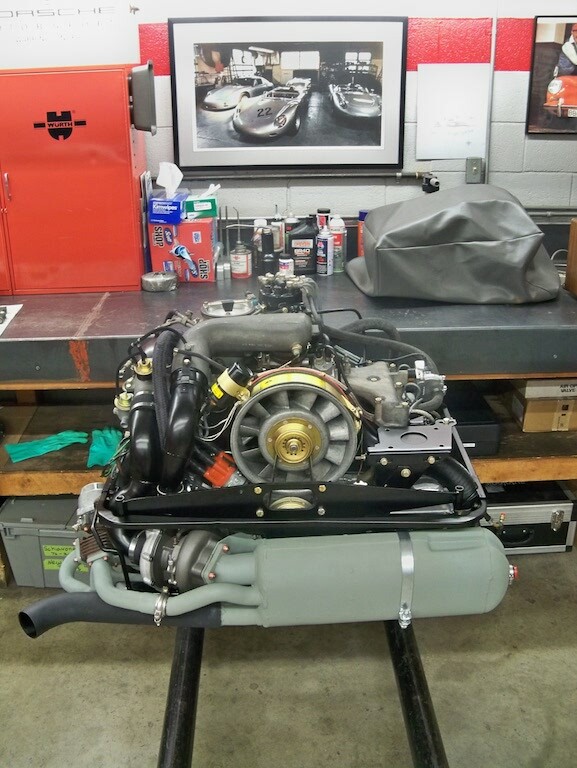 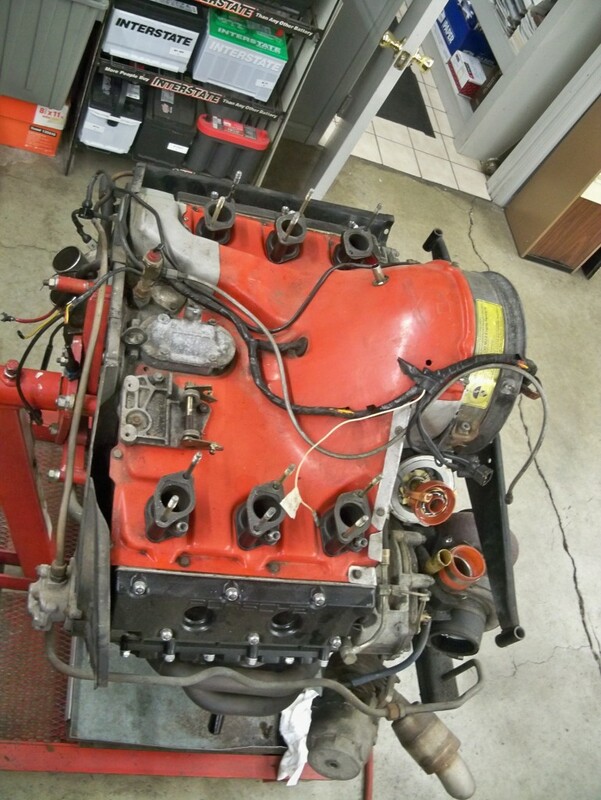 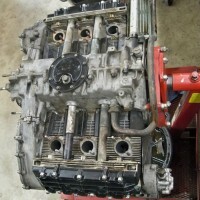 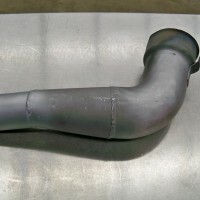 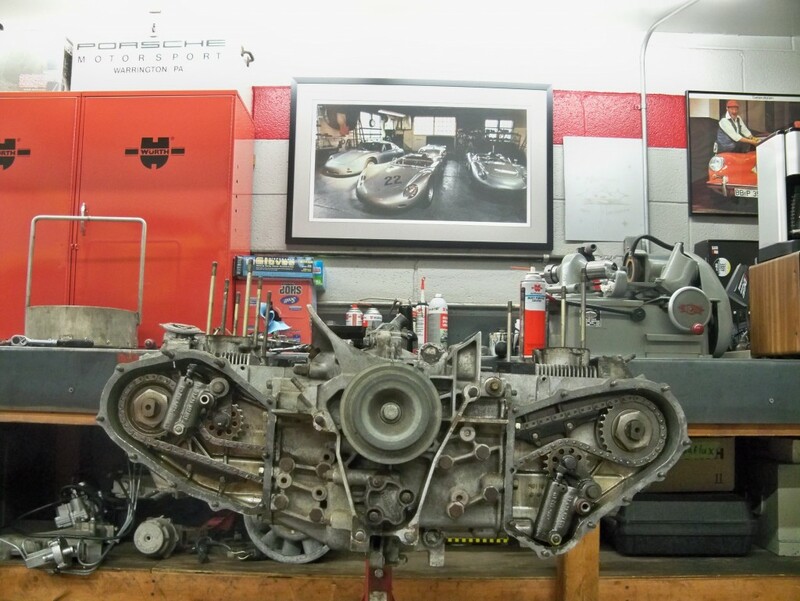 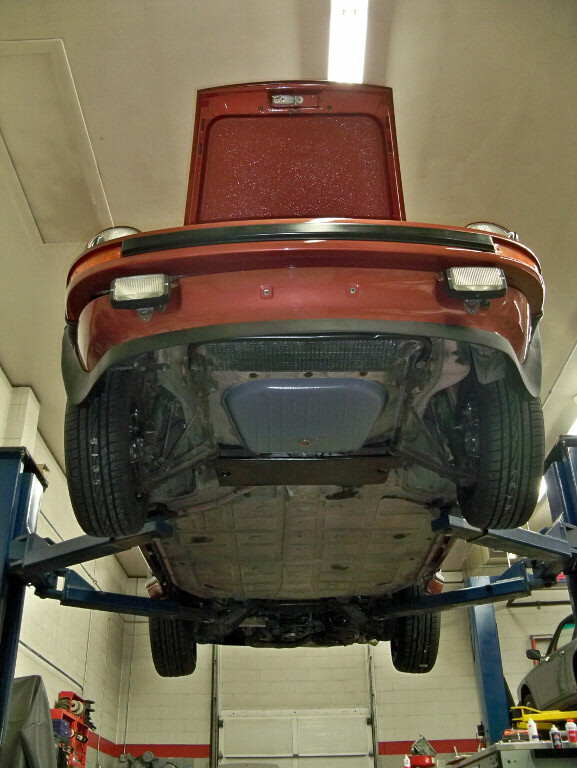 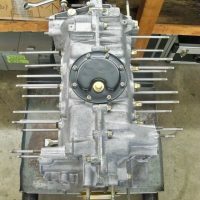 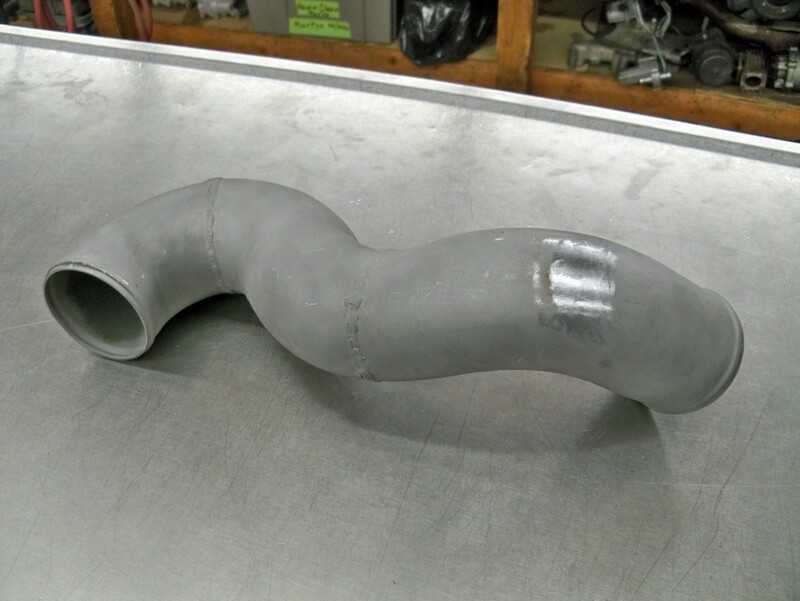 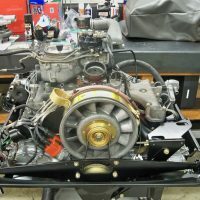 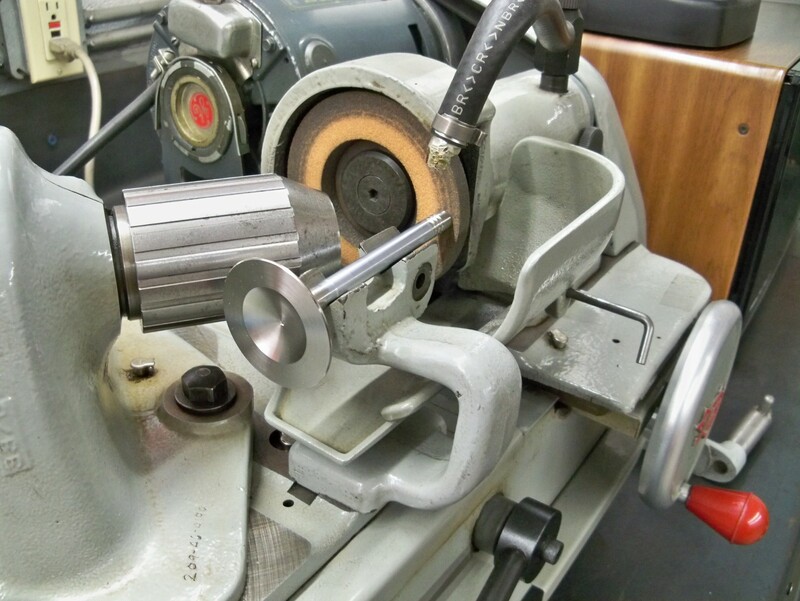 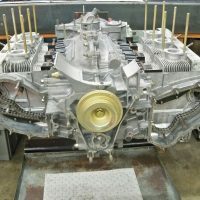 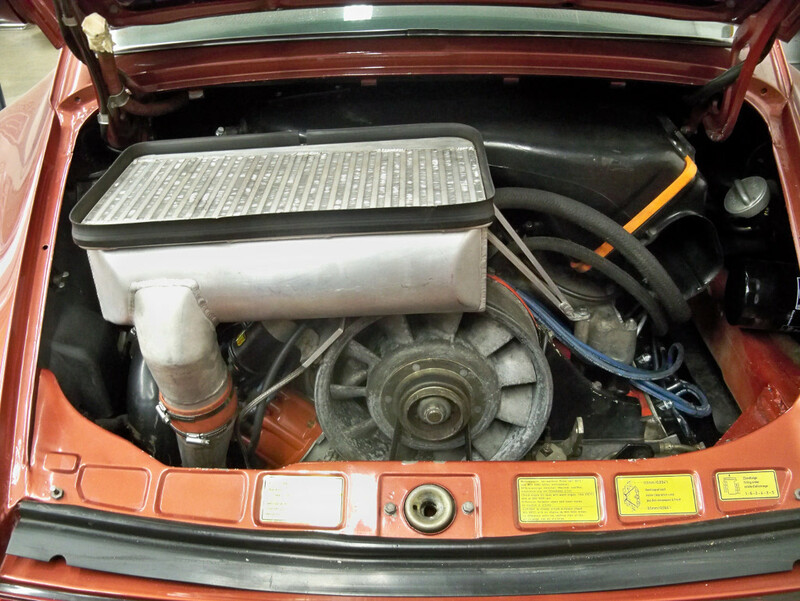 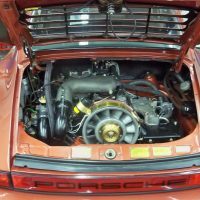 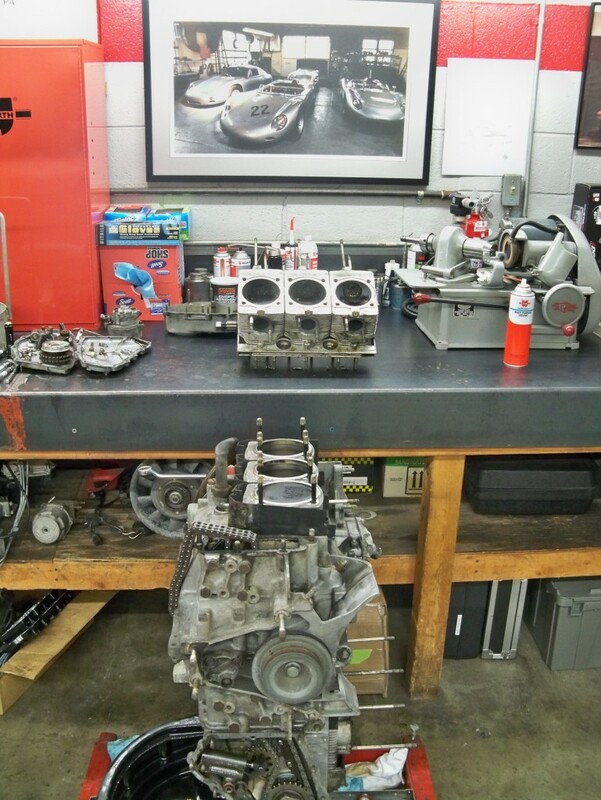 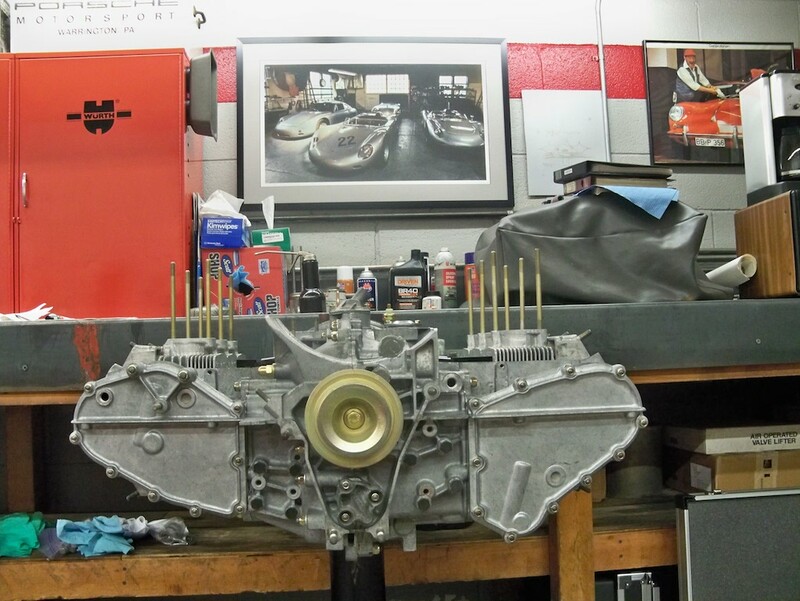 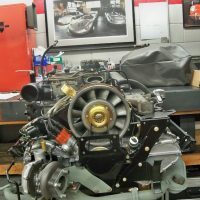 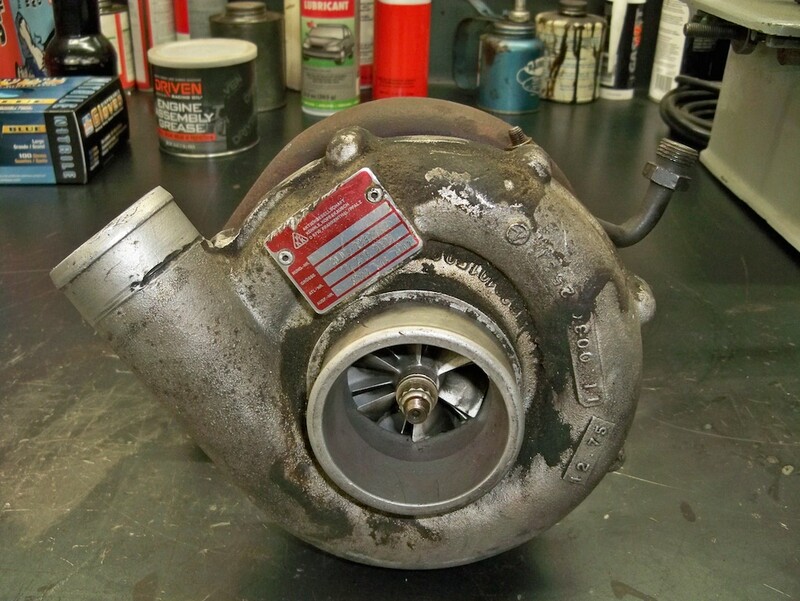 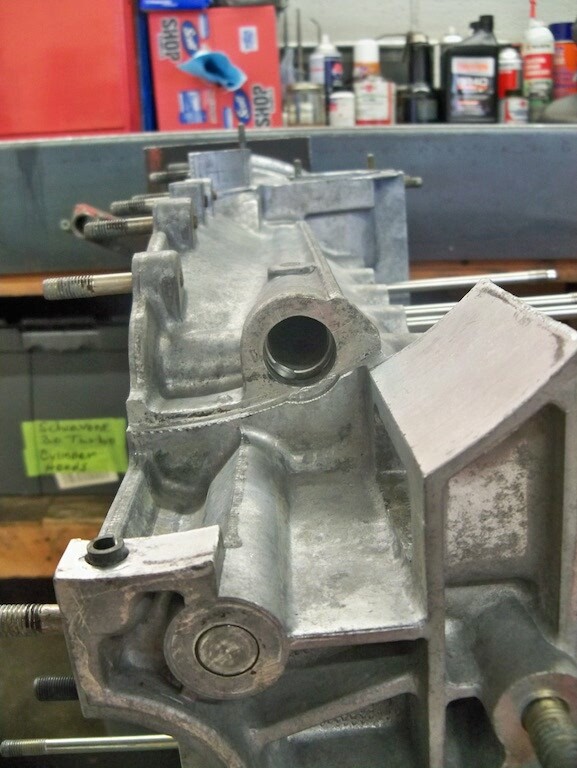 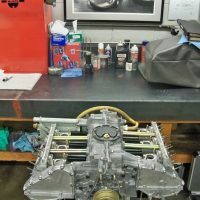 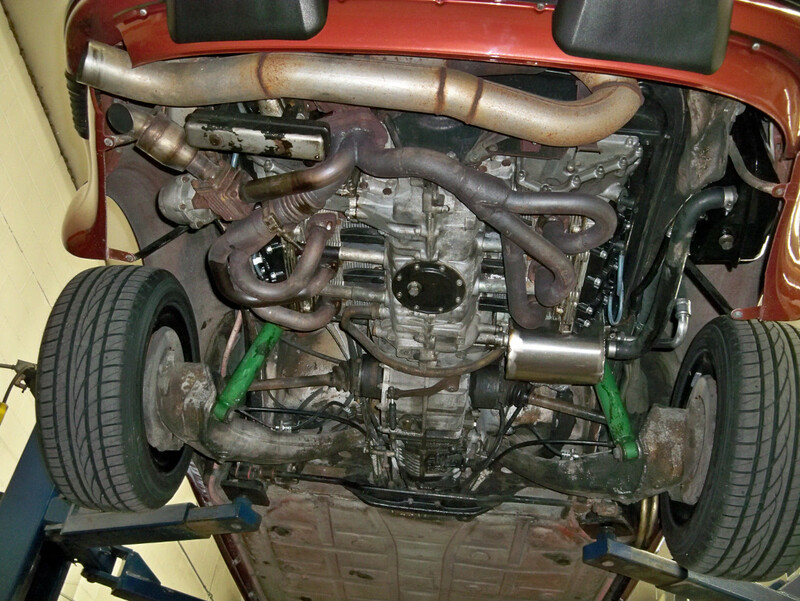 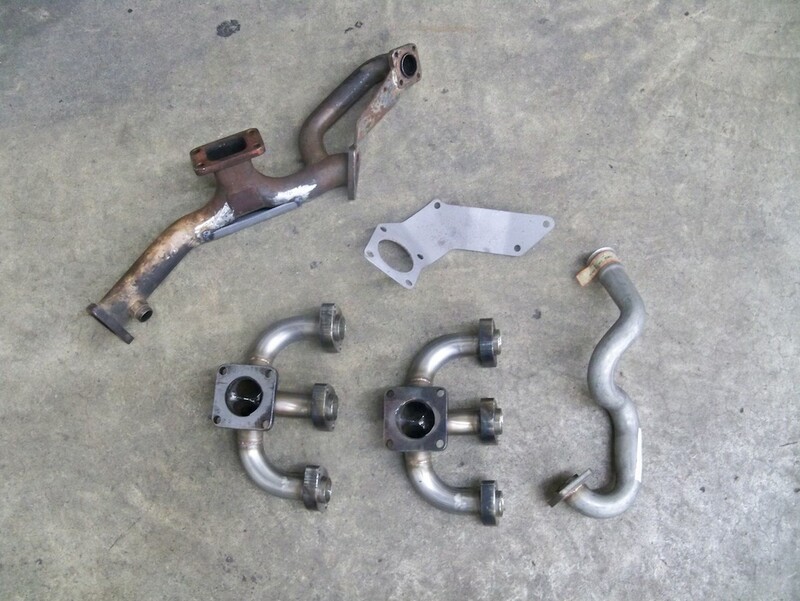 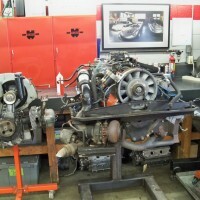 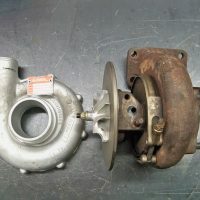 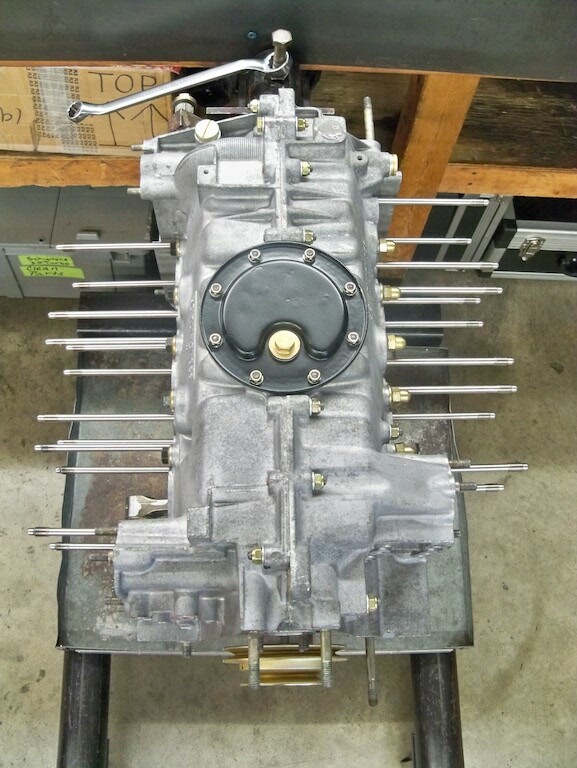 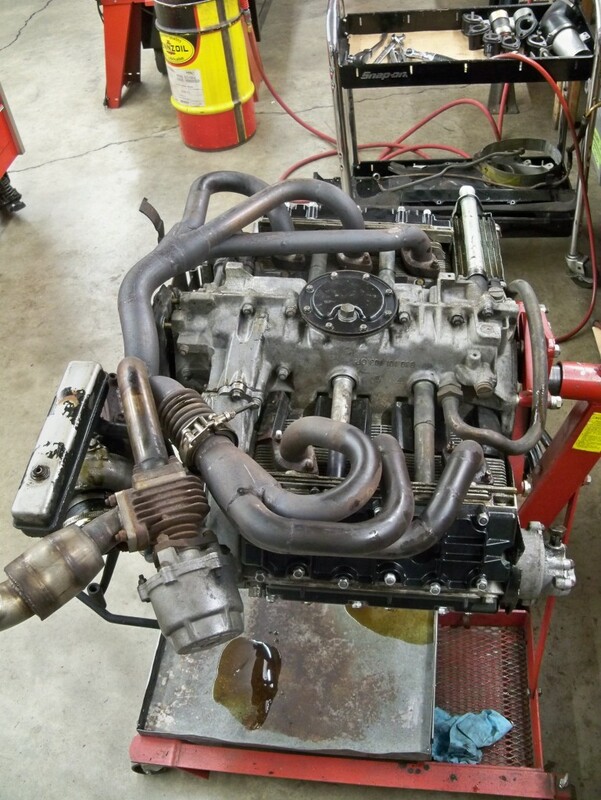 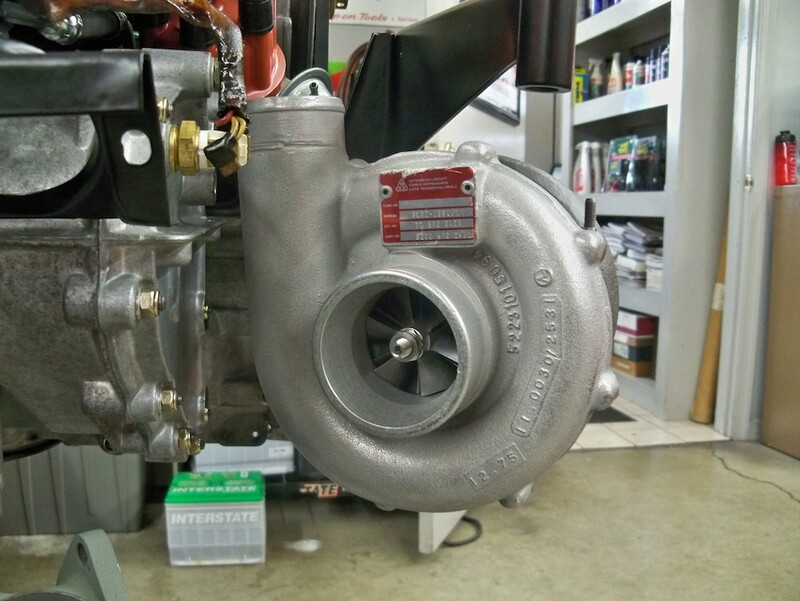 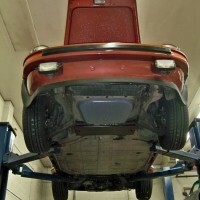 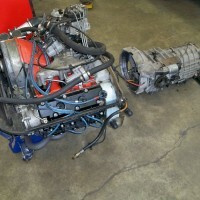 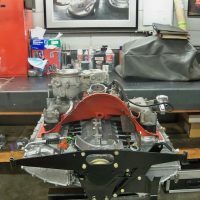 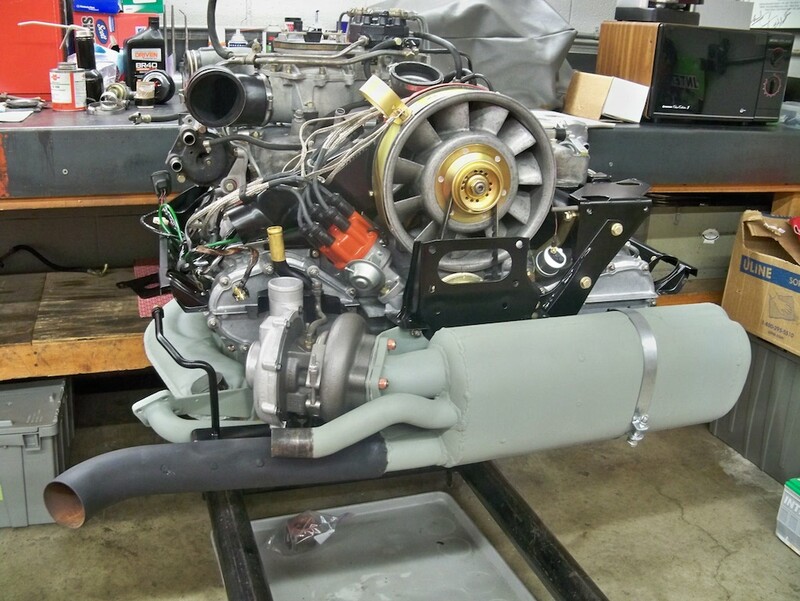 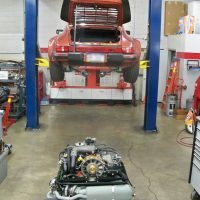 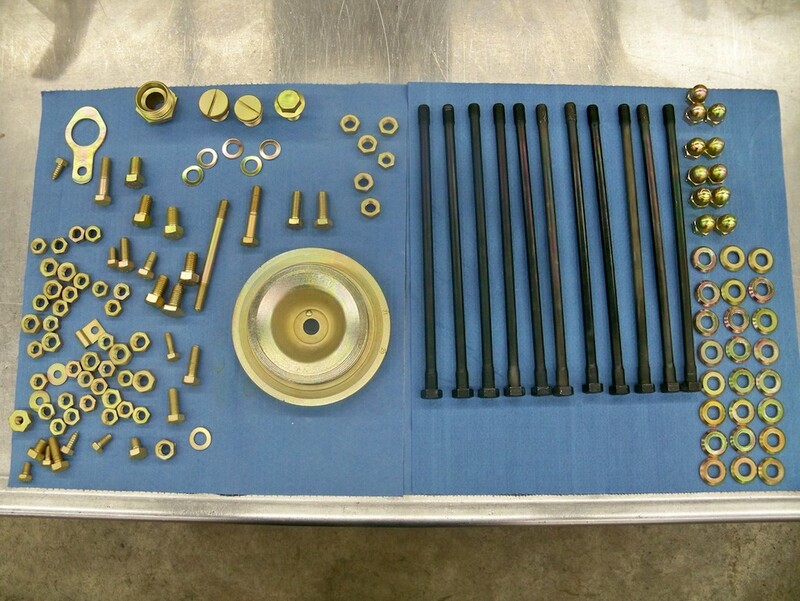 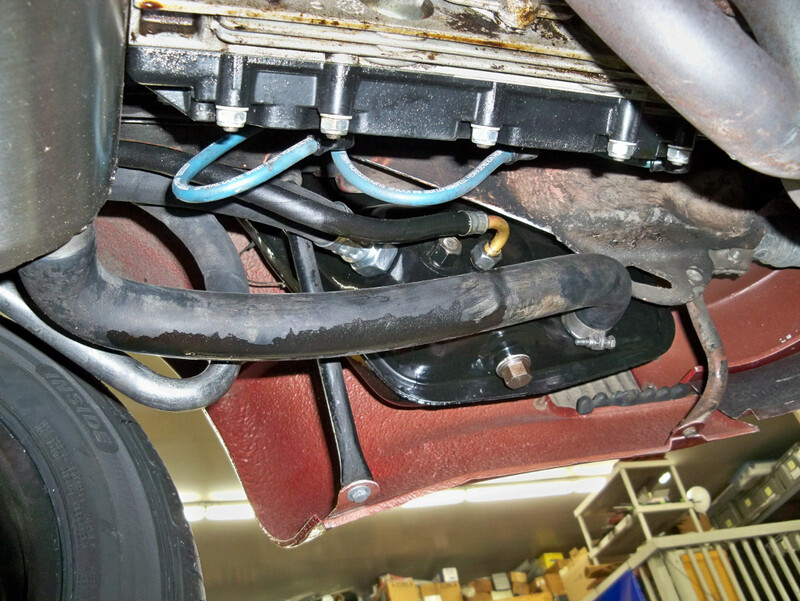 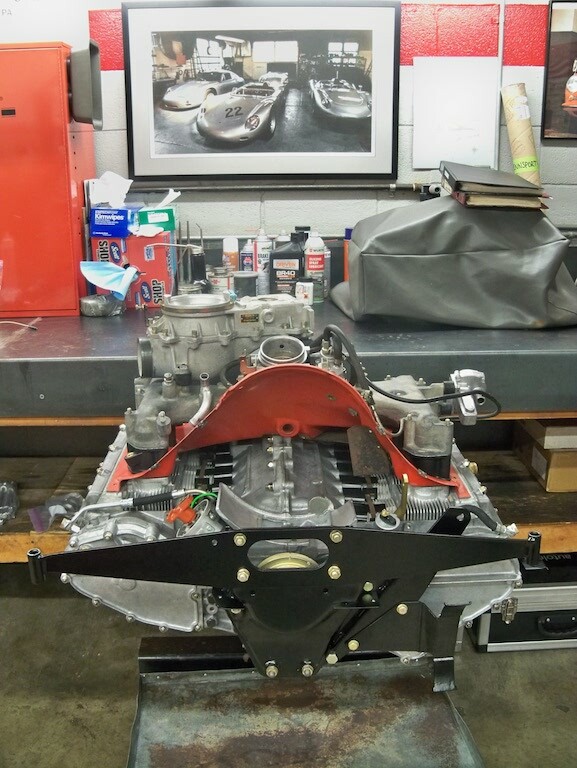 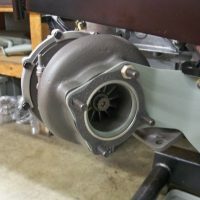 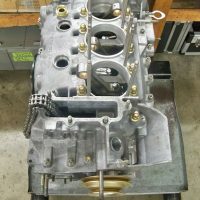 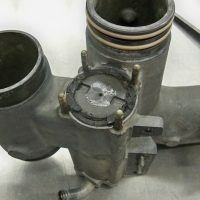 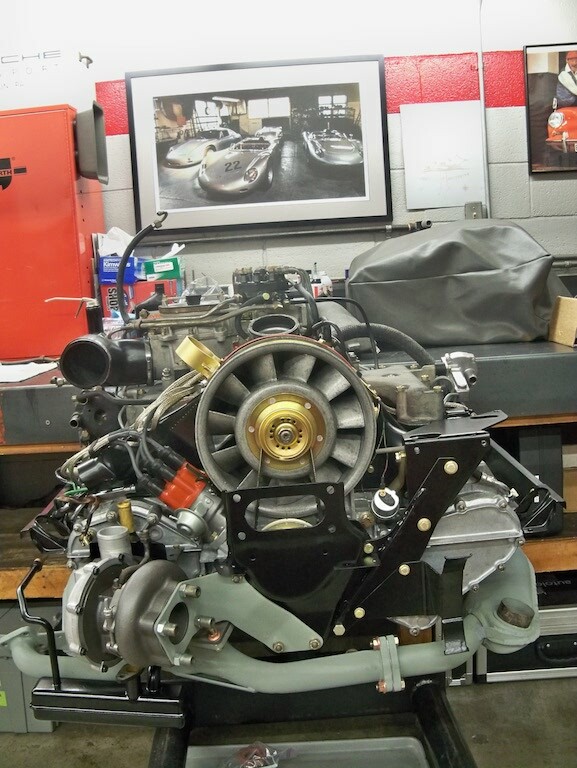 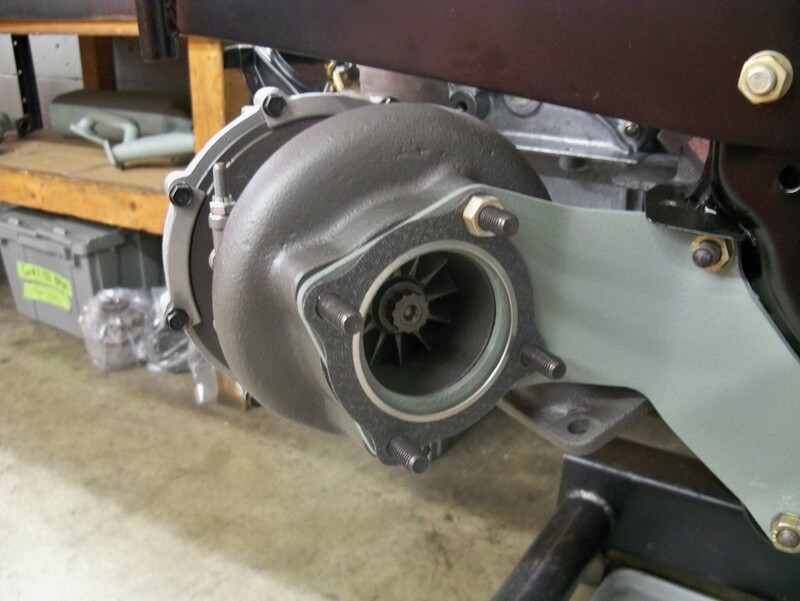 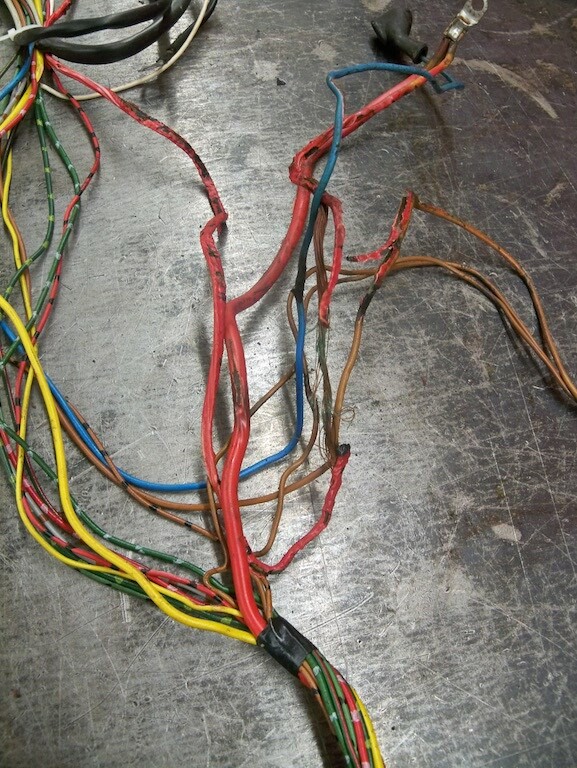 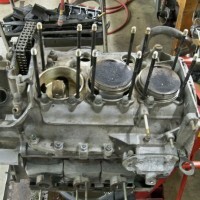 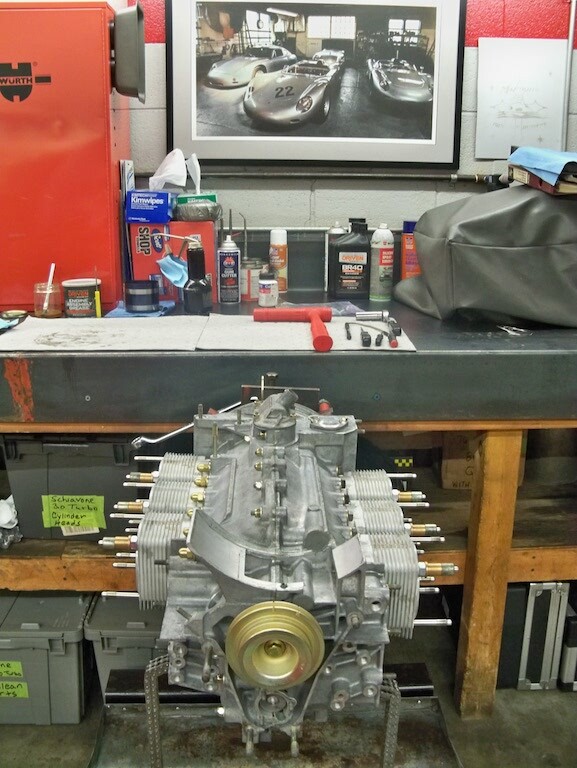 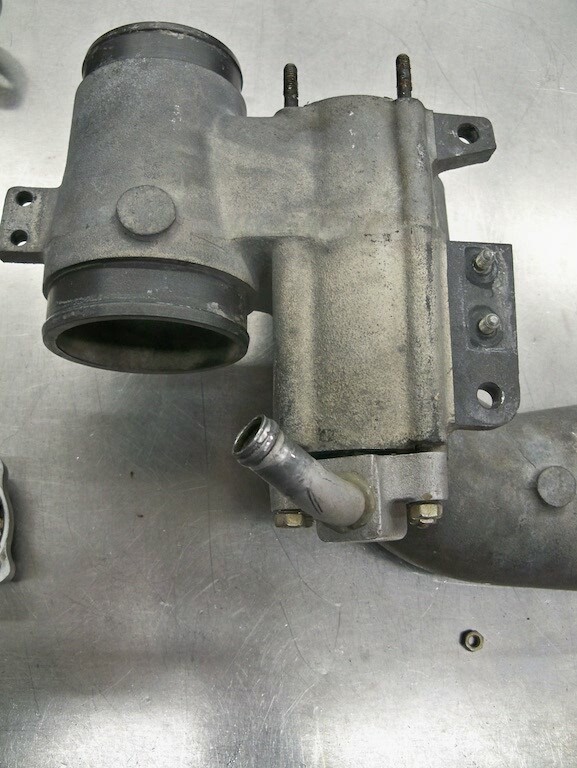 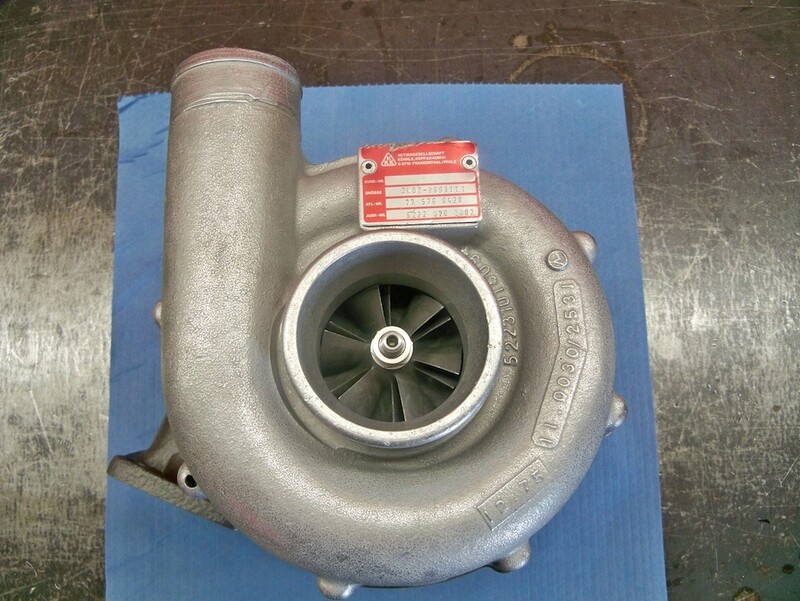 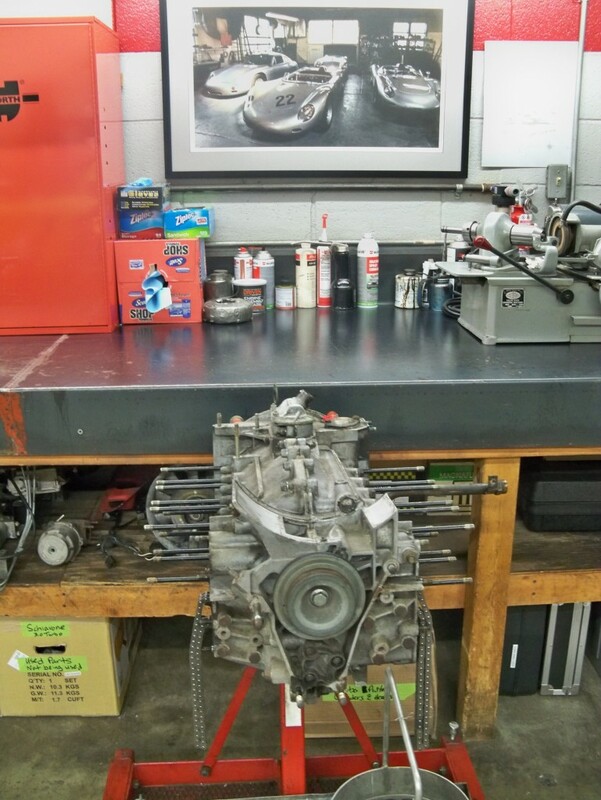 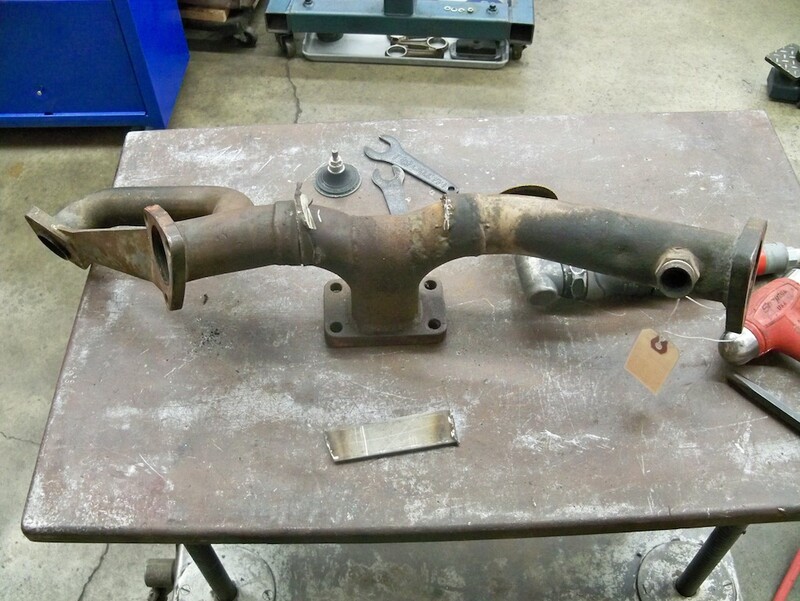 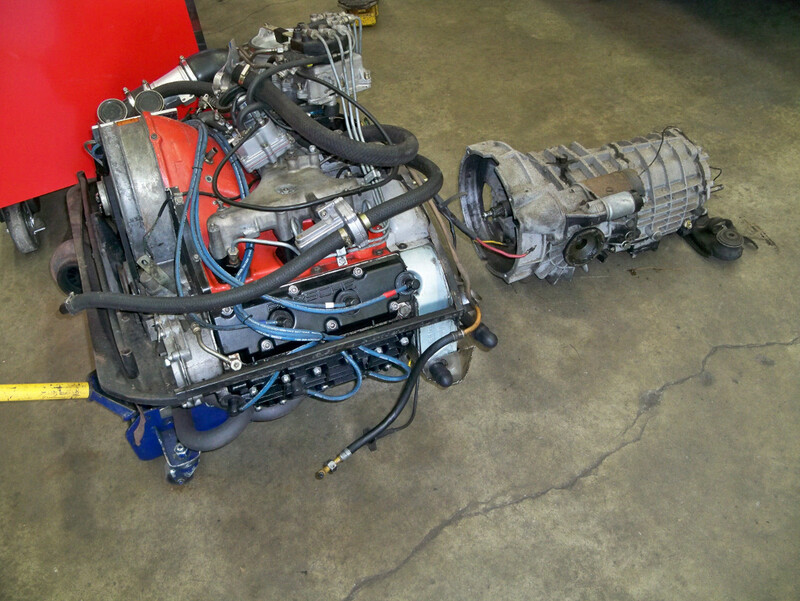 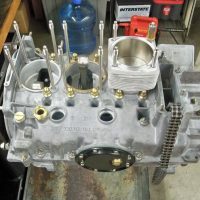 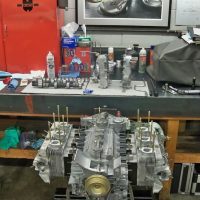 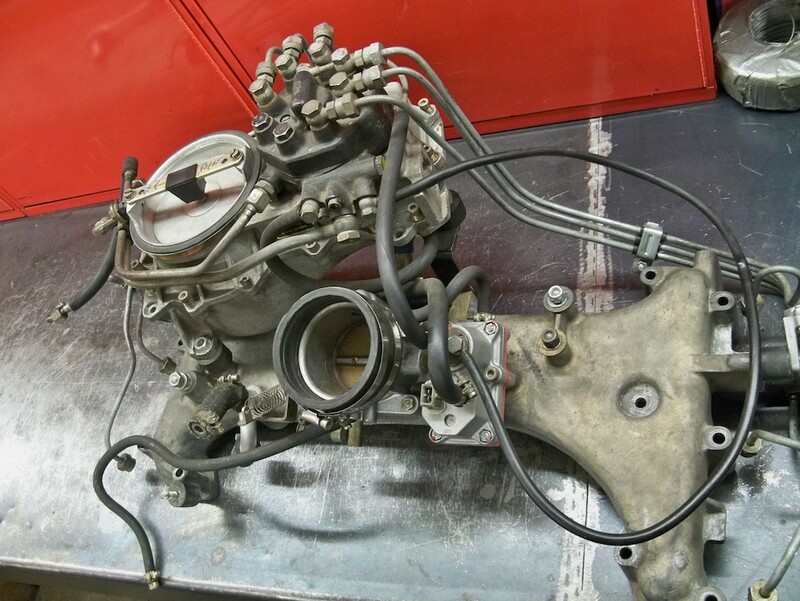 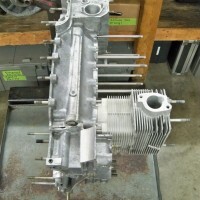 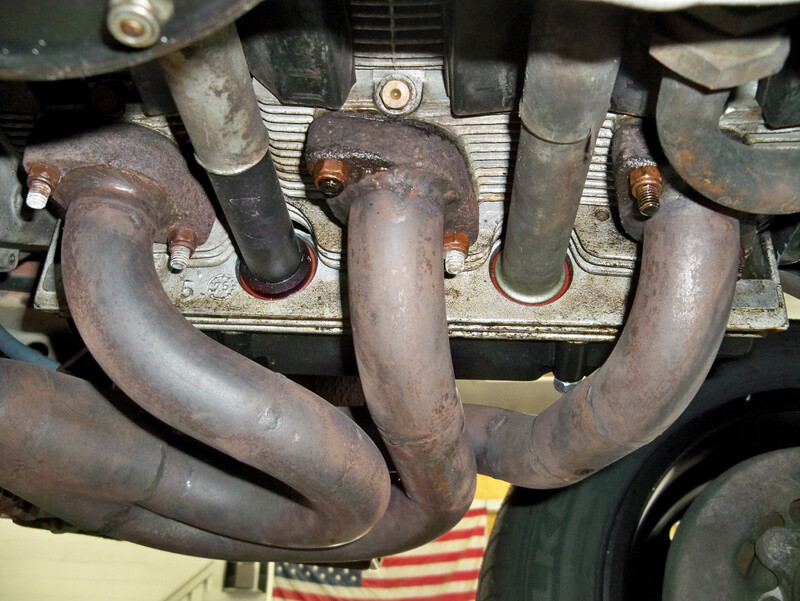 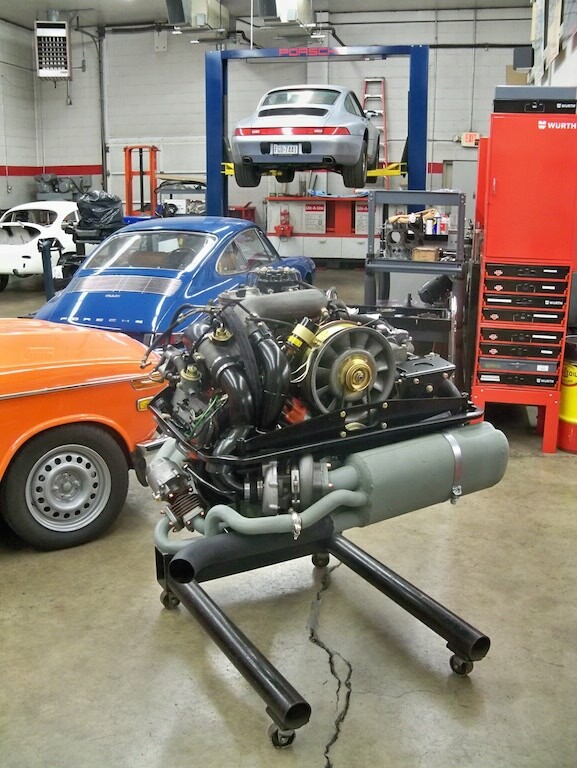 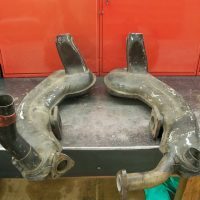 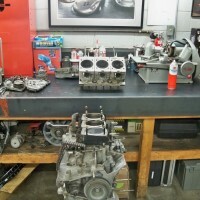 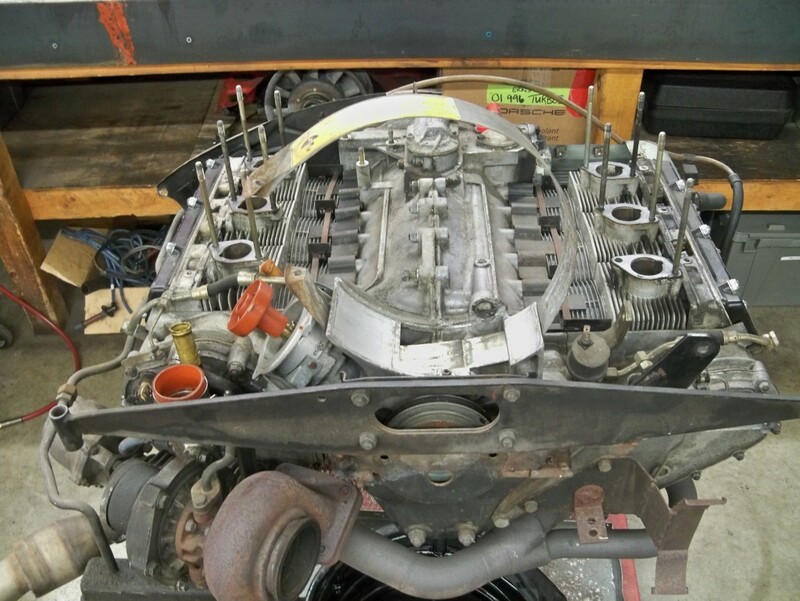 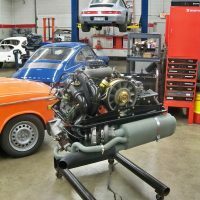 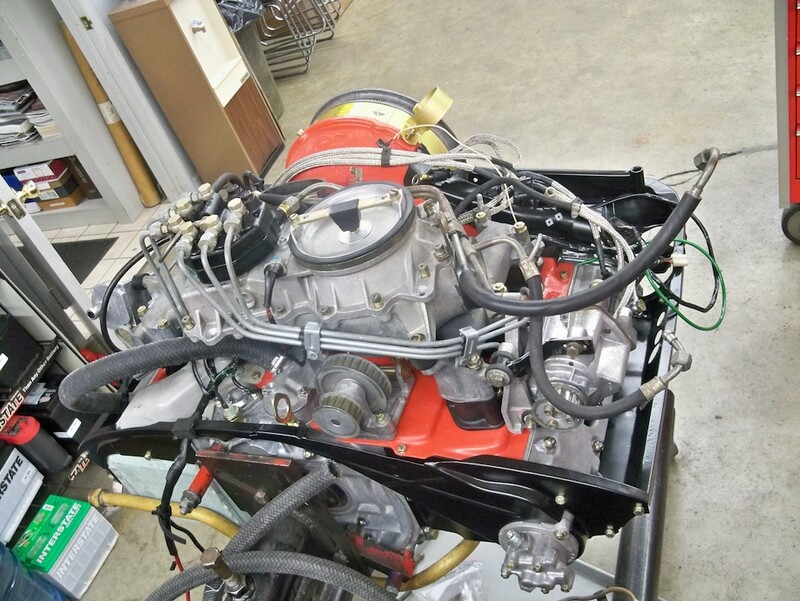 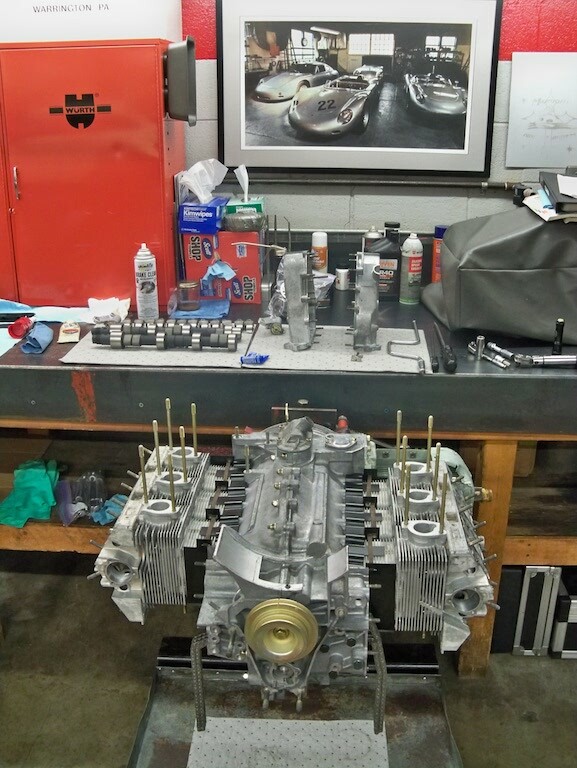 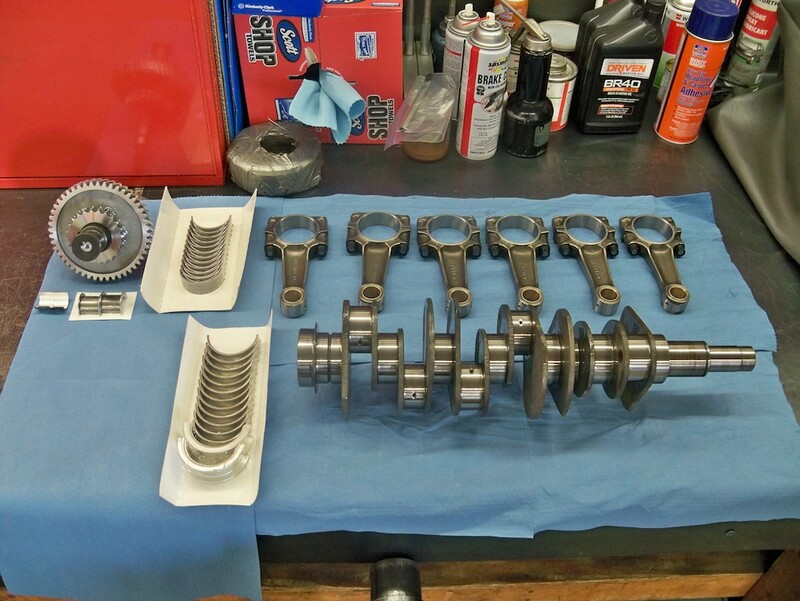 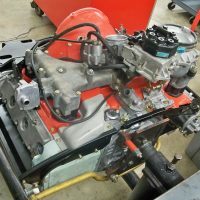 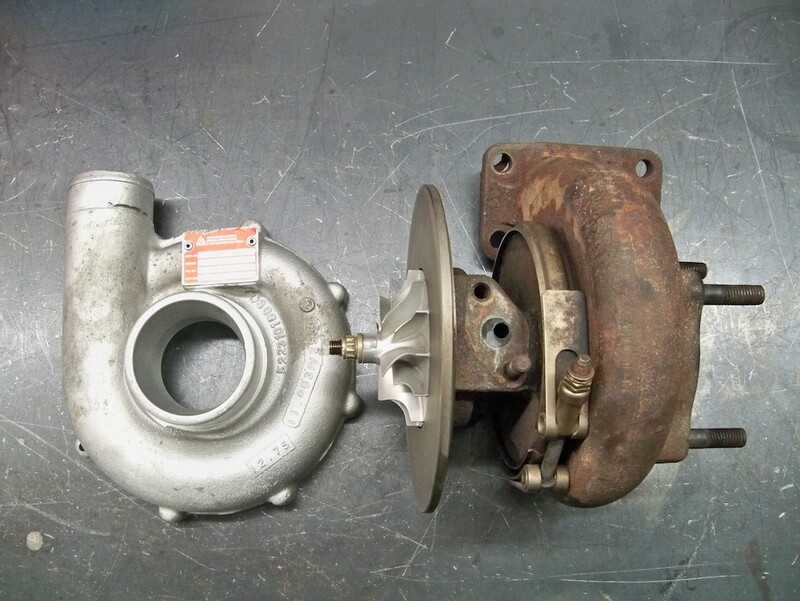 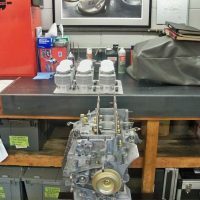 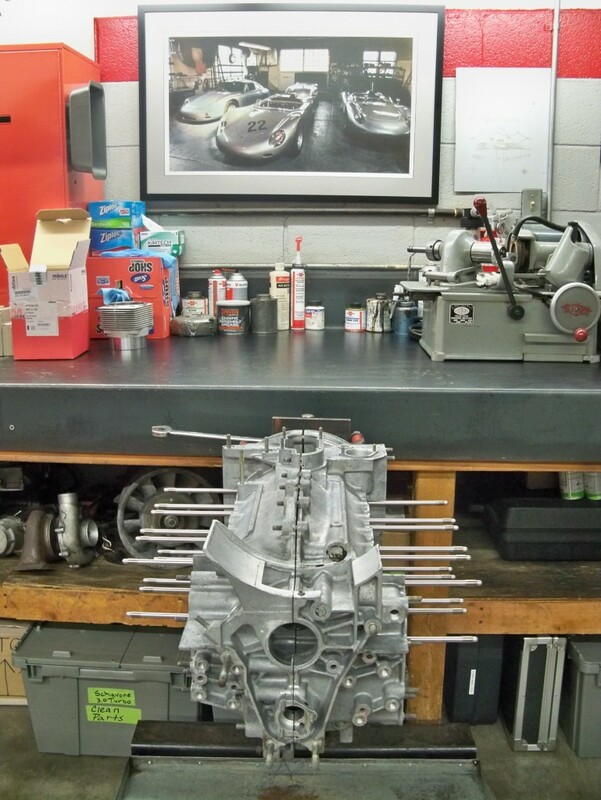 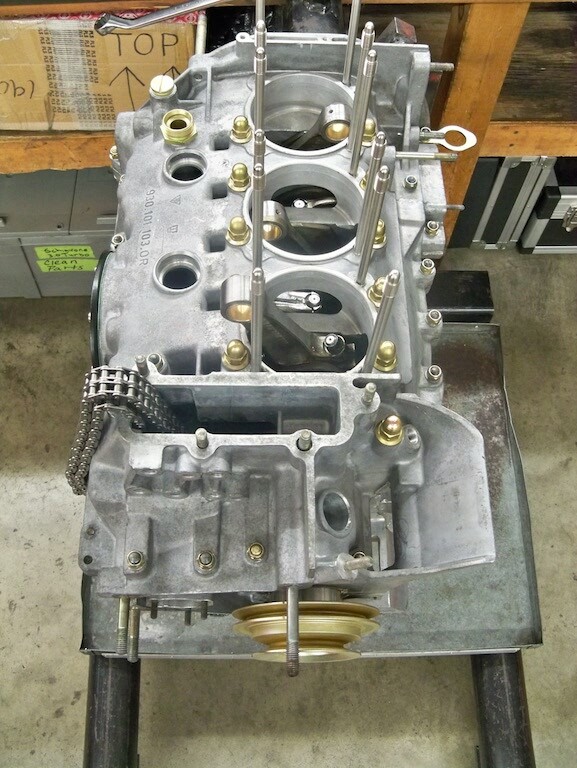 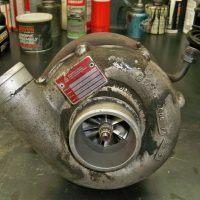 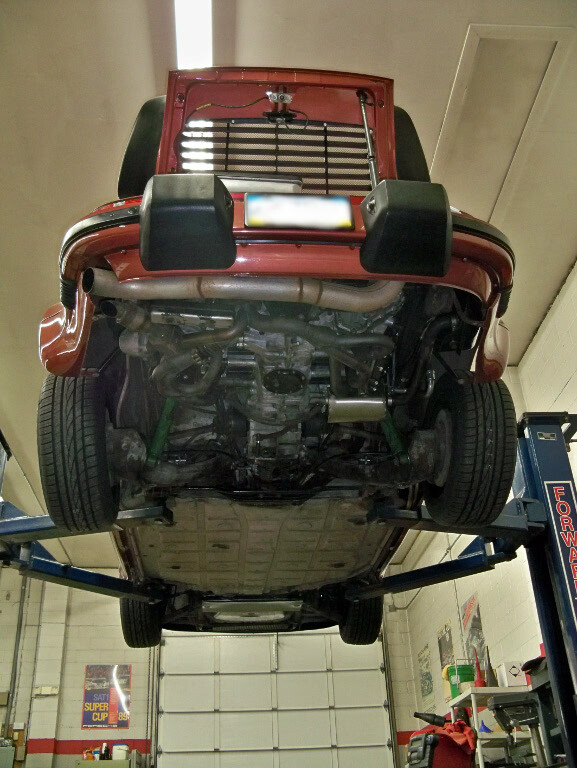 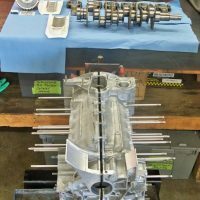 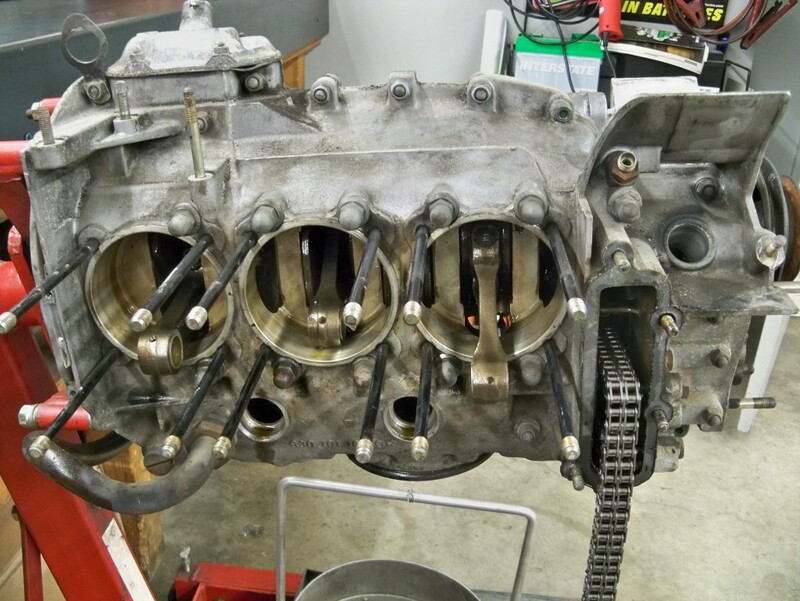 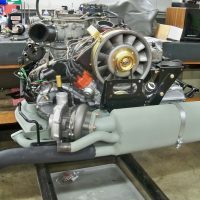 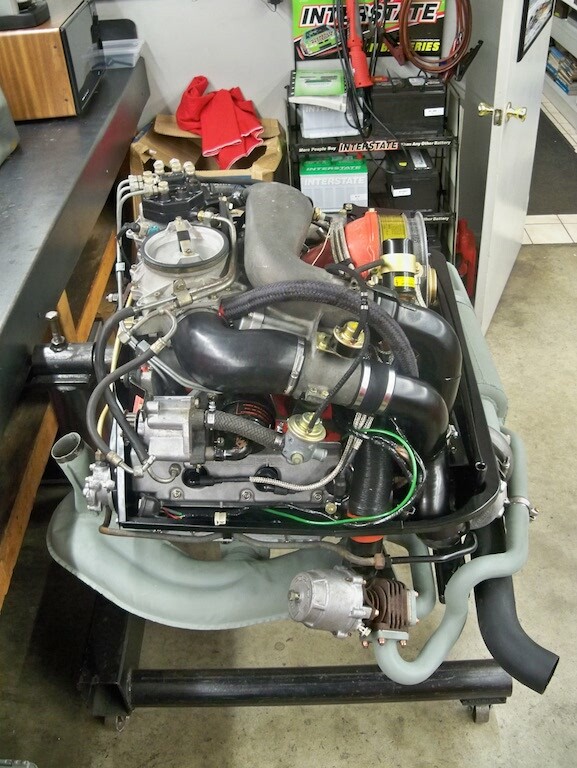 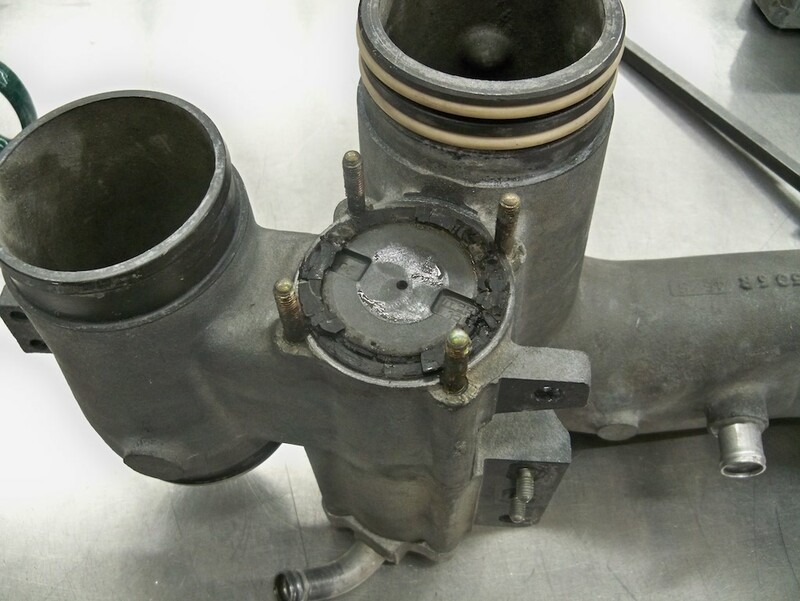 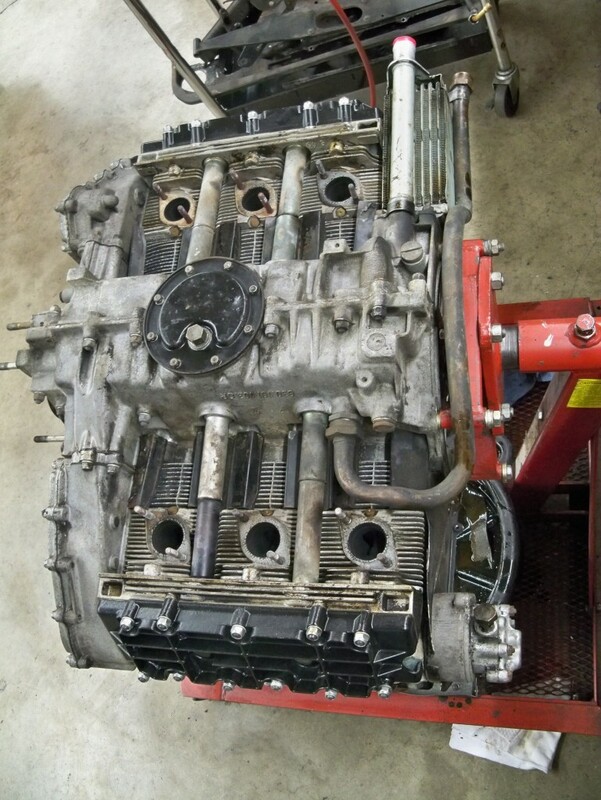 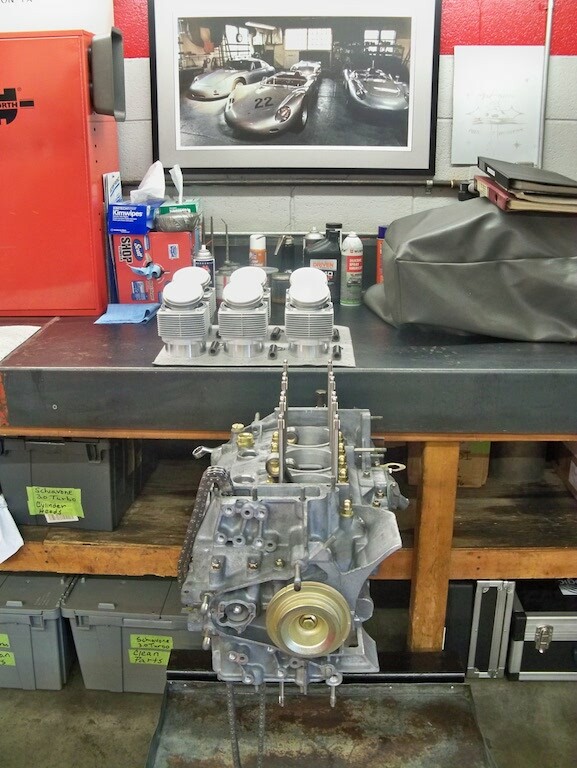 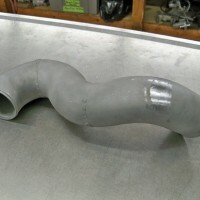 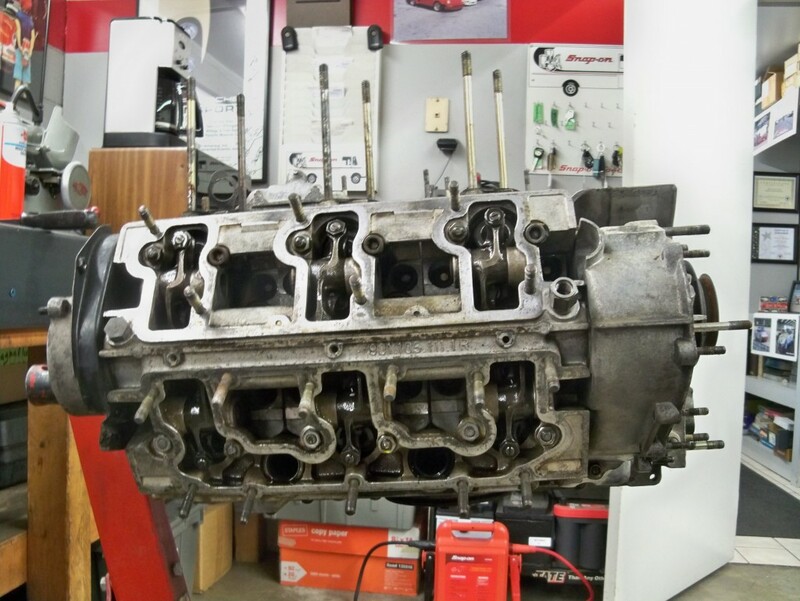 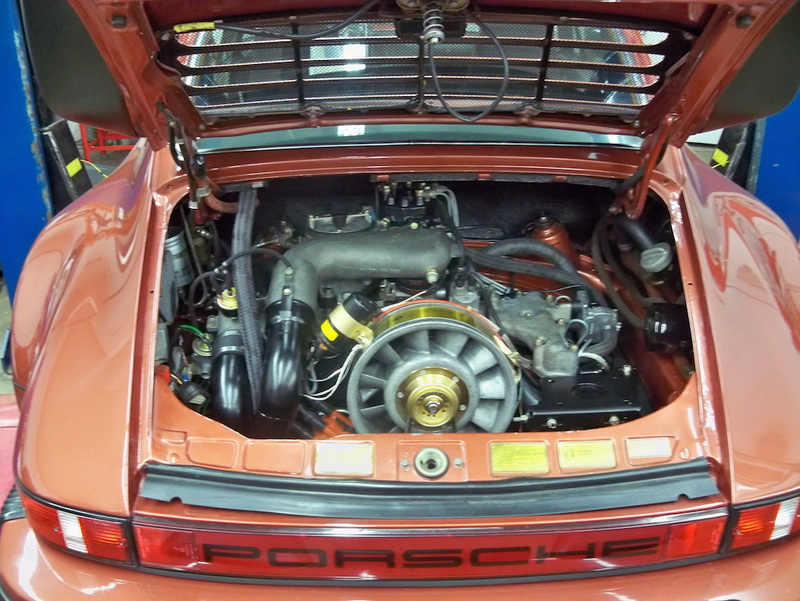 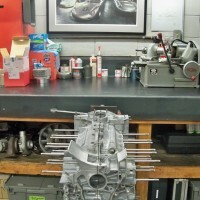 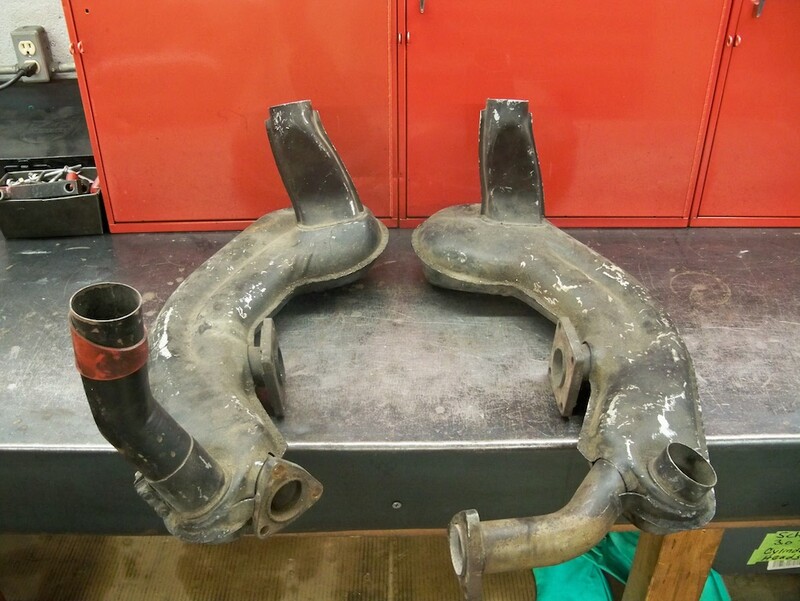 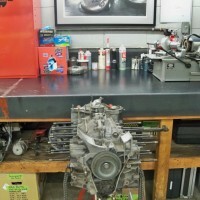 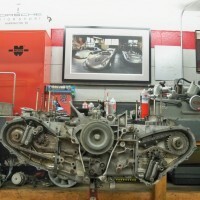 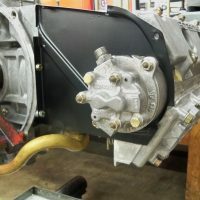 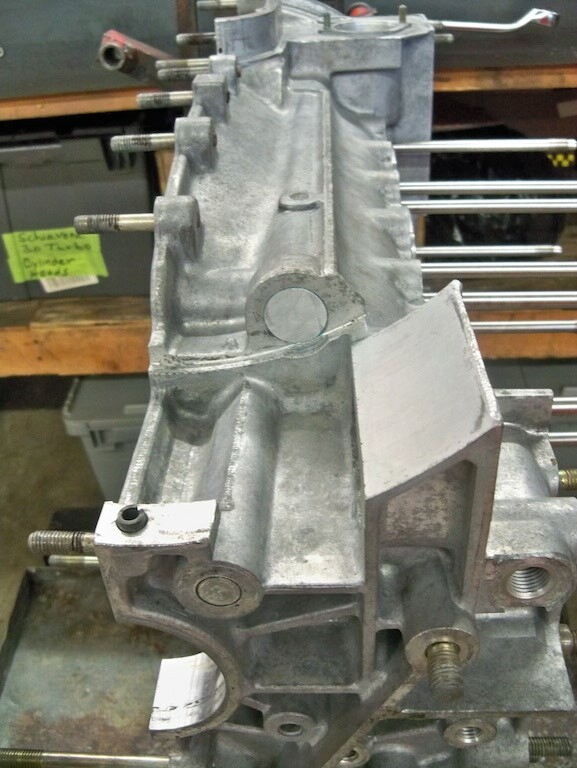 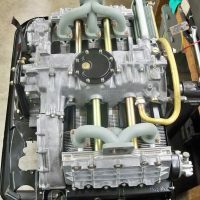 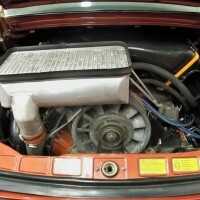 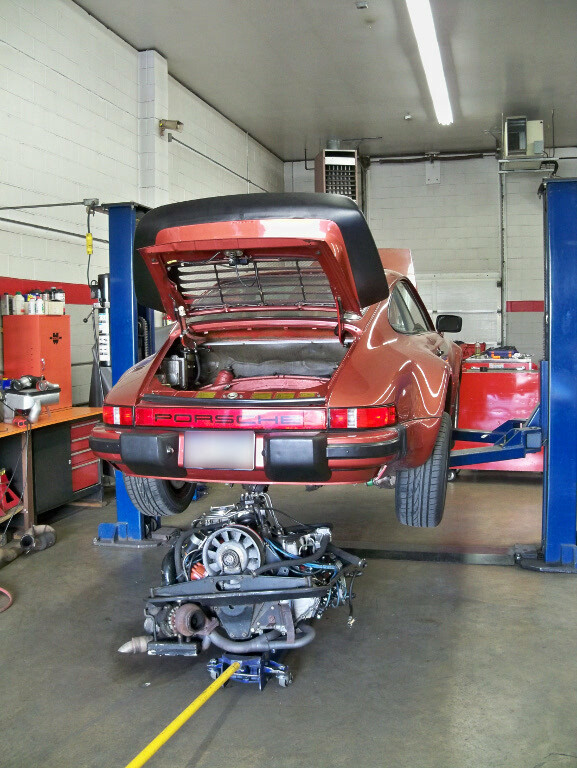 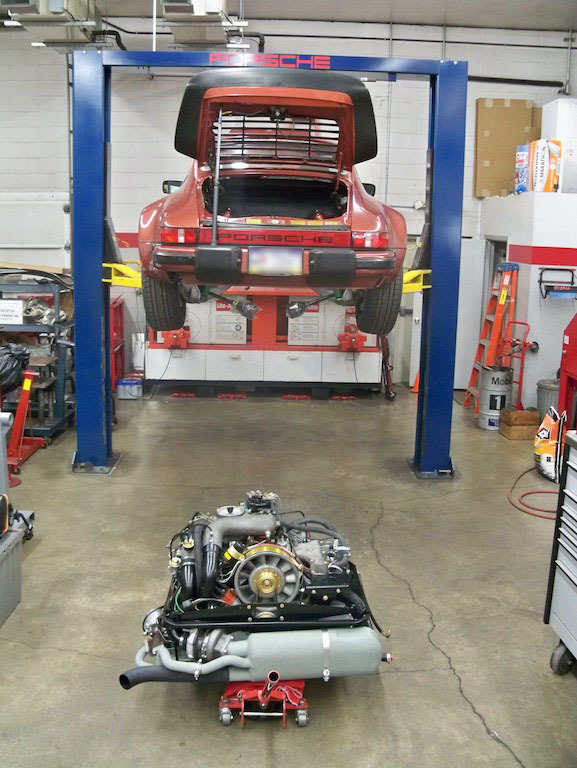 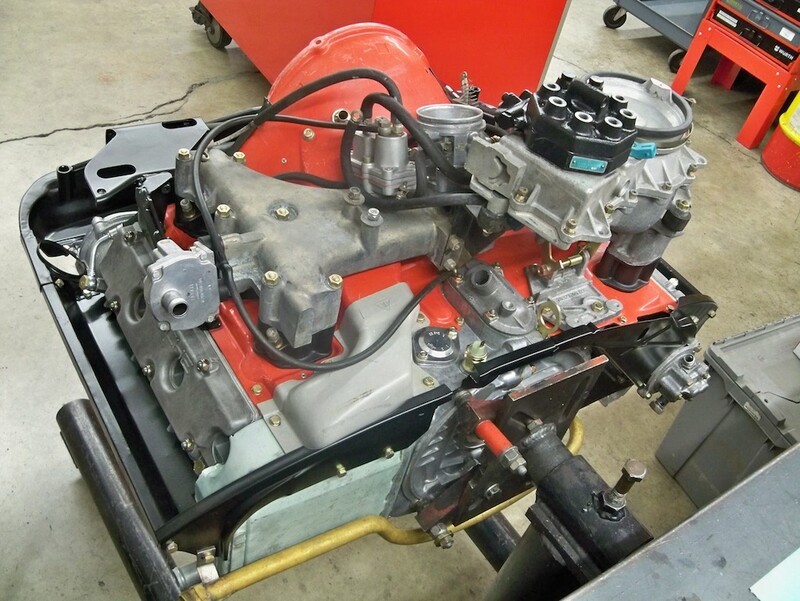 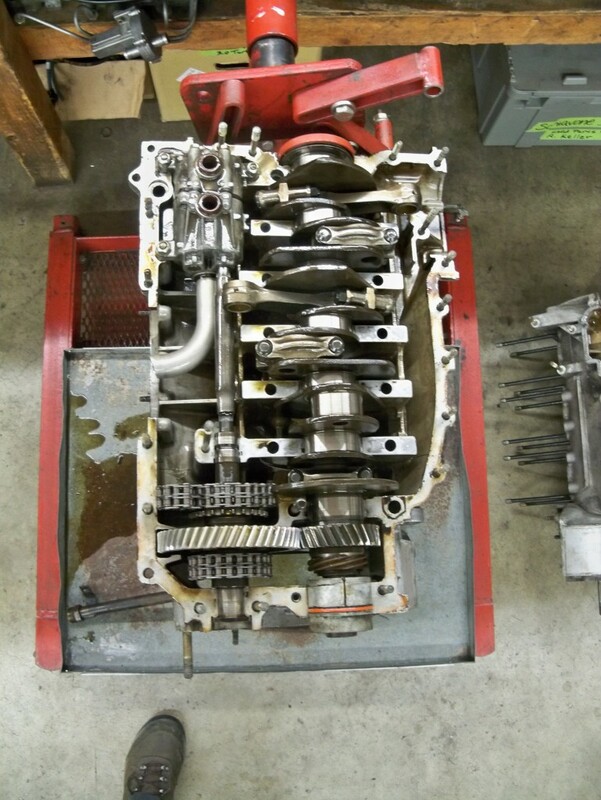 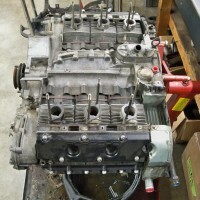 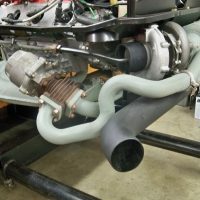 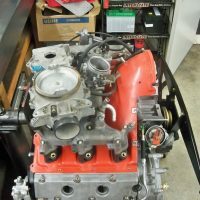 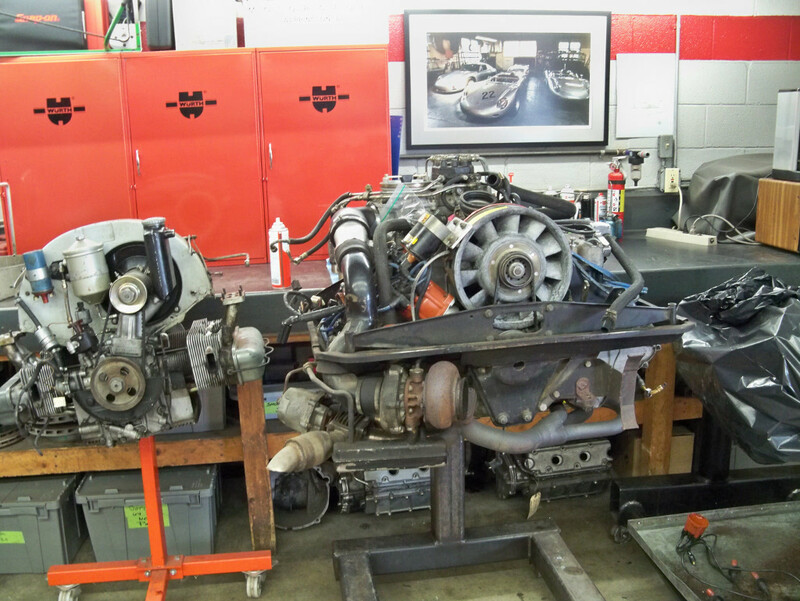 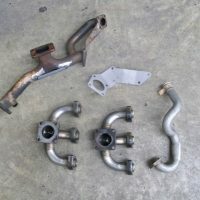 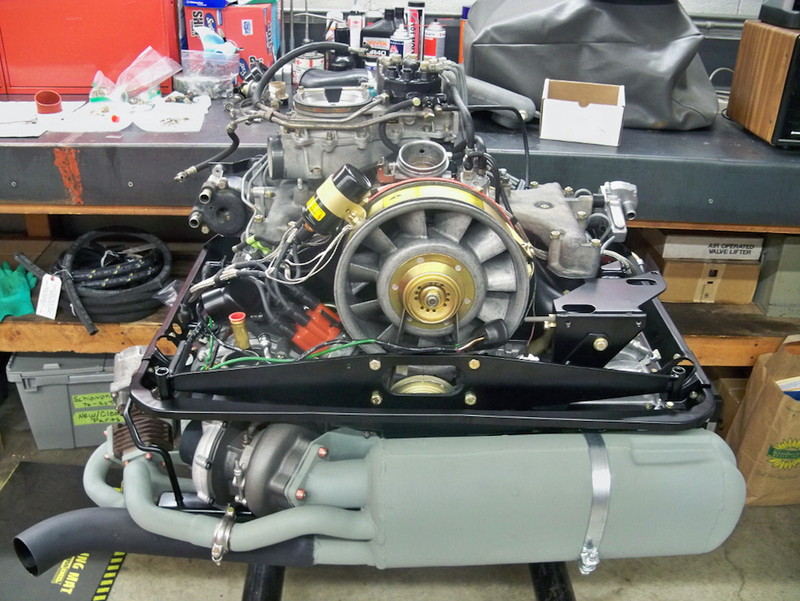 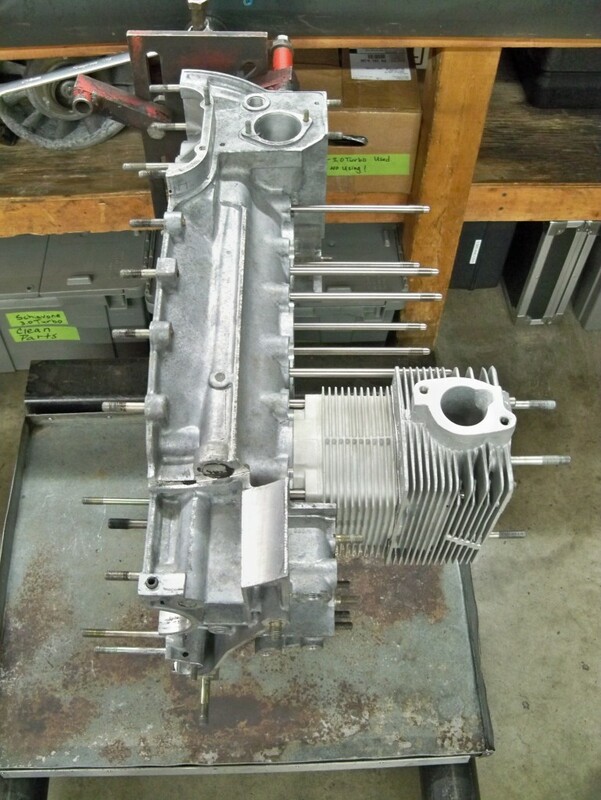 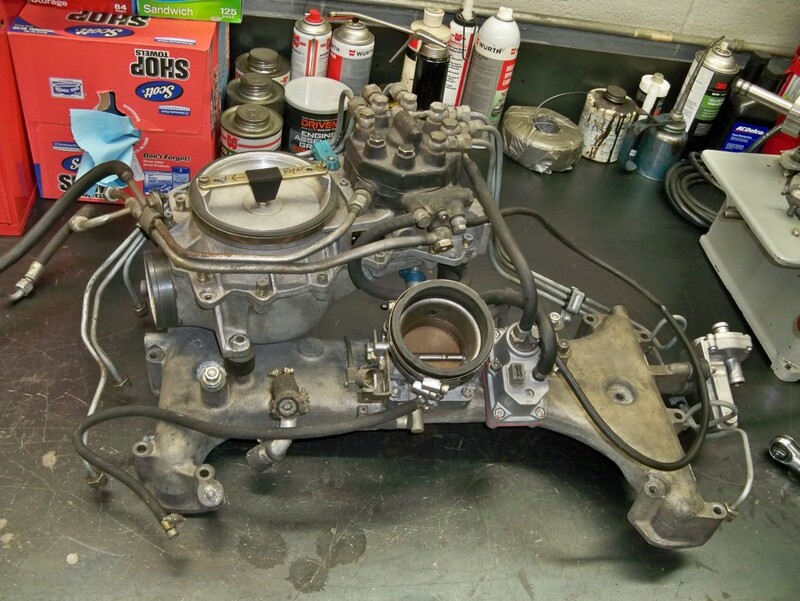 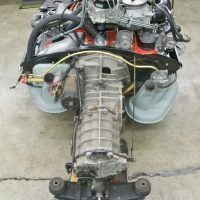 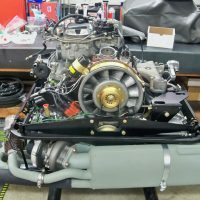 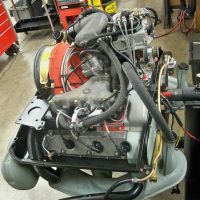 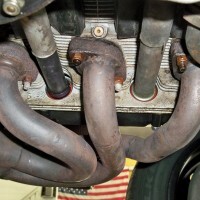 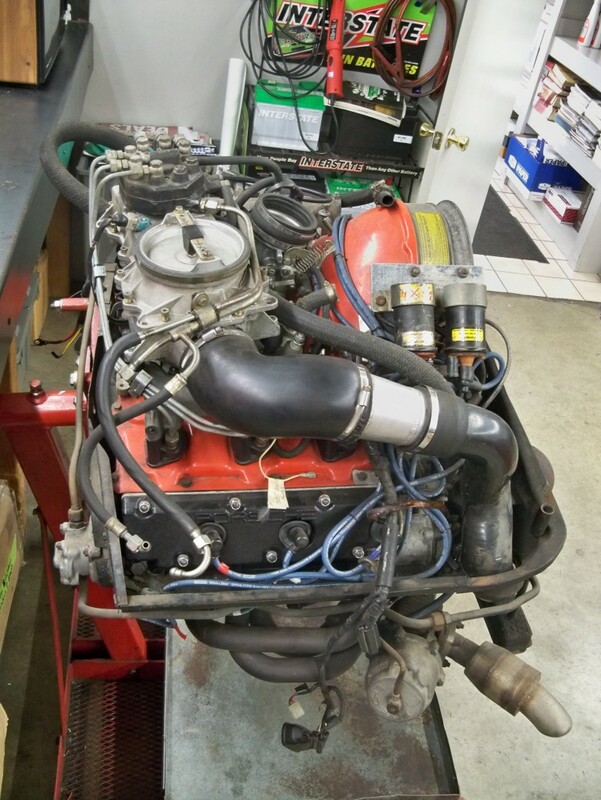 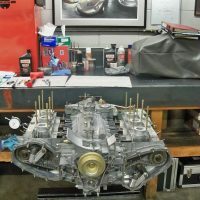 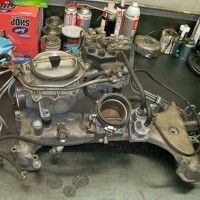 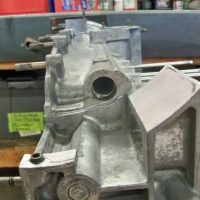 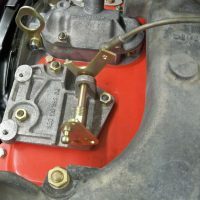 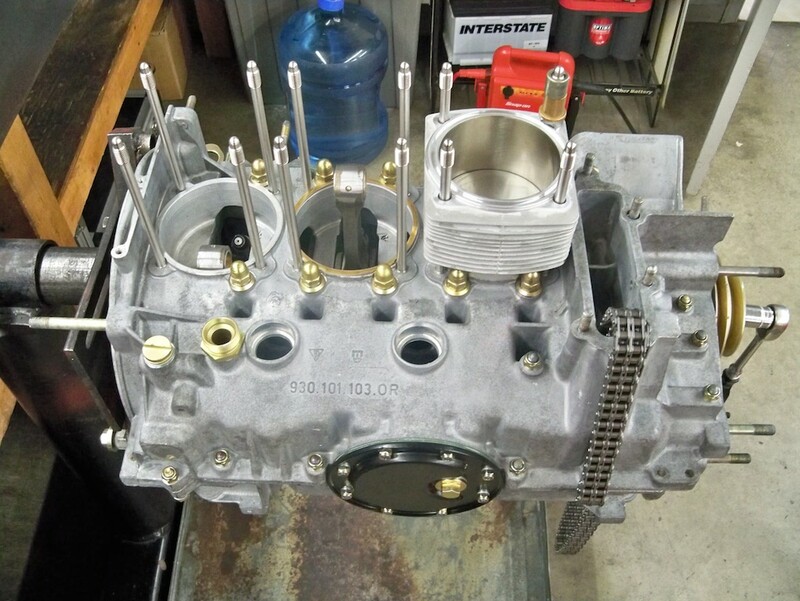 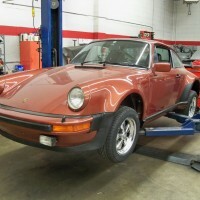 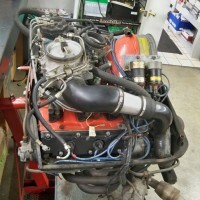 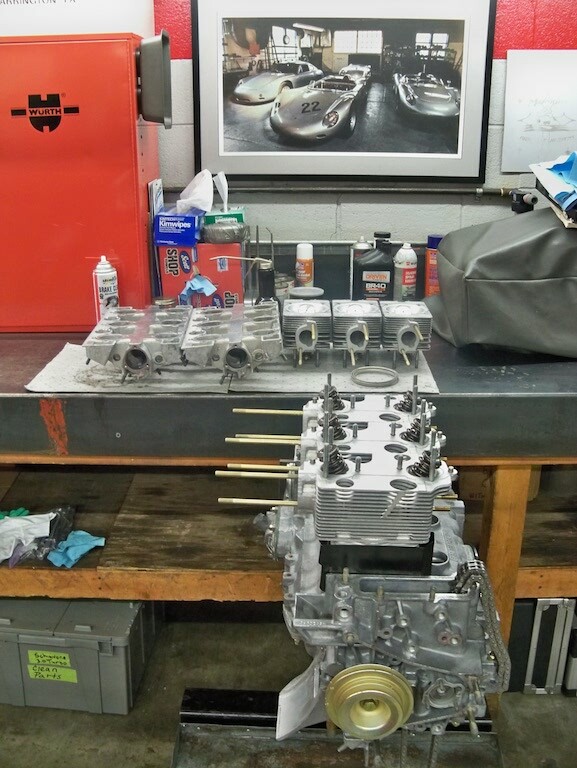 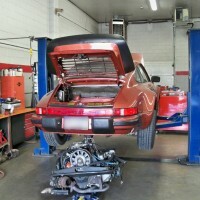 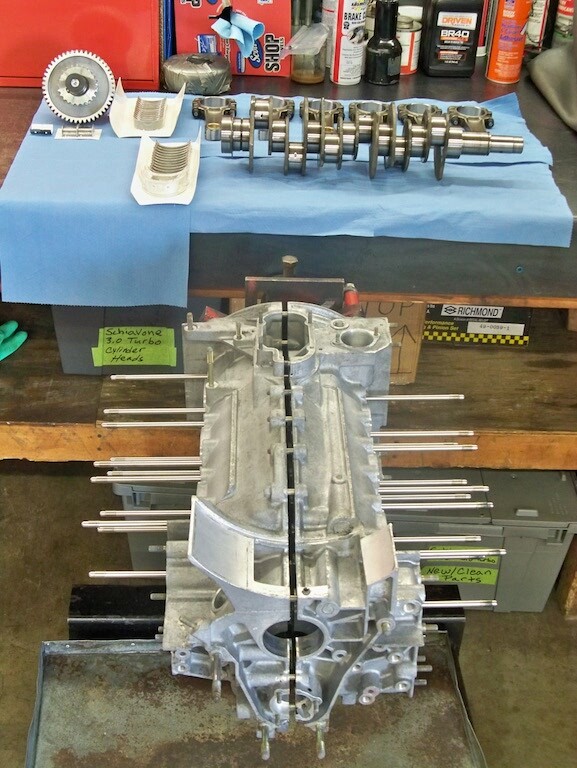 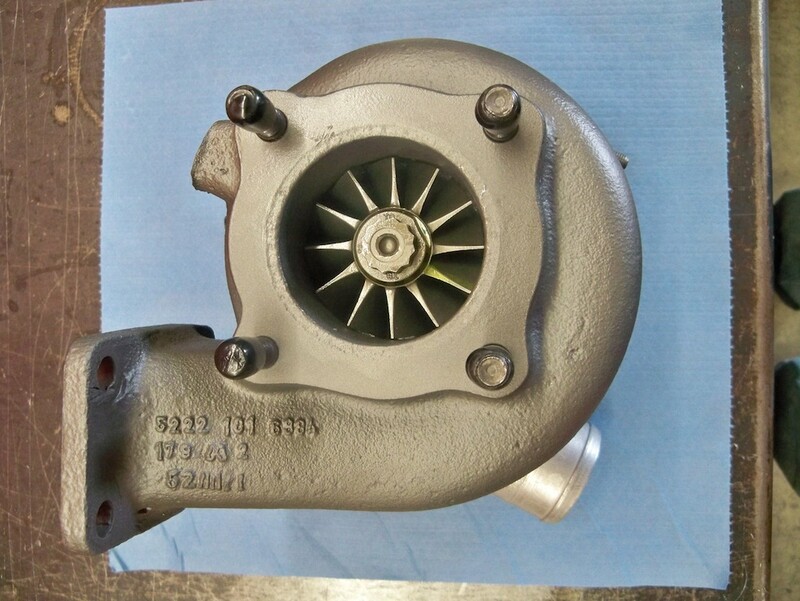 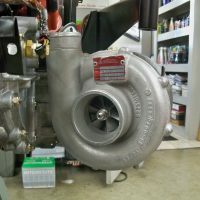 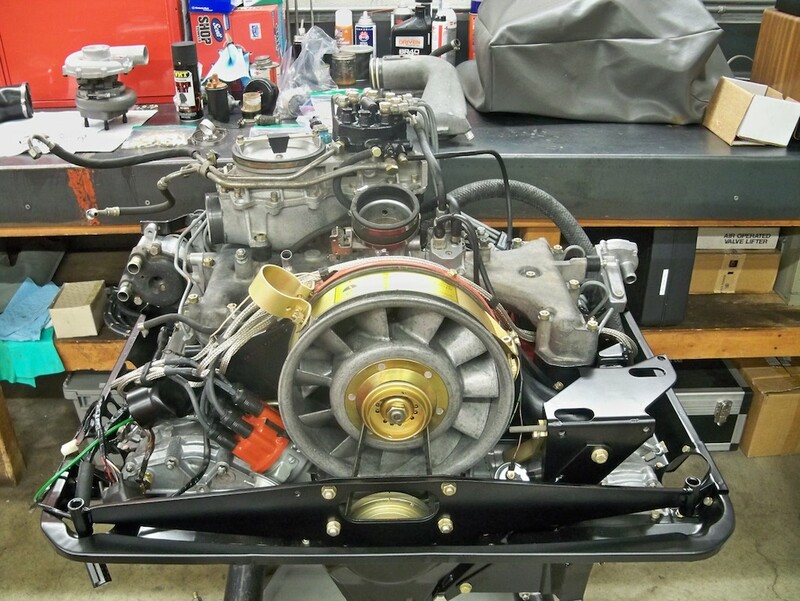 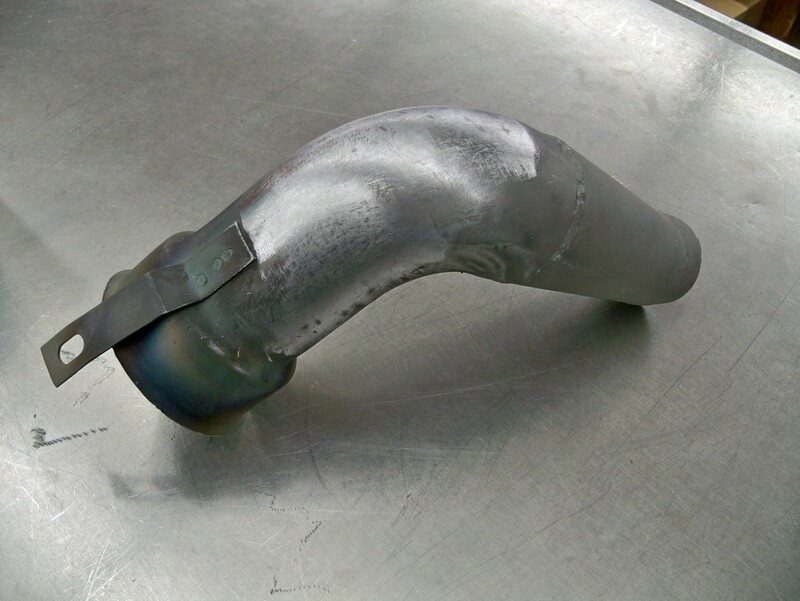 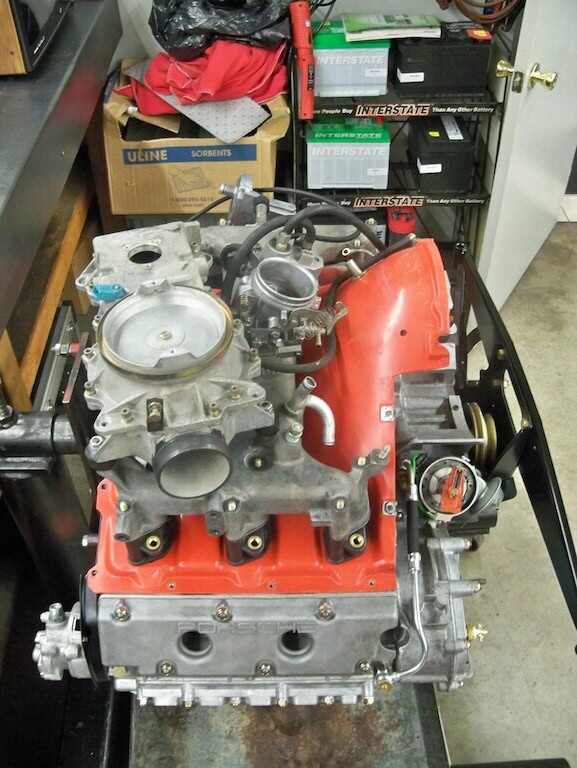 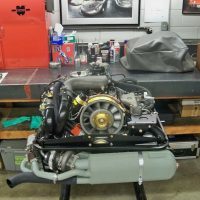 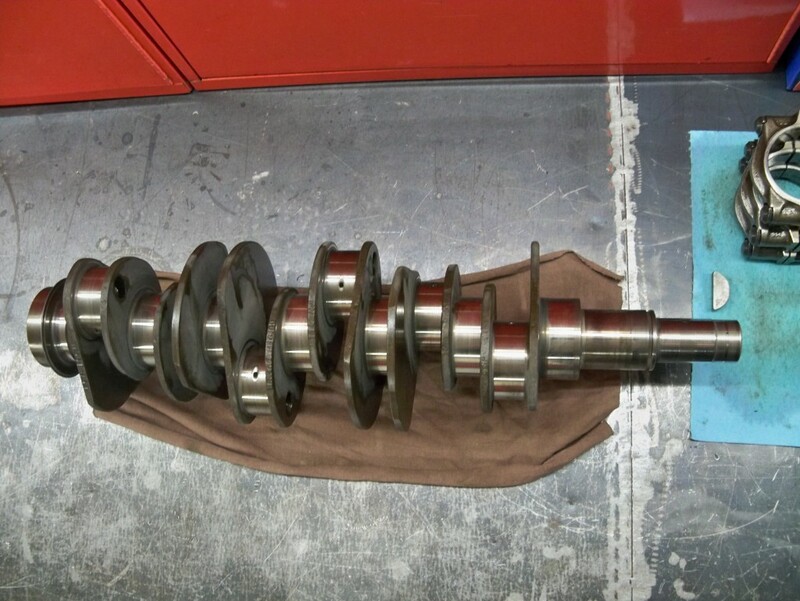 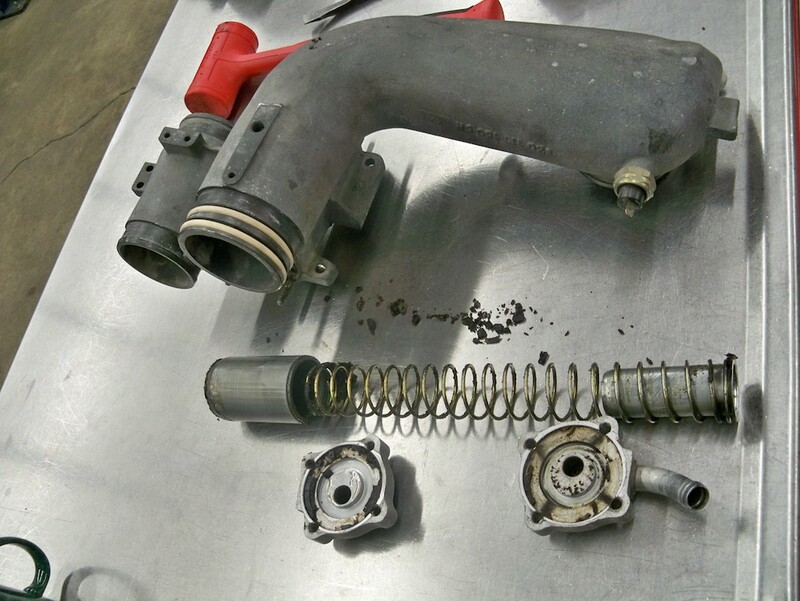 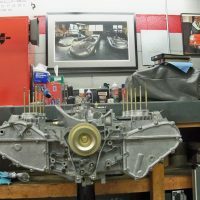 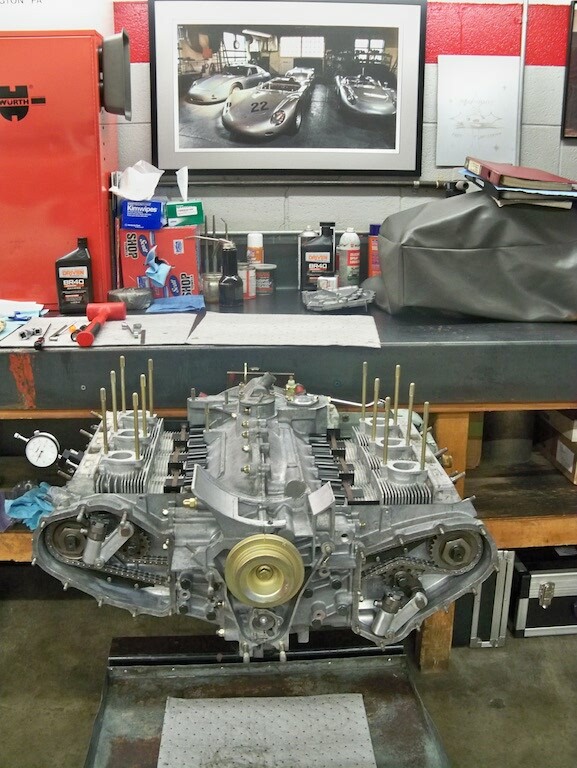 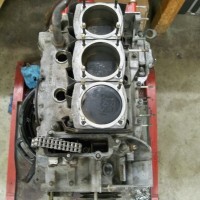 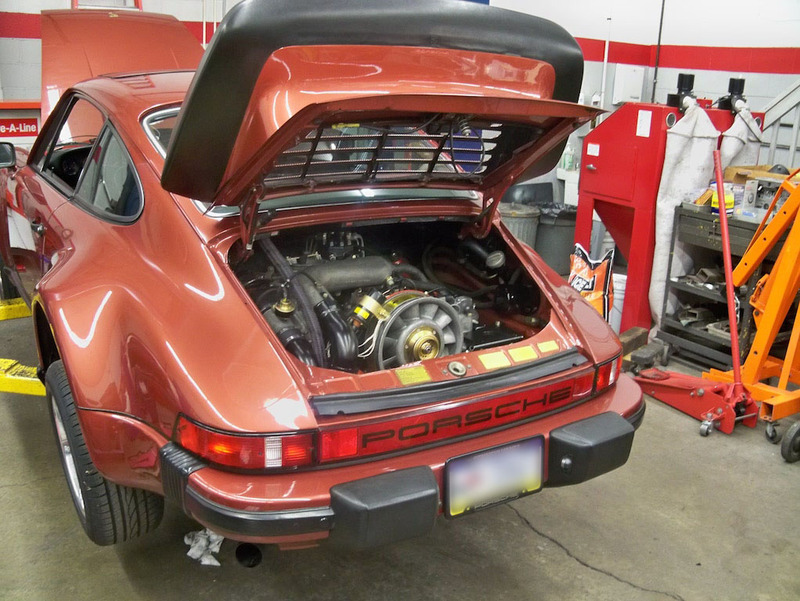 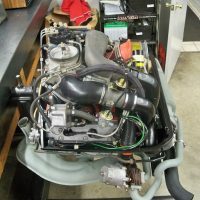 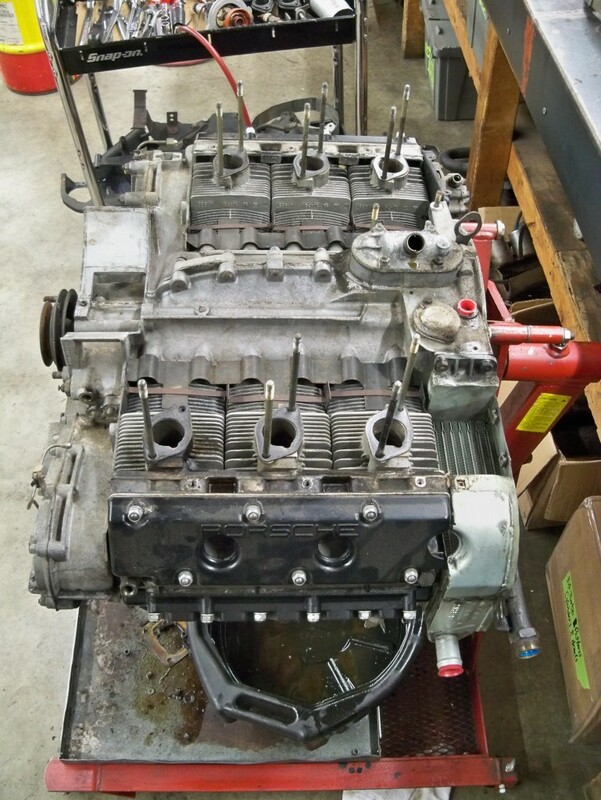 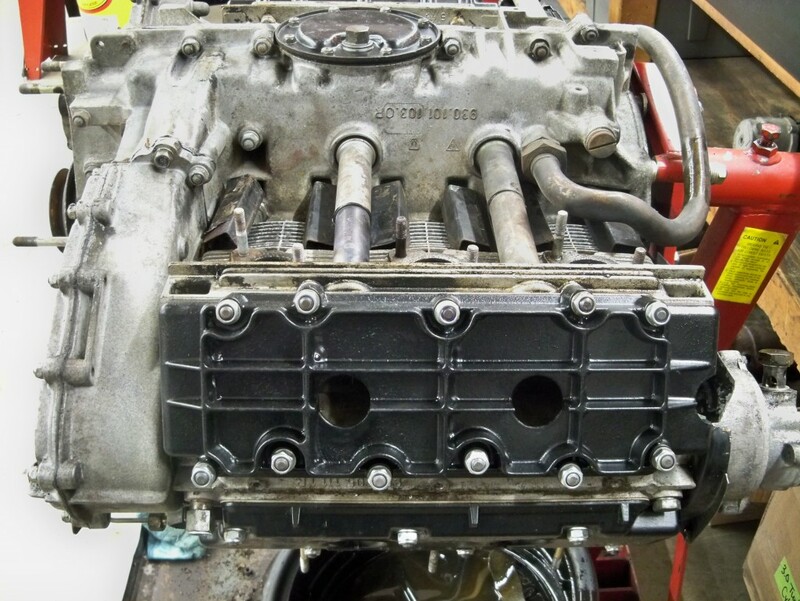 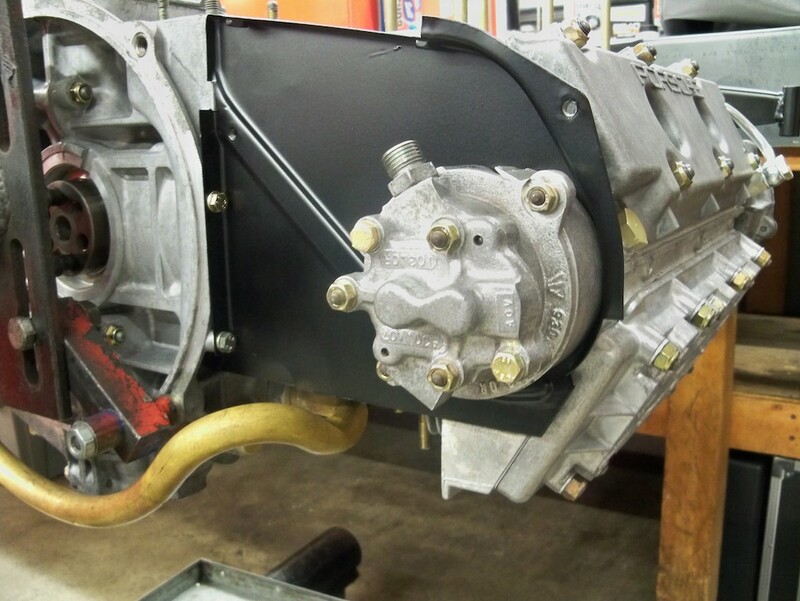 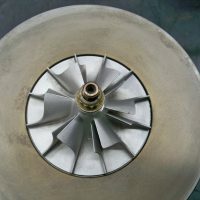 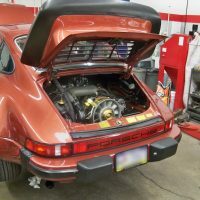 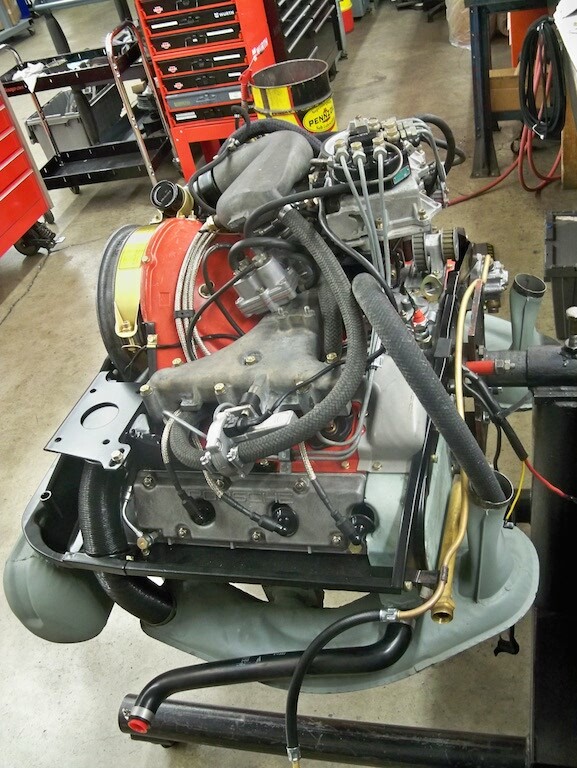 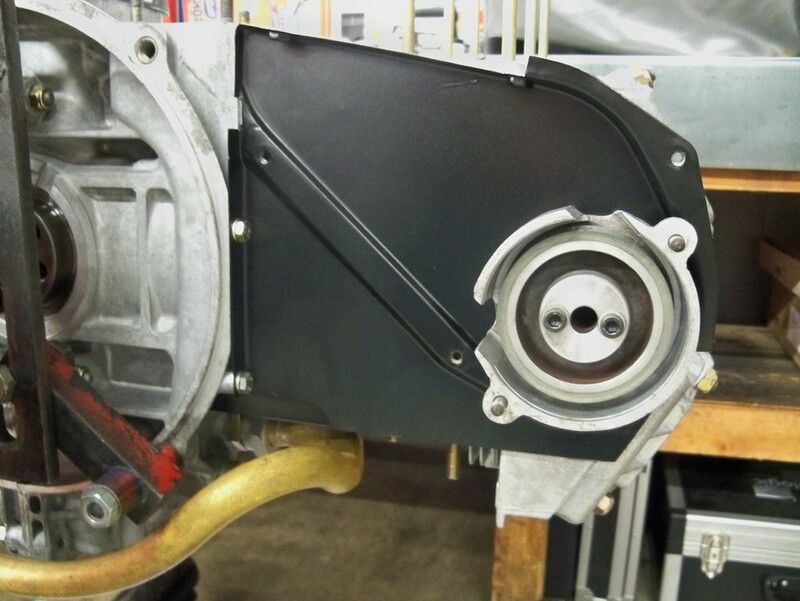 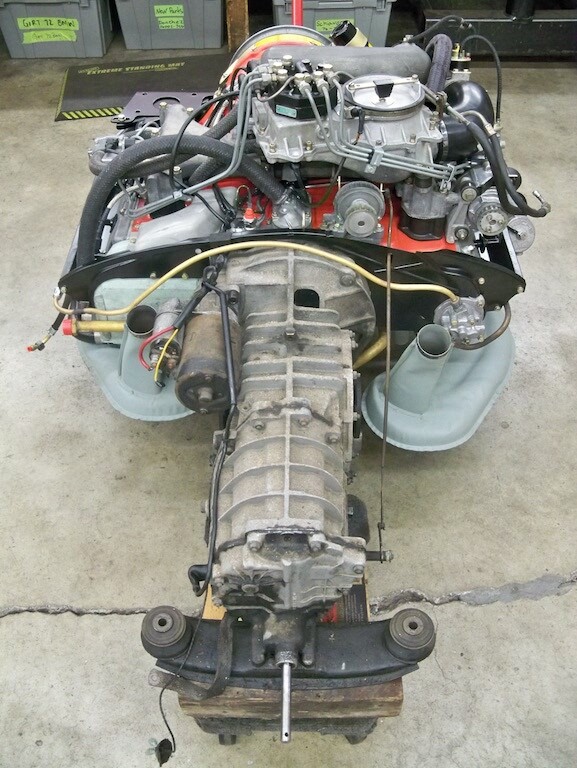 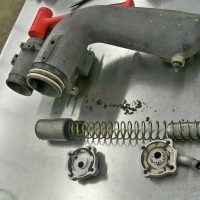 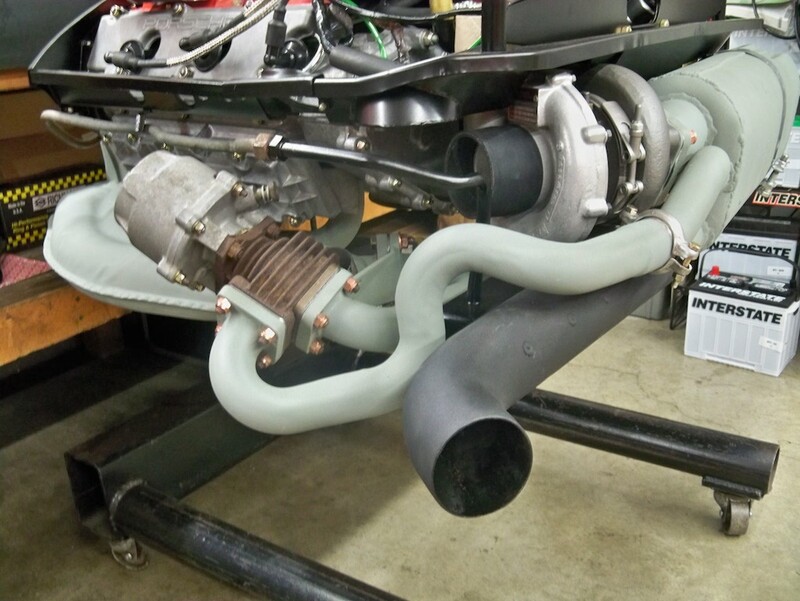 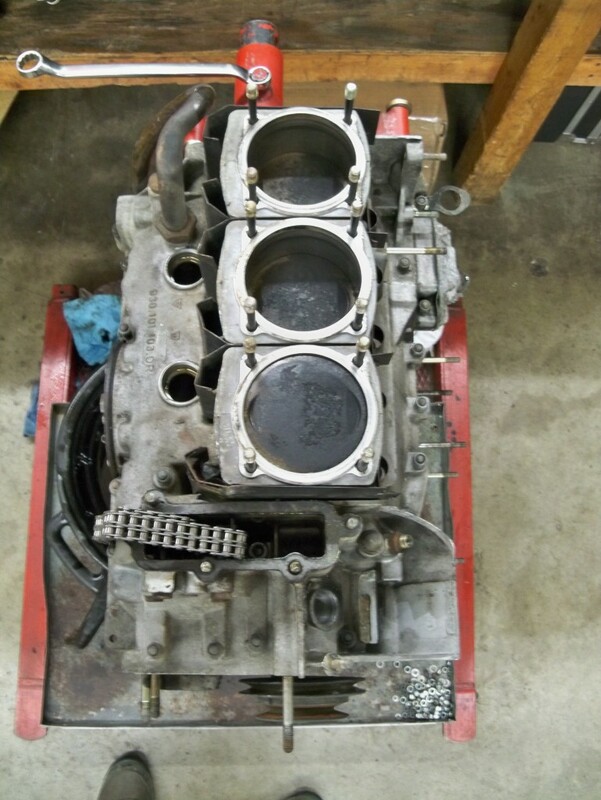 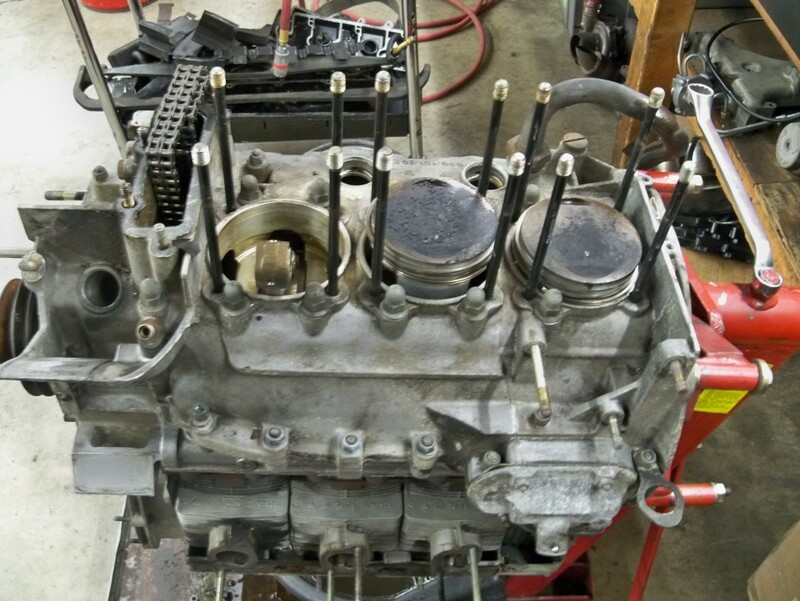 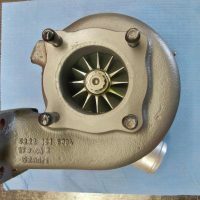 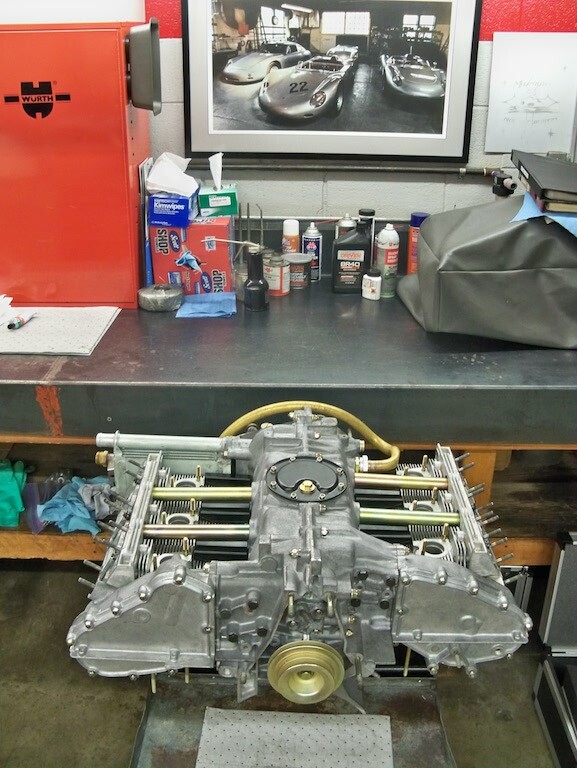 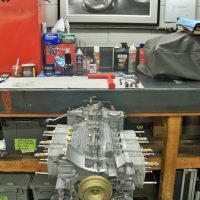 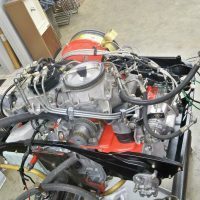 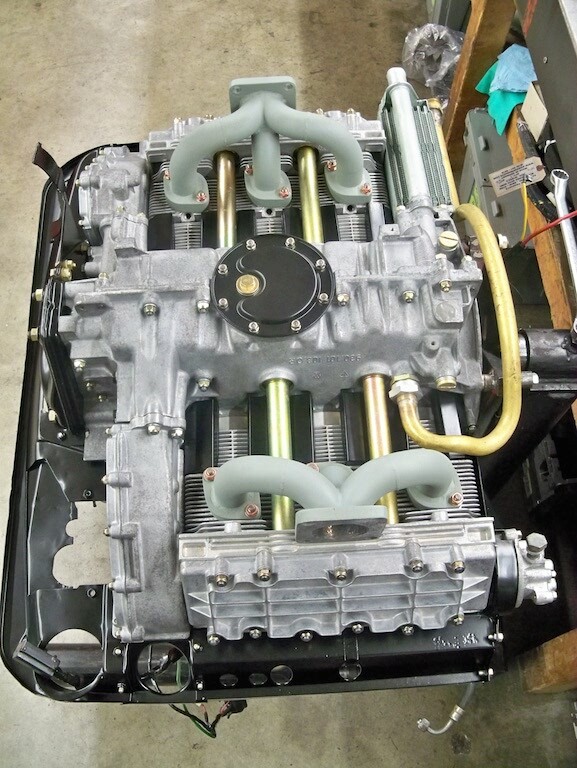 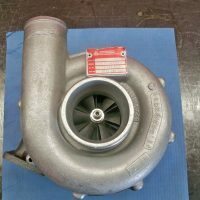 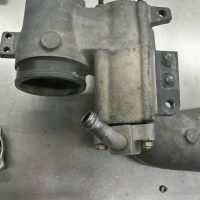 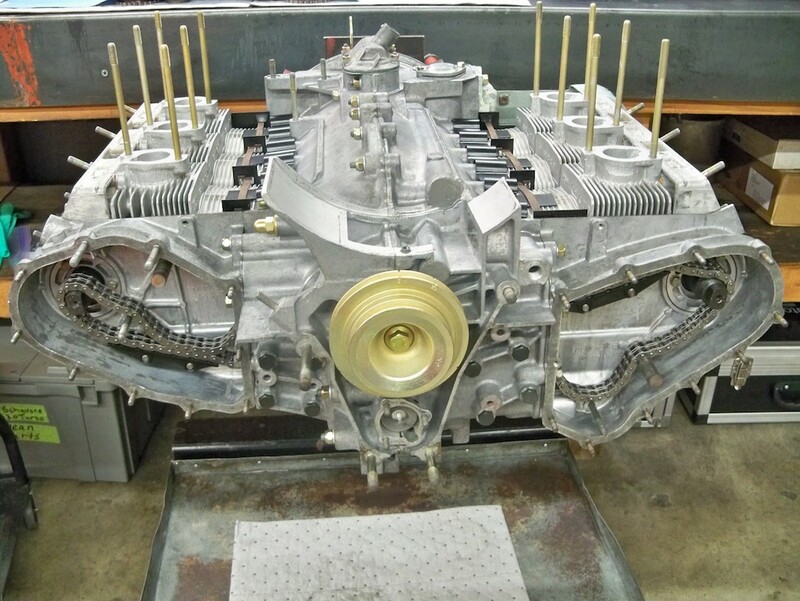 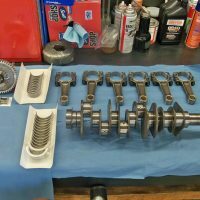 1976 Turbo Carrera Engine Build » Specialty Cars Service Center, Inc. 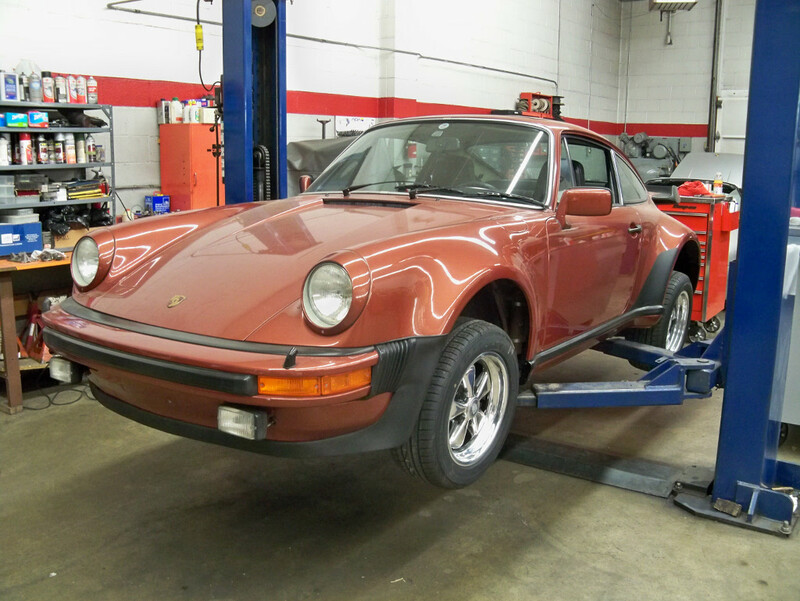 This 1976 Turbo Carrera has its original engine, however it was previously modified to a 3.2 twin plug. 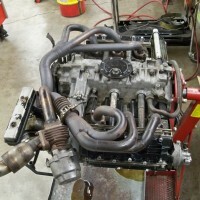 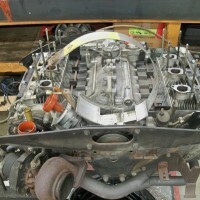 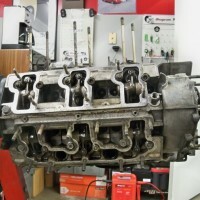 We have converted the engine back to its original 3.0L displacement. 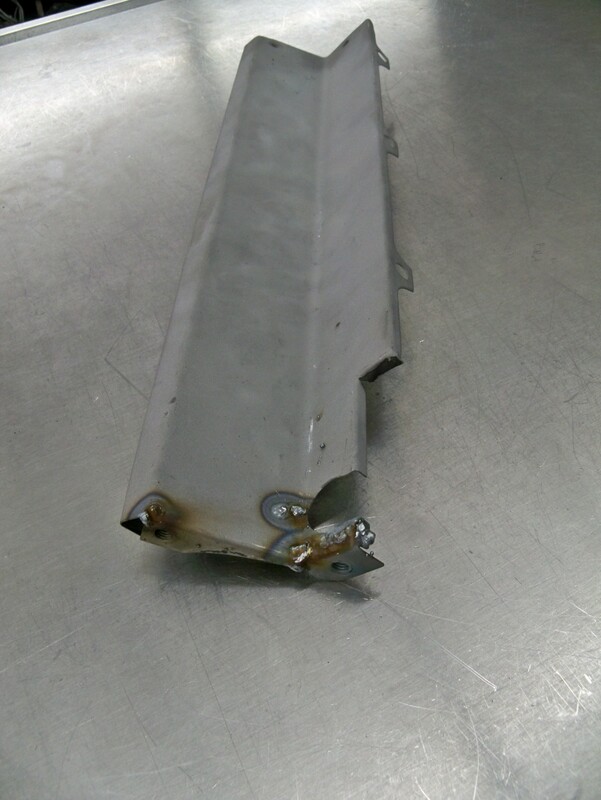 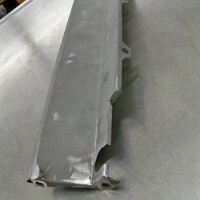 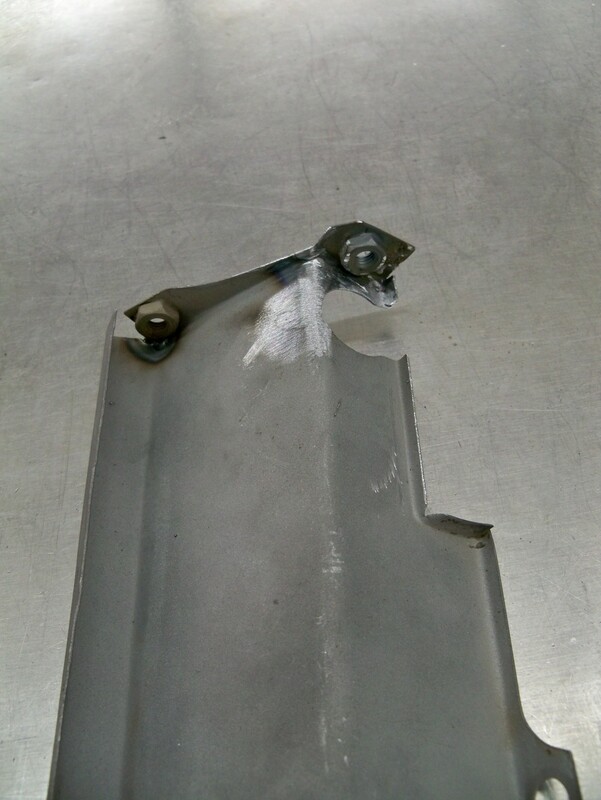 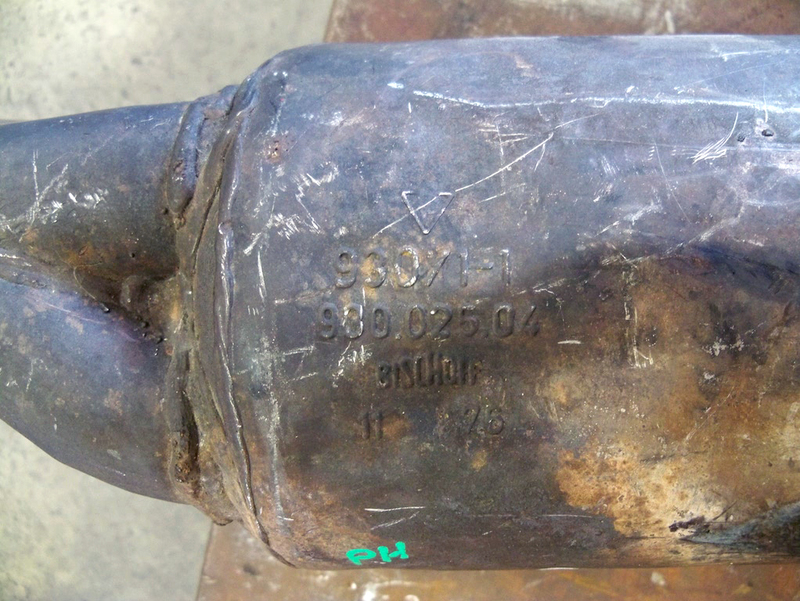 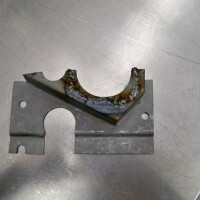 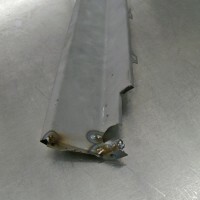 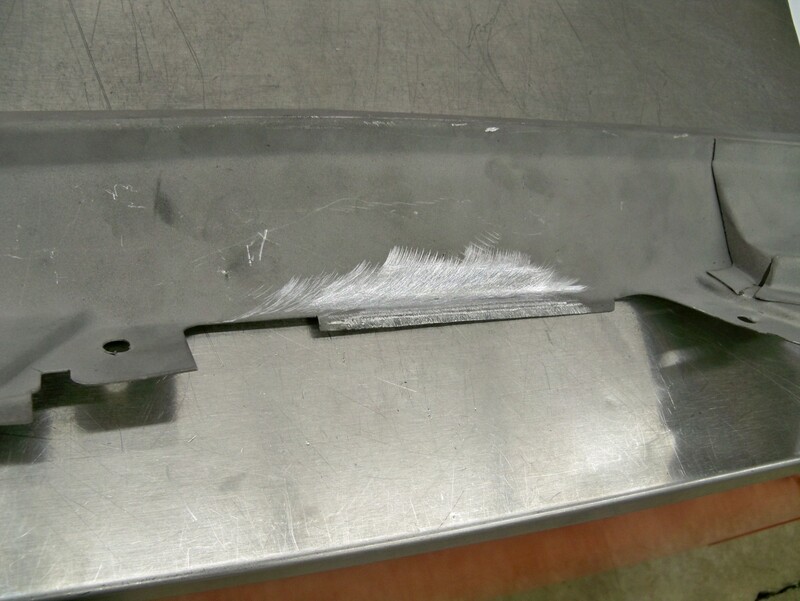 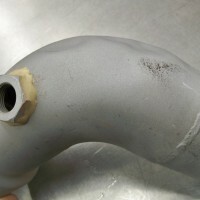 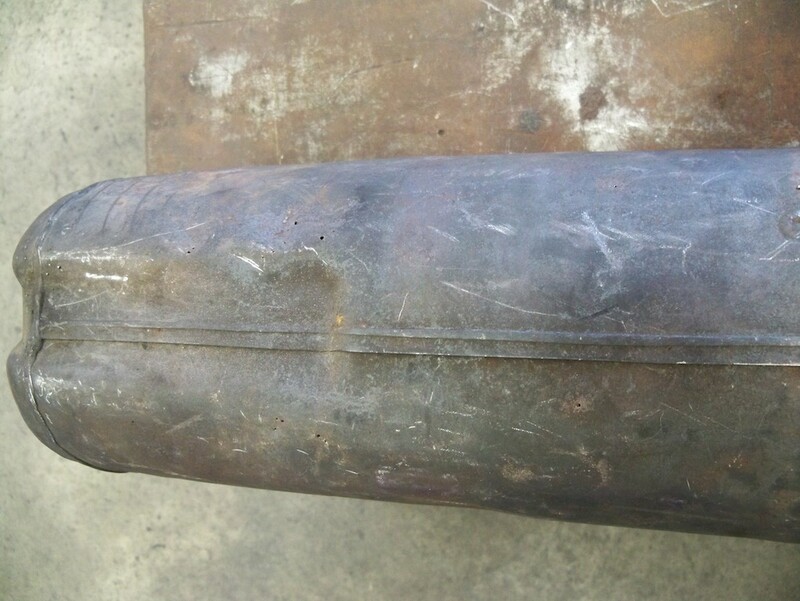 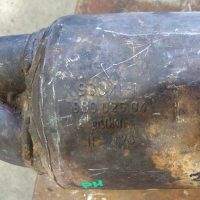 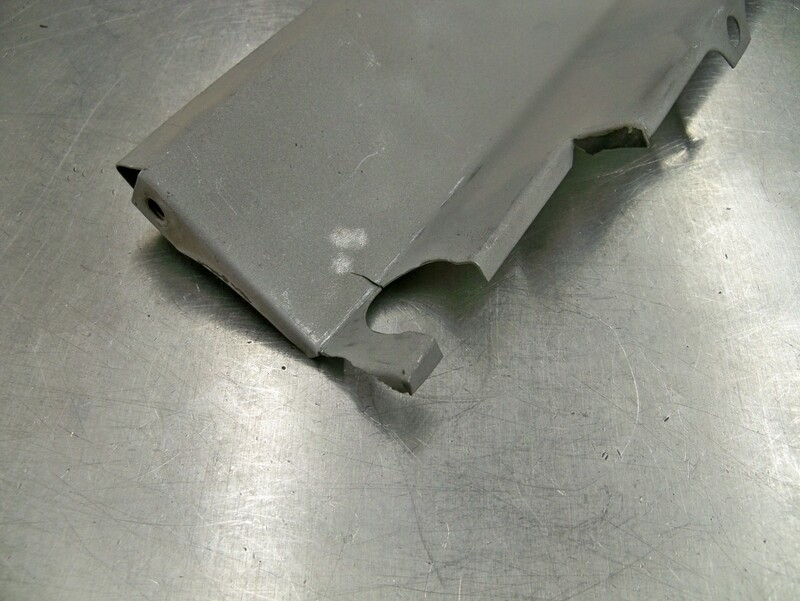 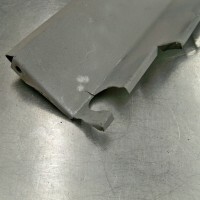 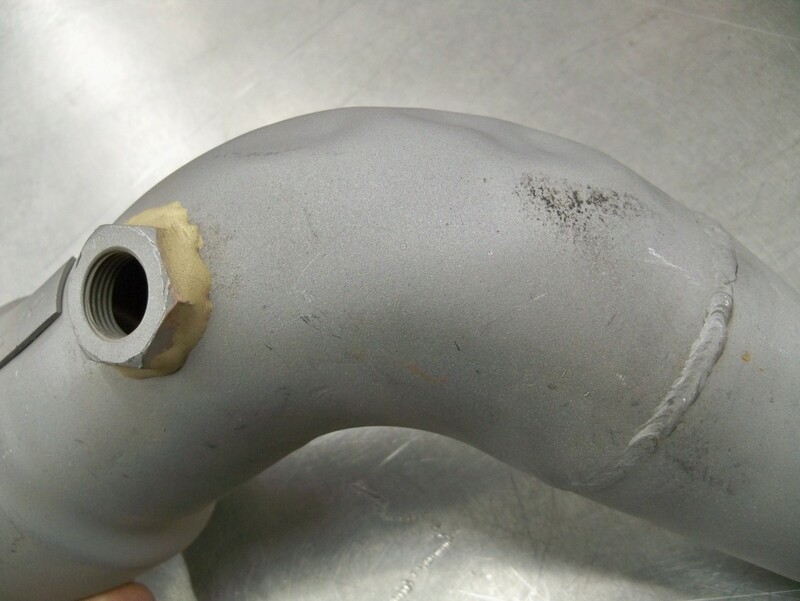 This was not a good idea for the heat exchanger. 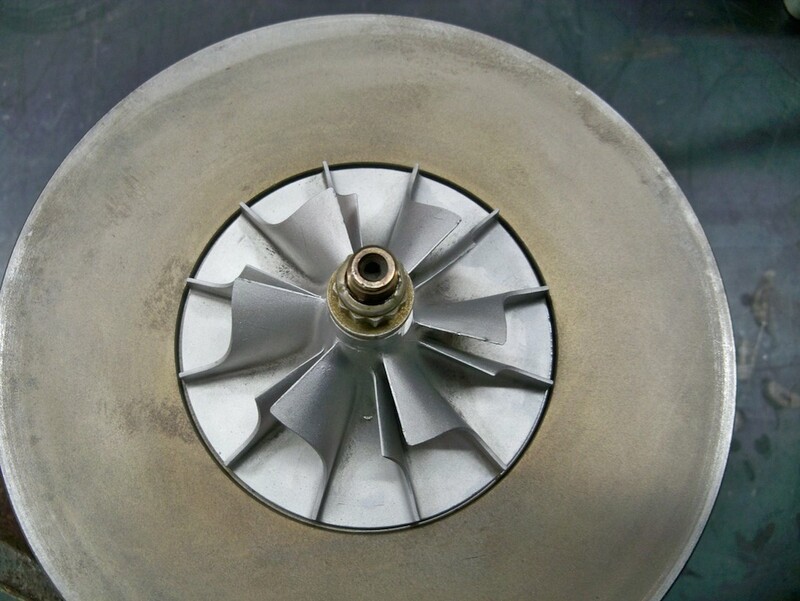 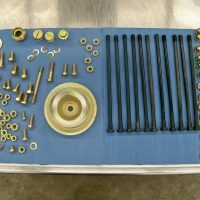 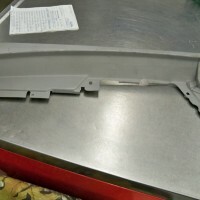 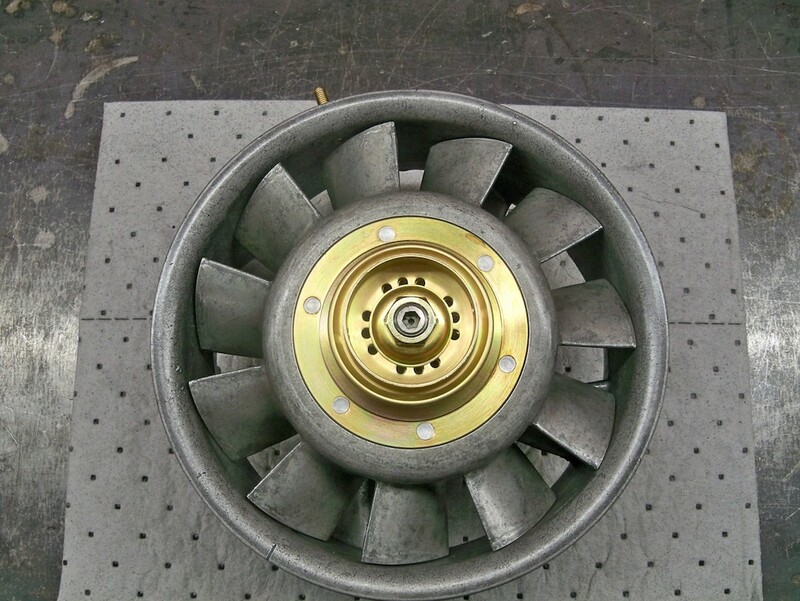 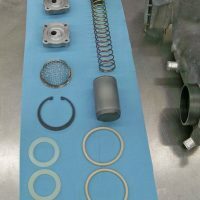 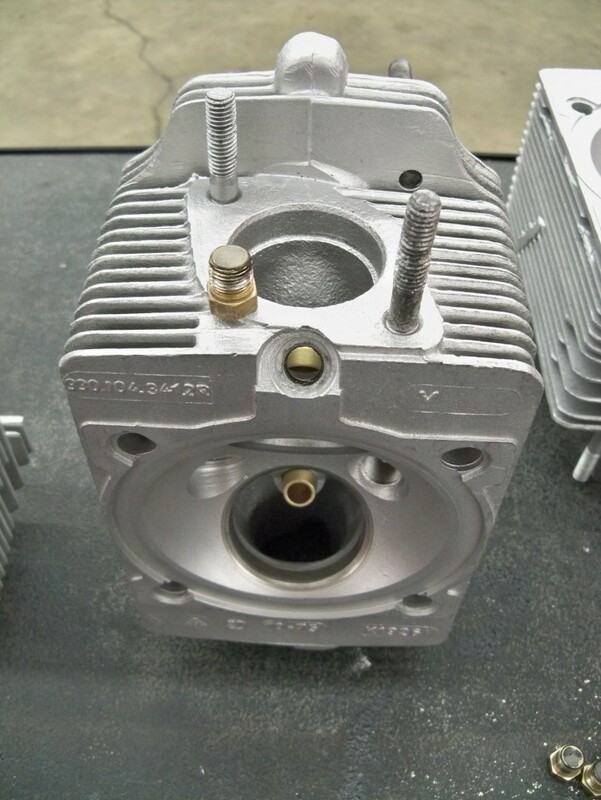 It restricts airflow over the oil cooler and does not allow heat to dissipate as it should; therefore increasing the oil temperature. 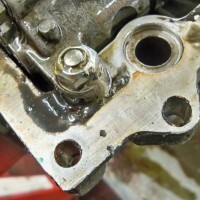 This will not be reinstalled. 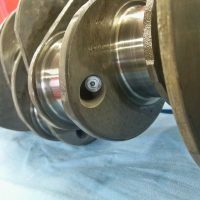 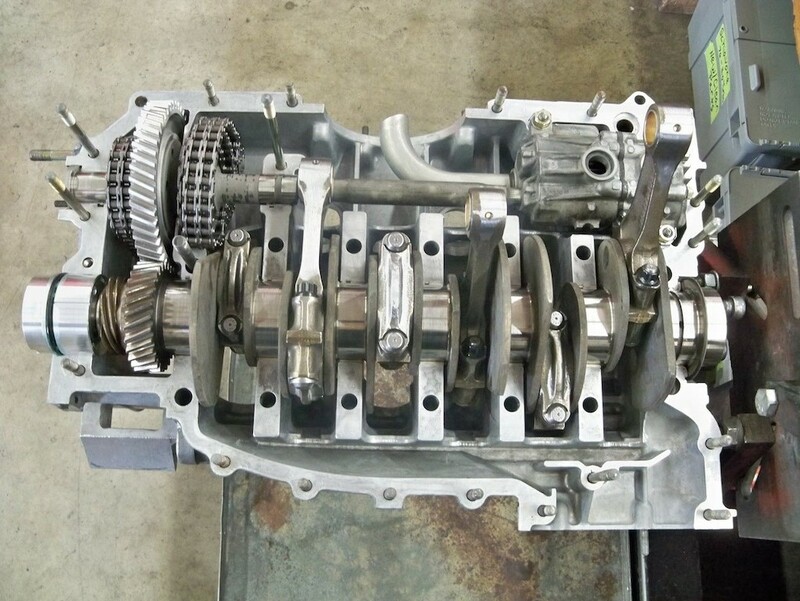 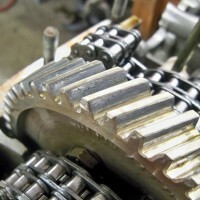 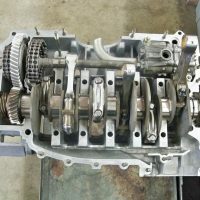 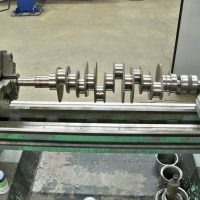 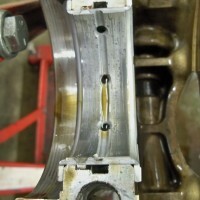 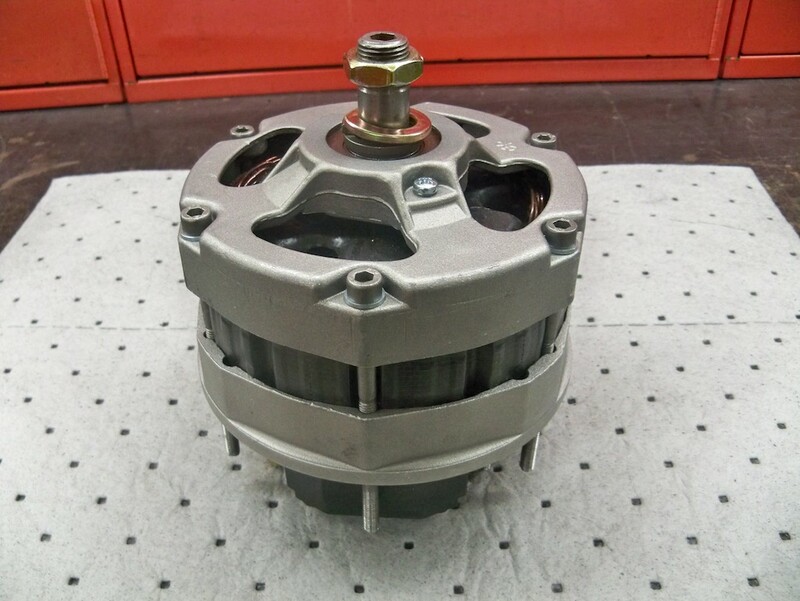 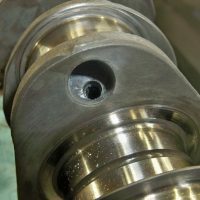 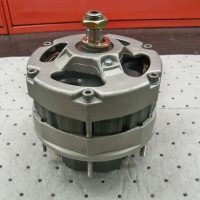 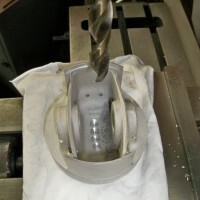 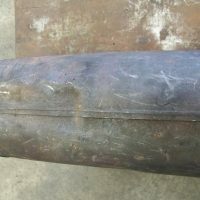 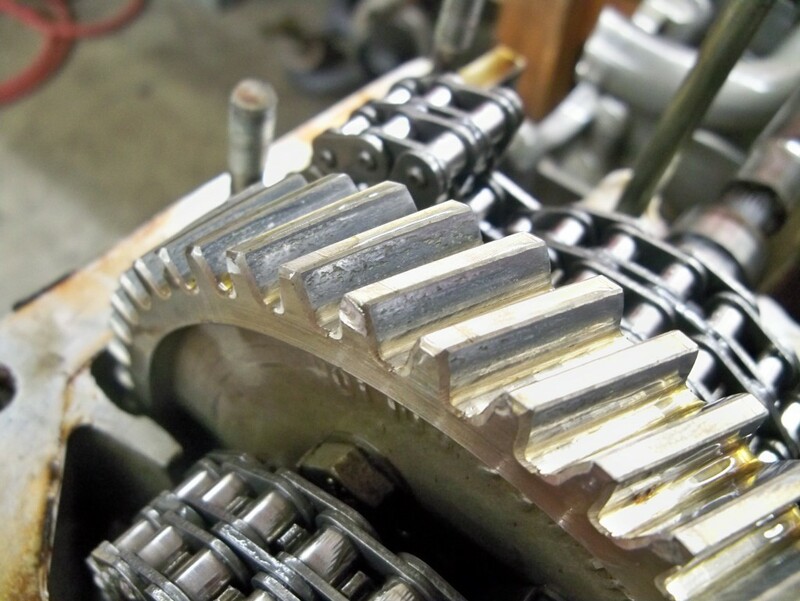 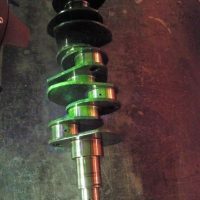 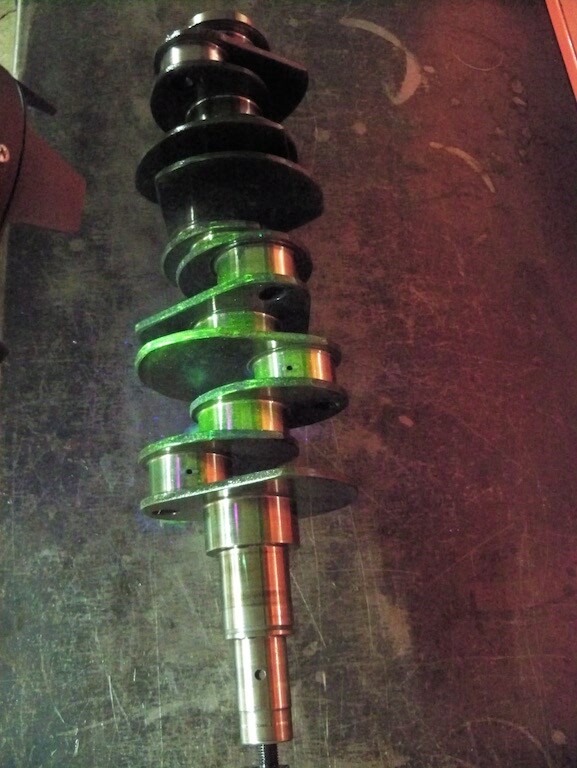 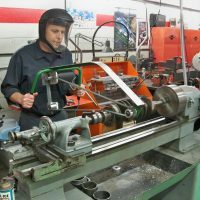 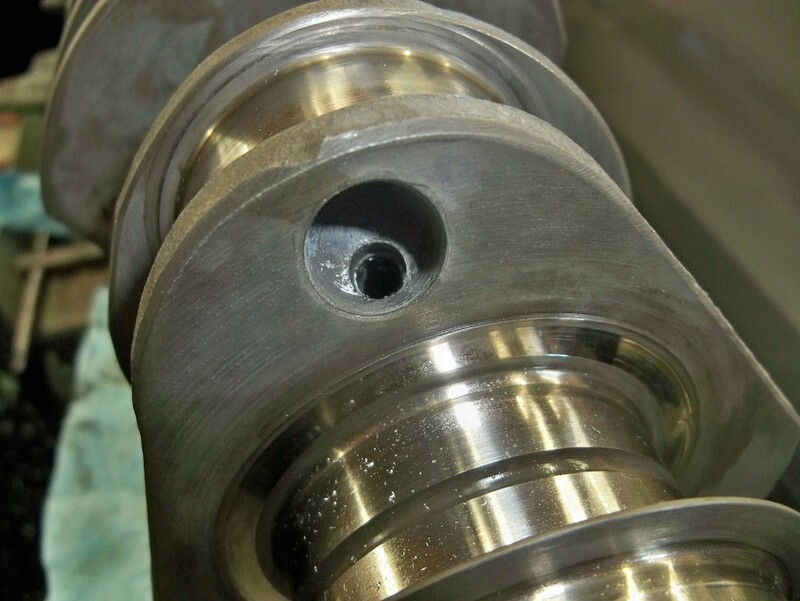 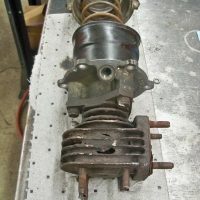 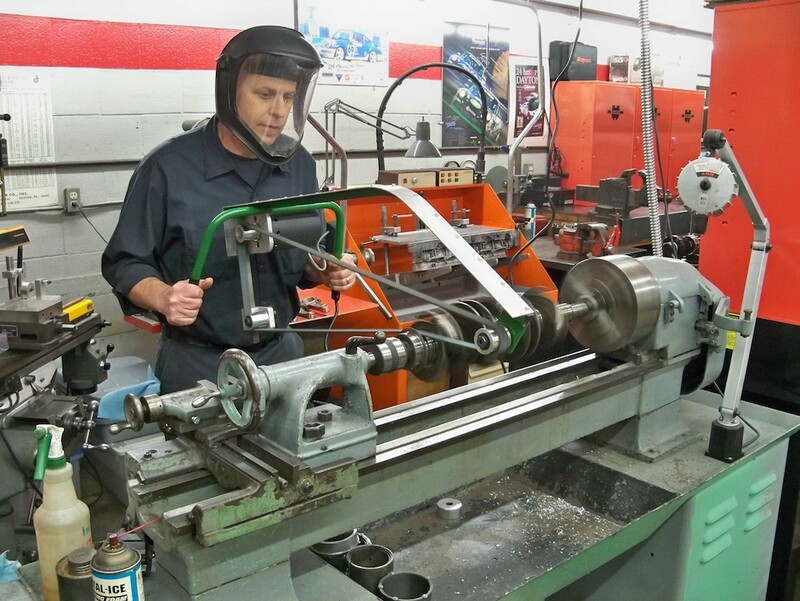 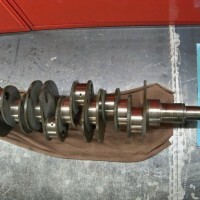 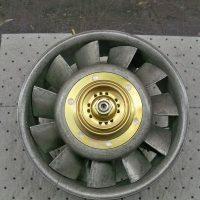 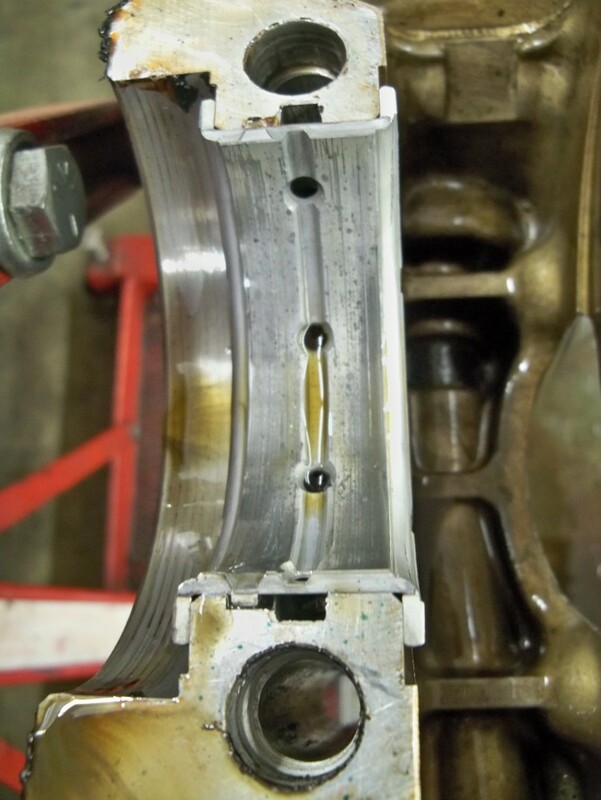 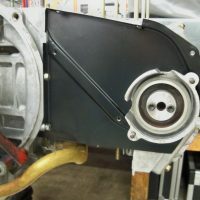 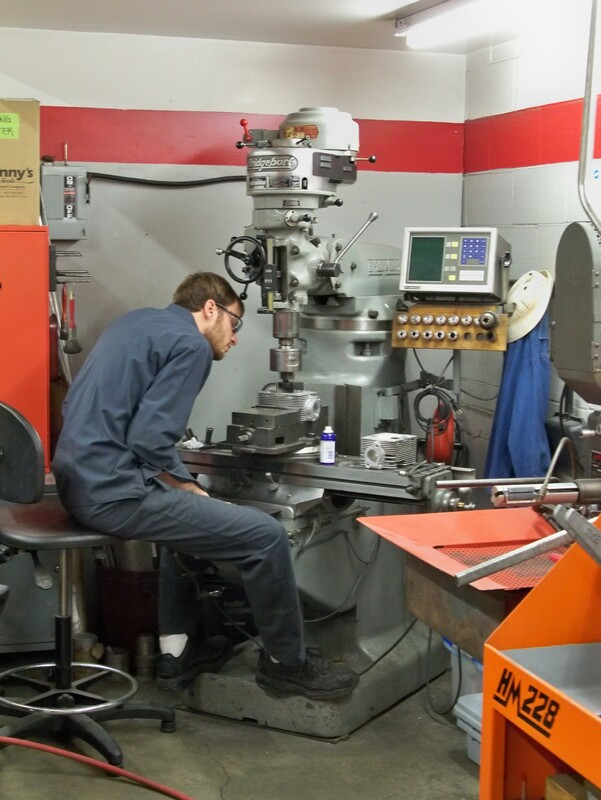 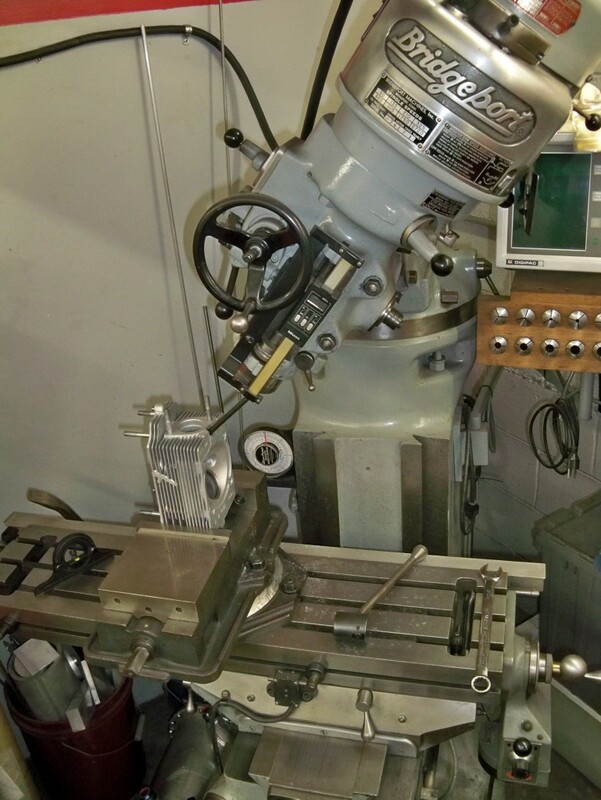 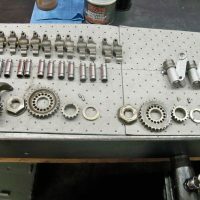 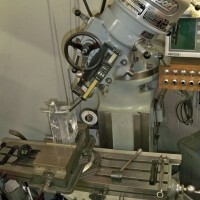 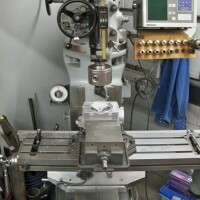 Intermediate shaft gear is worn and will be repalced. 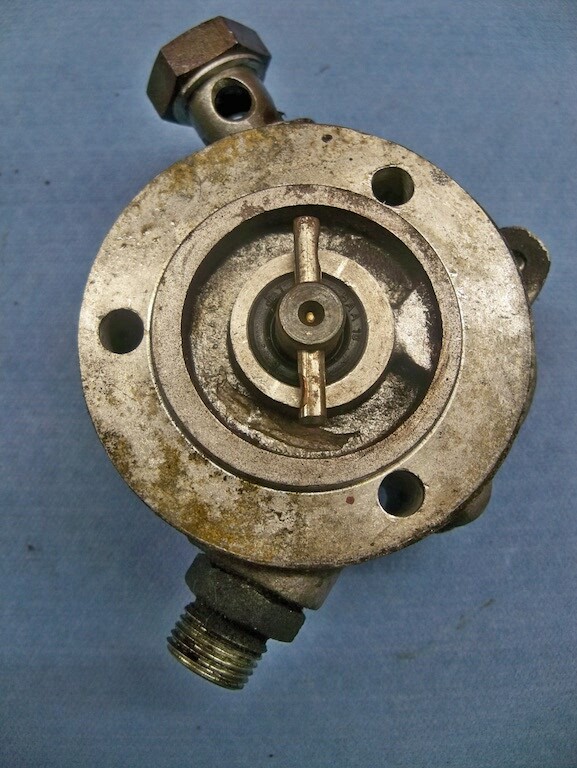 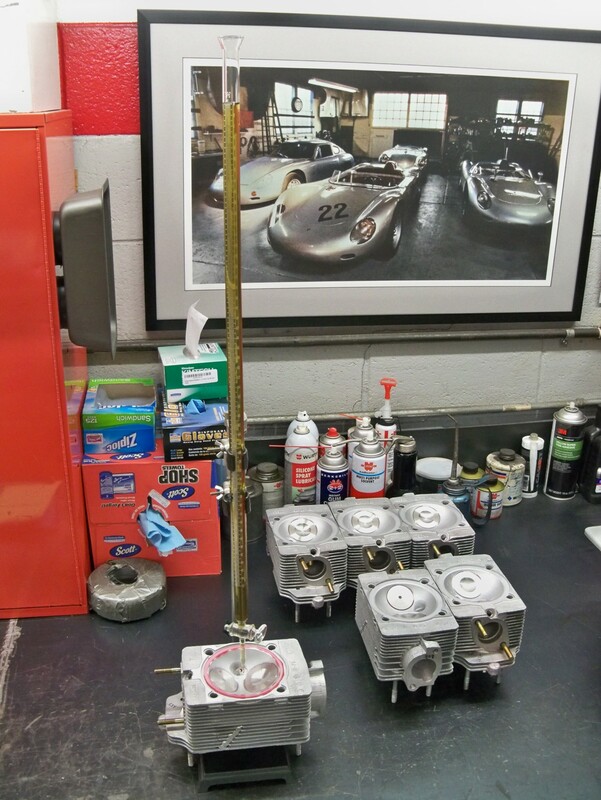 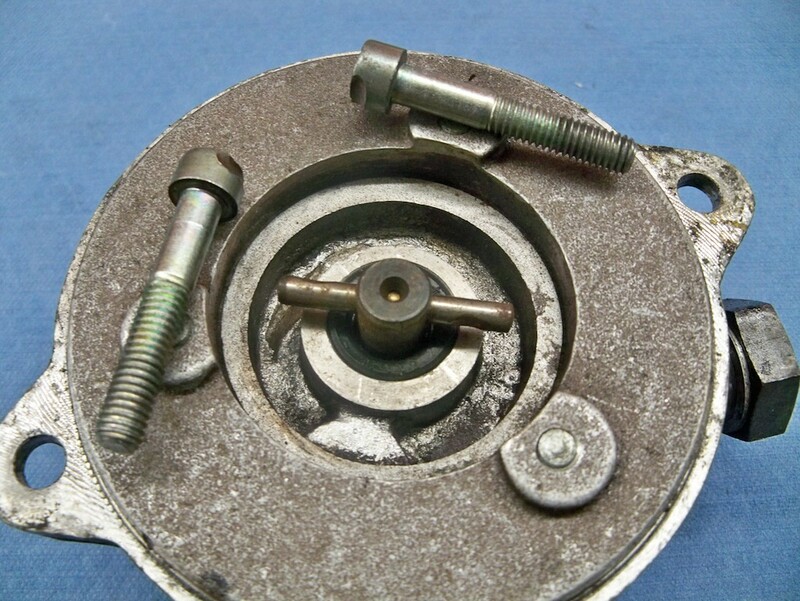 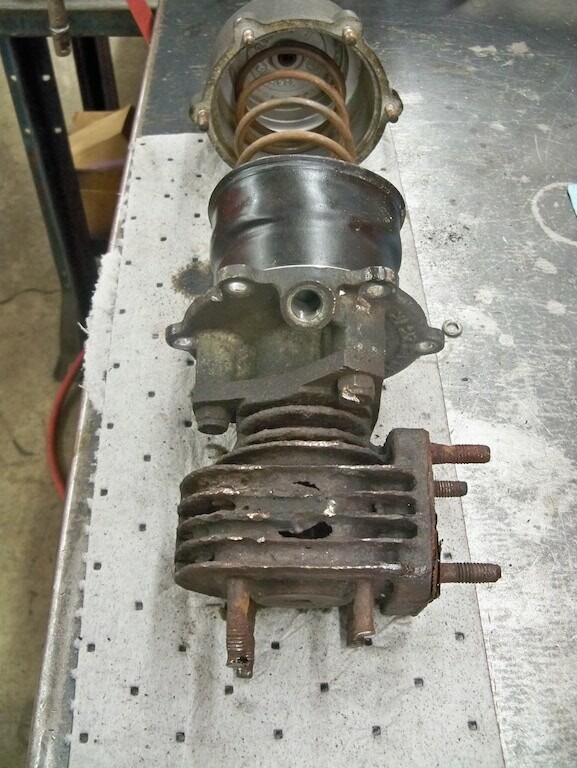 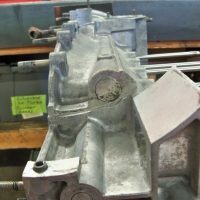 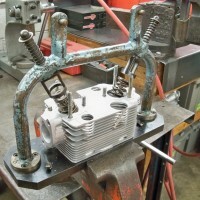 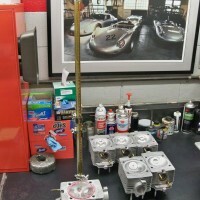 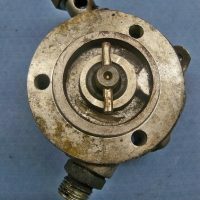 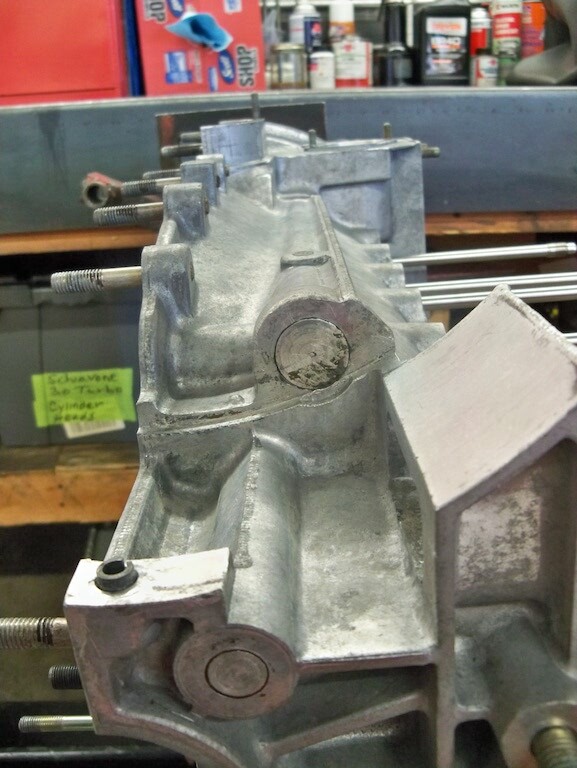 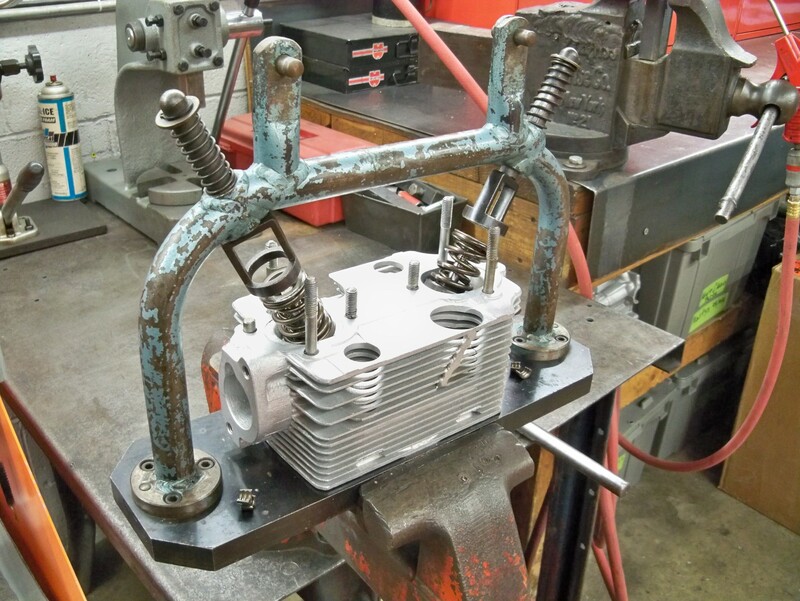 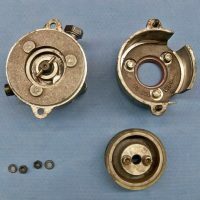 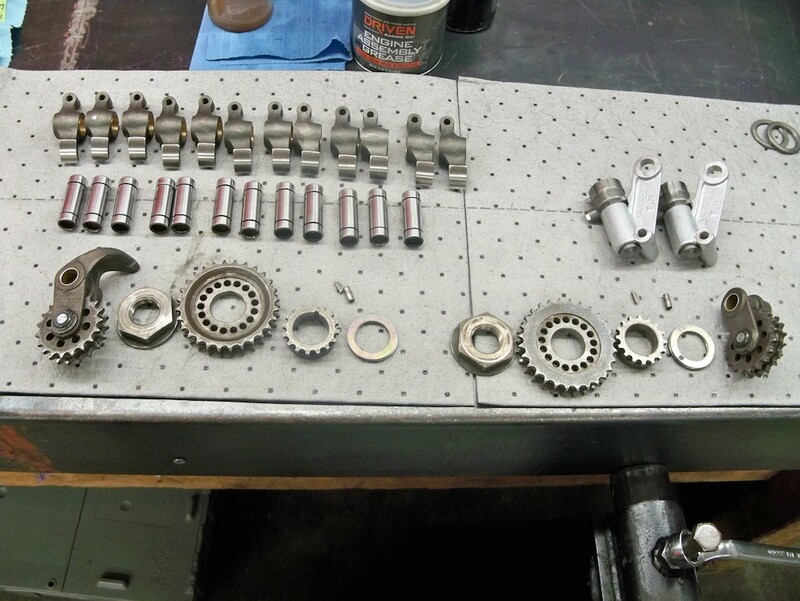 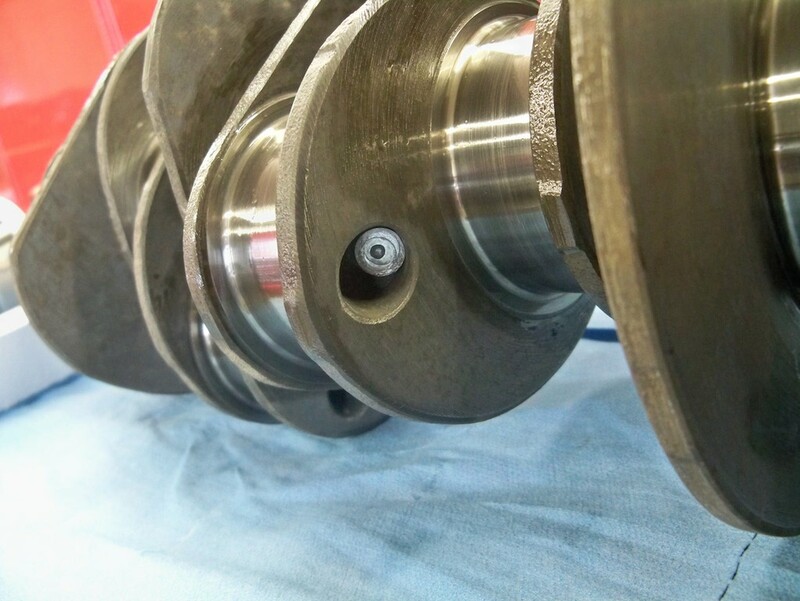 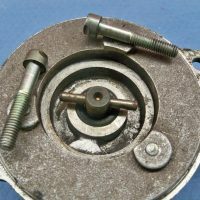 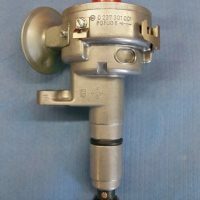 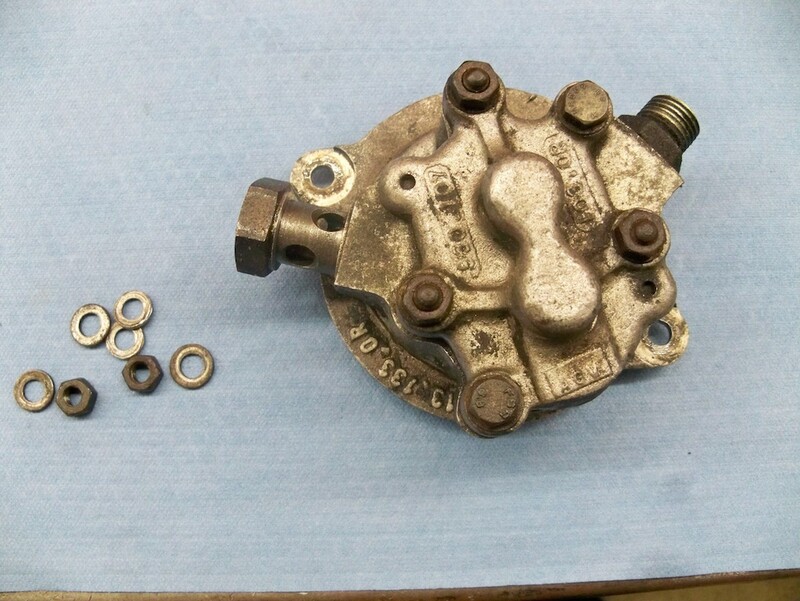 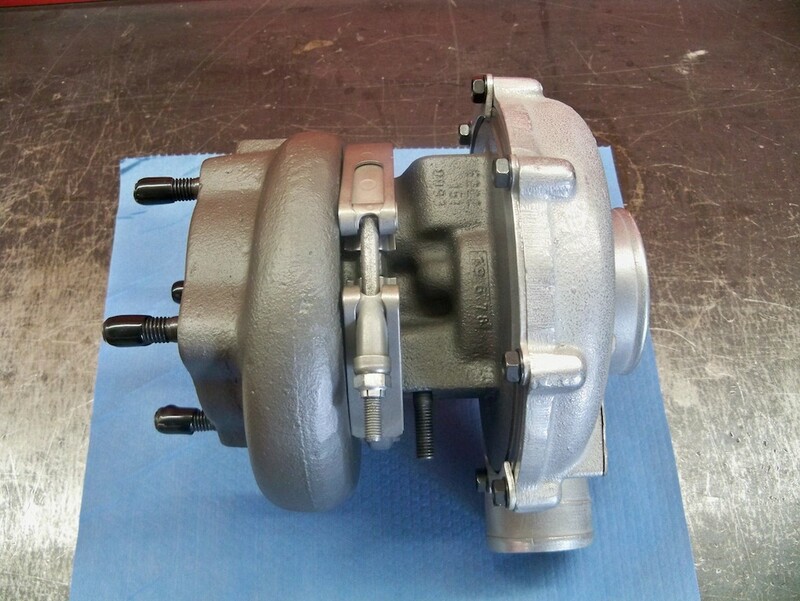 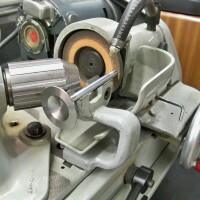 The original crank is in excellent condition, with standard rod and main journals. 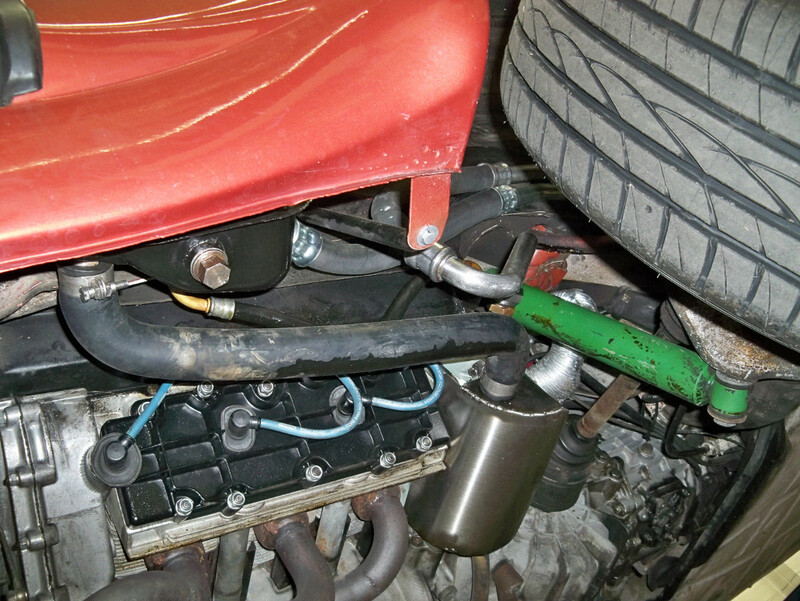 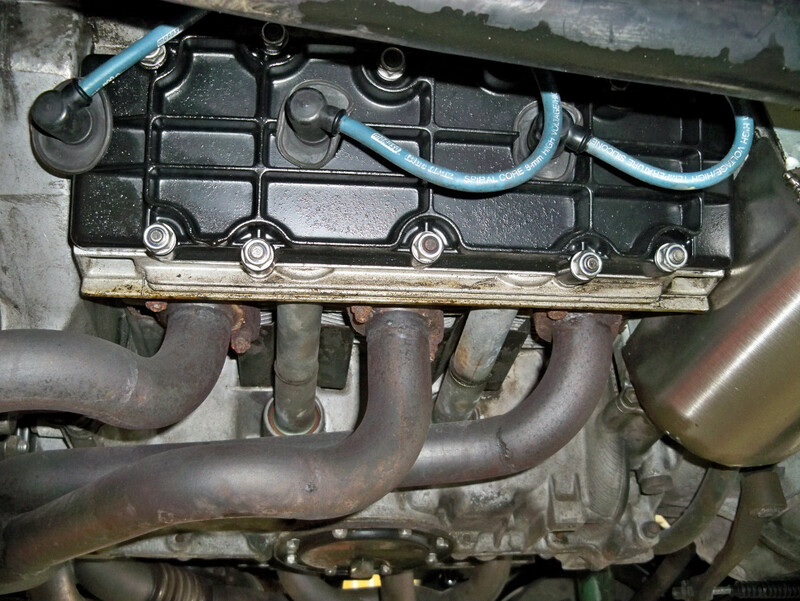 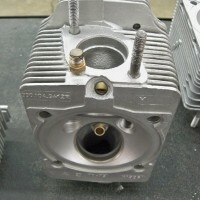 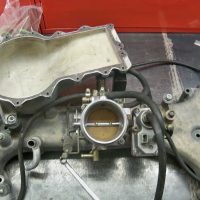 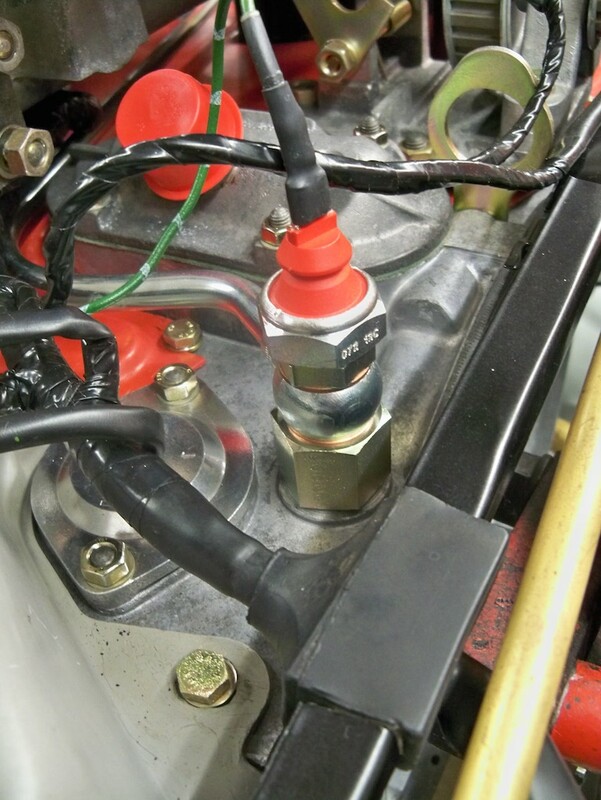 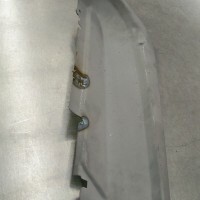 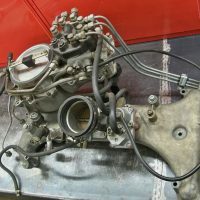 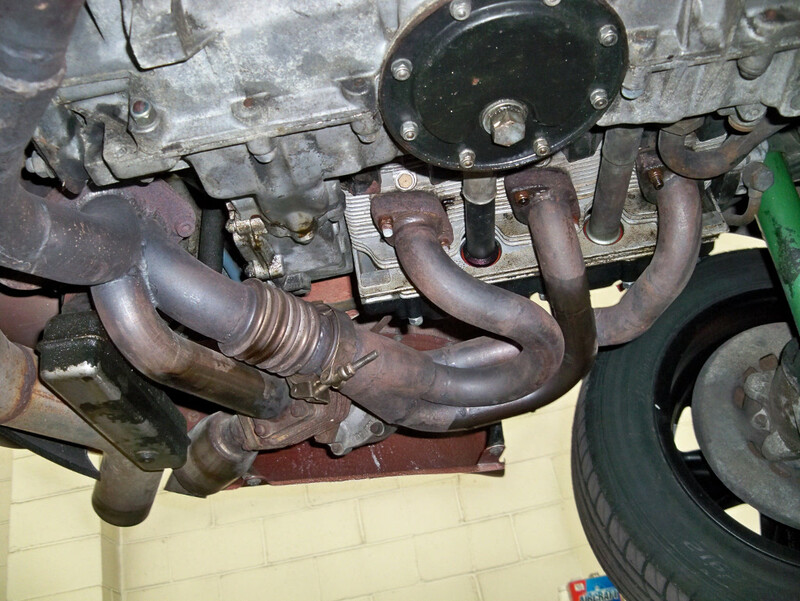 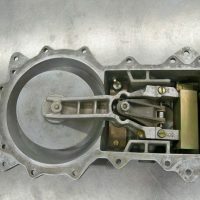 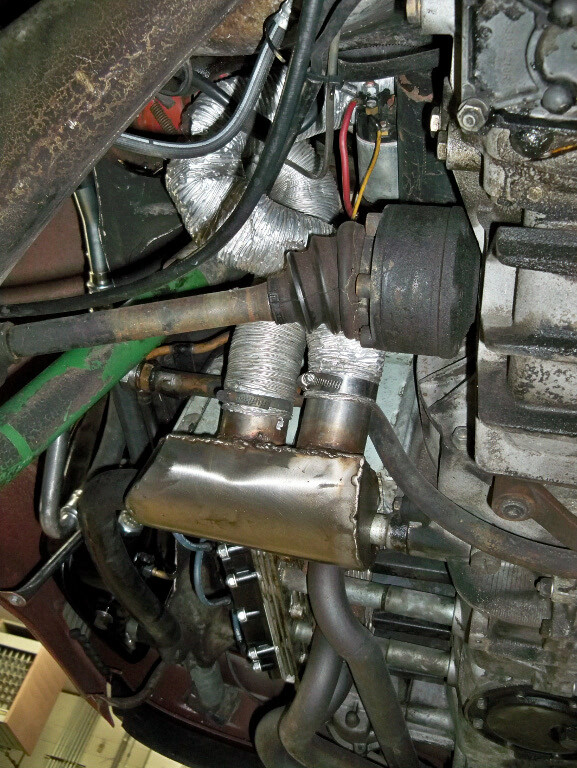 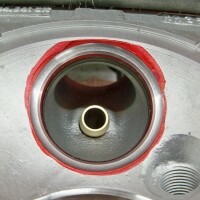 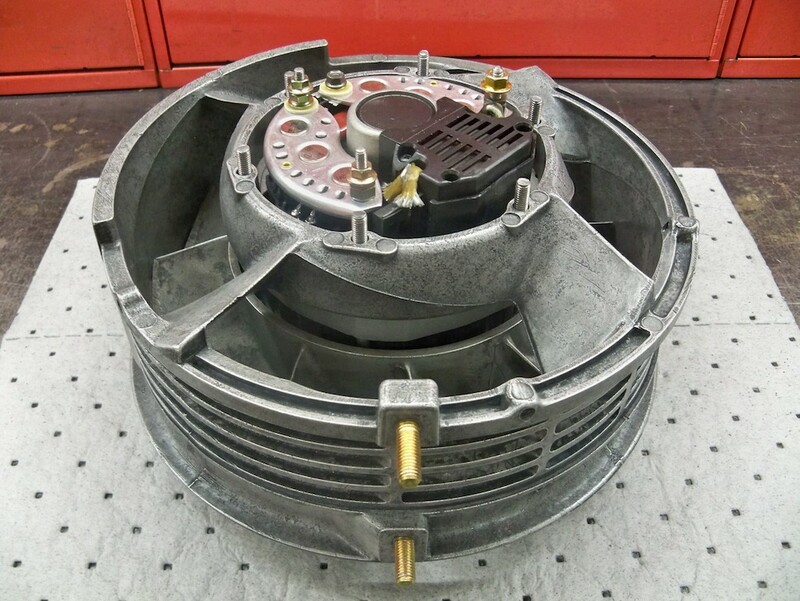 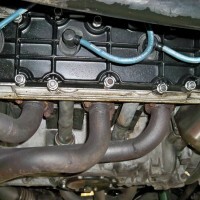 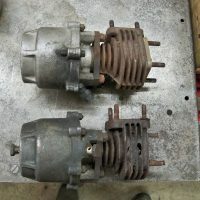 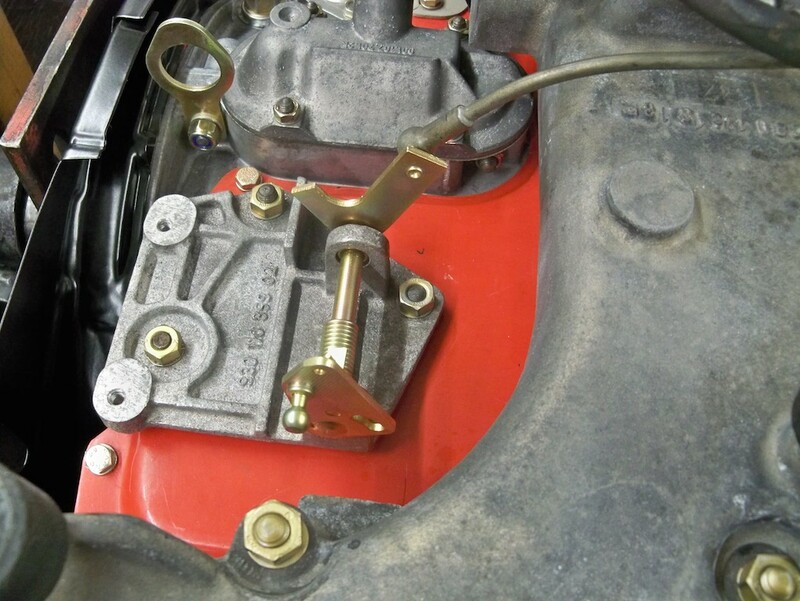 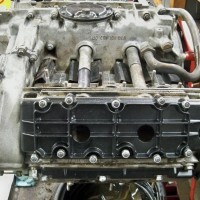 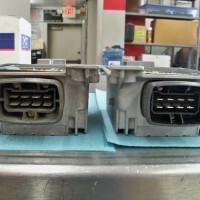 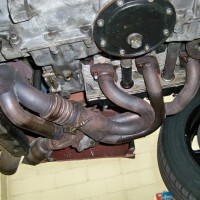 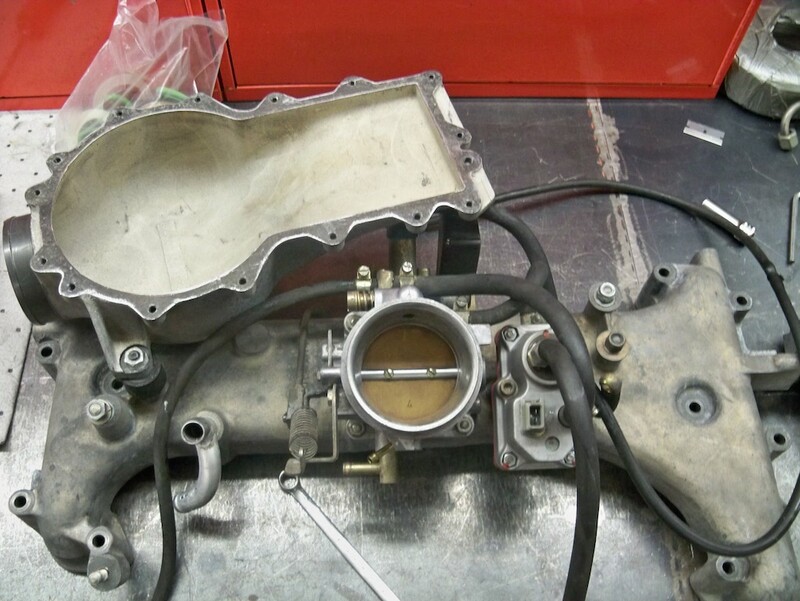 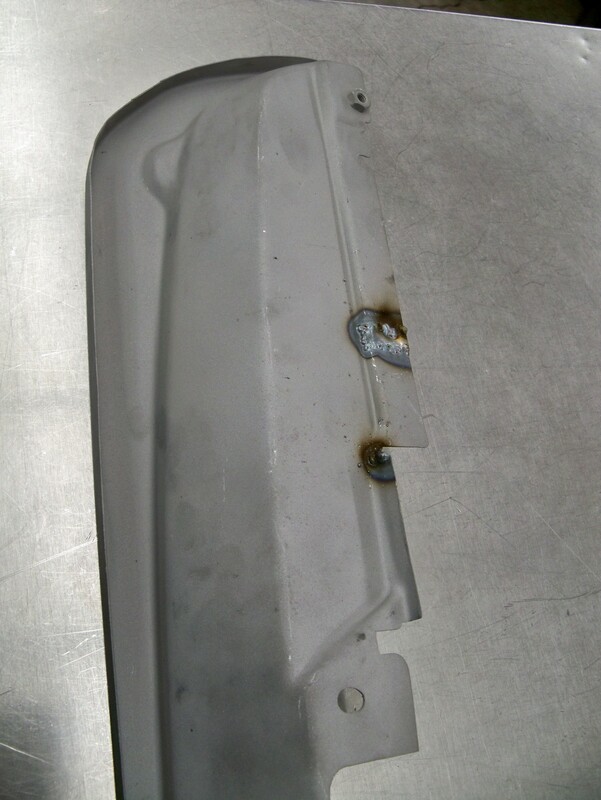 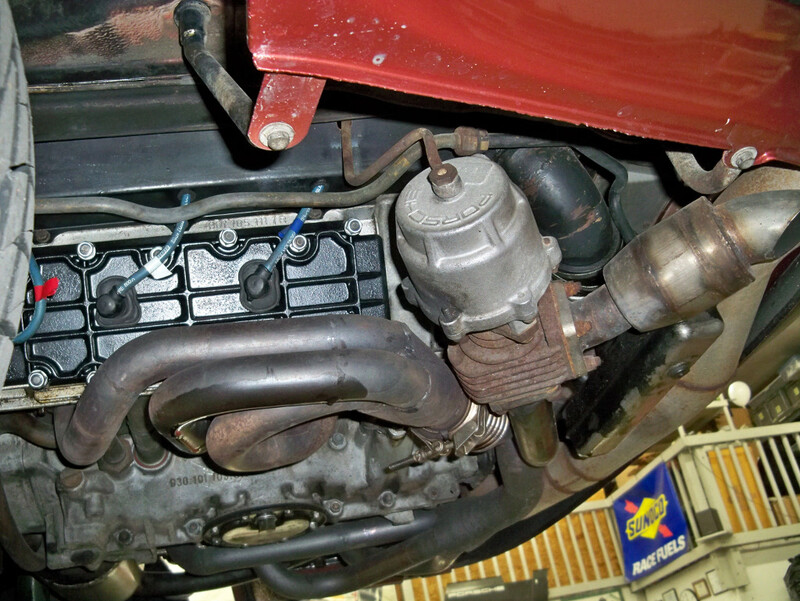 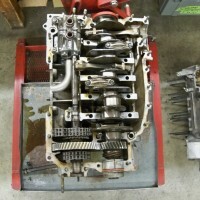 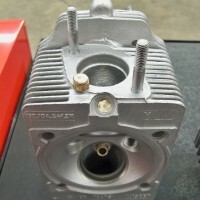 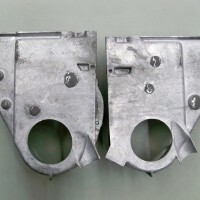 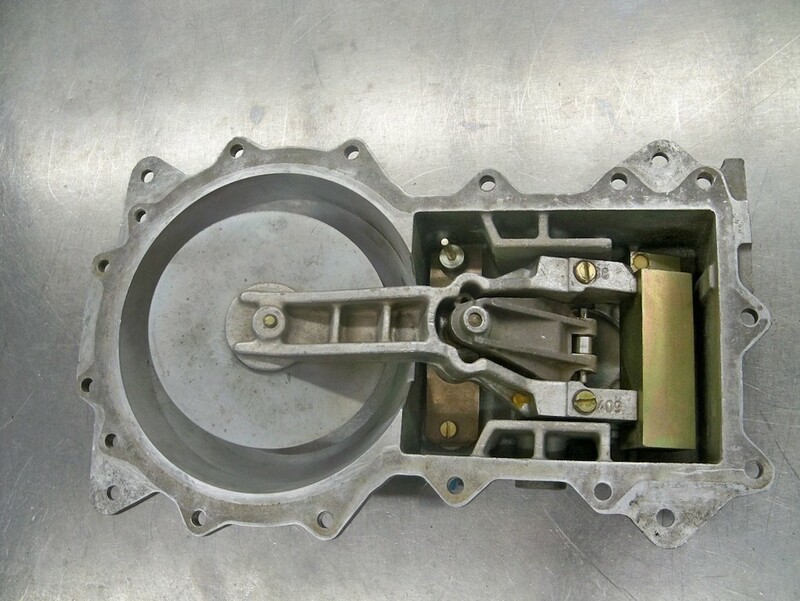 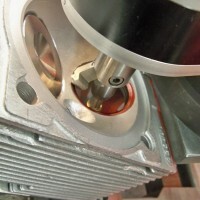 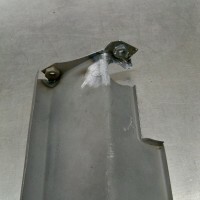 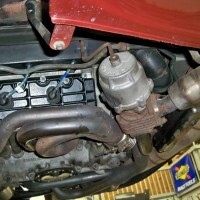 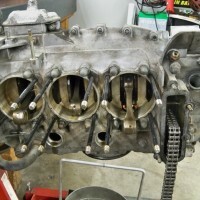 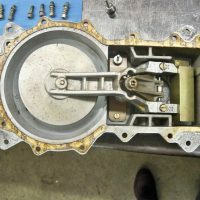 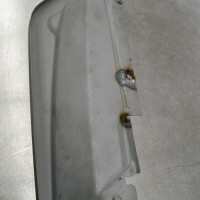 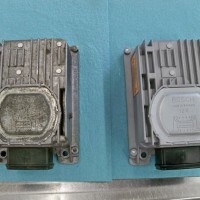 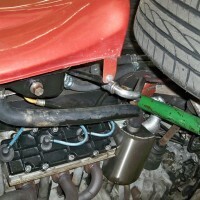 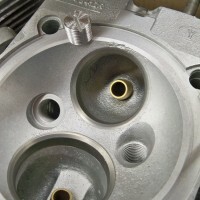 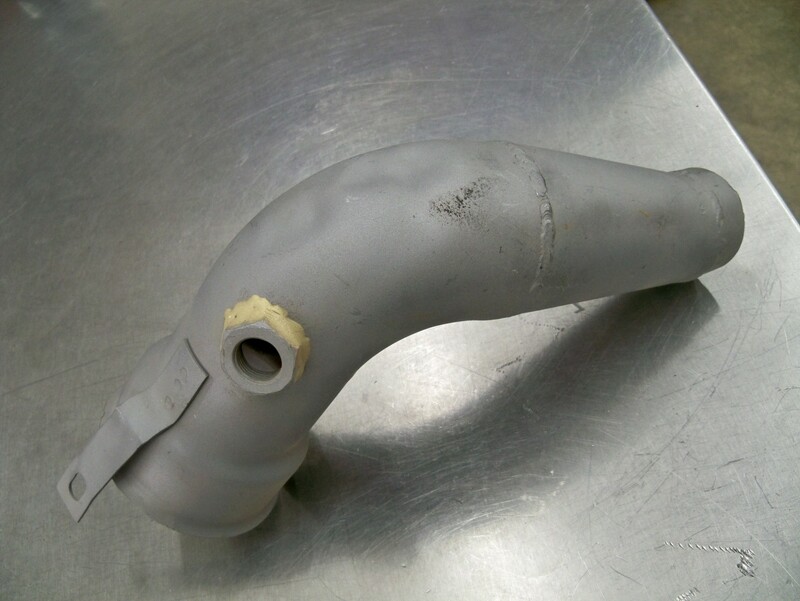 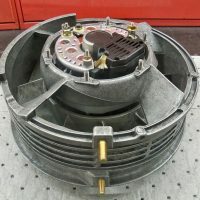 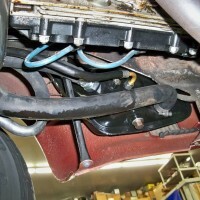 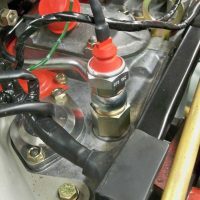 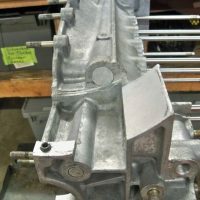 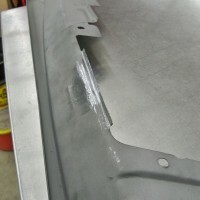 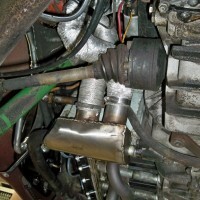 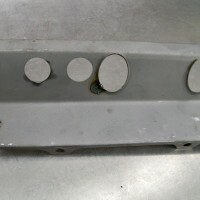 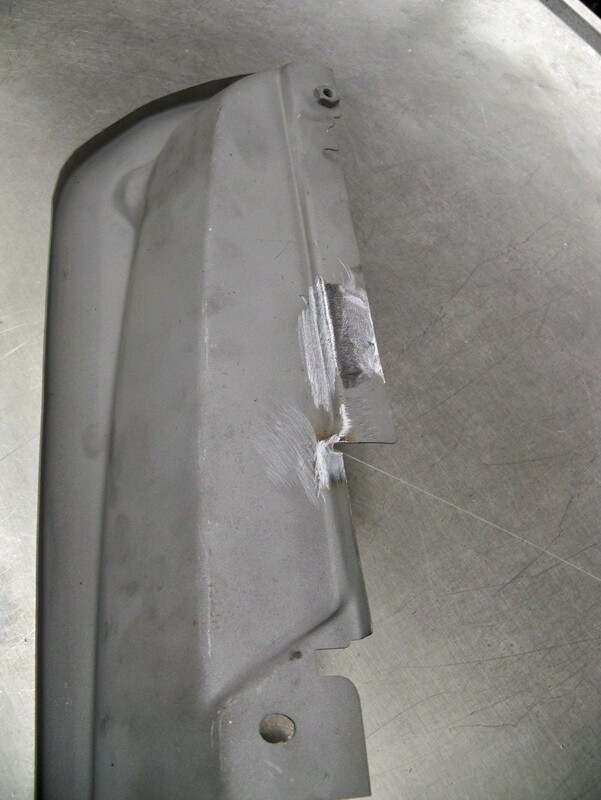 The air injection ports were blocked off due to the prior engine conversion. 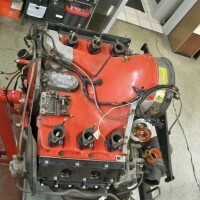 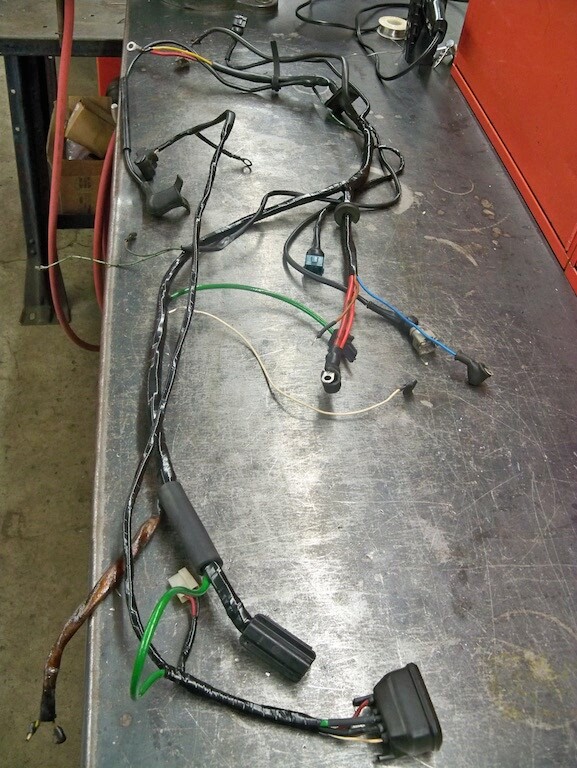 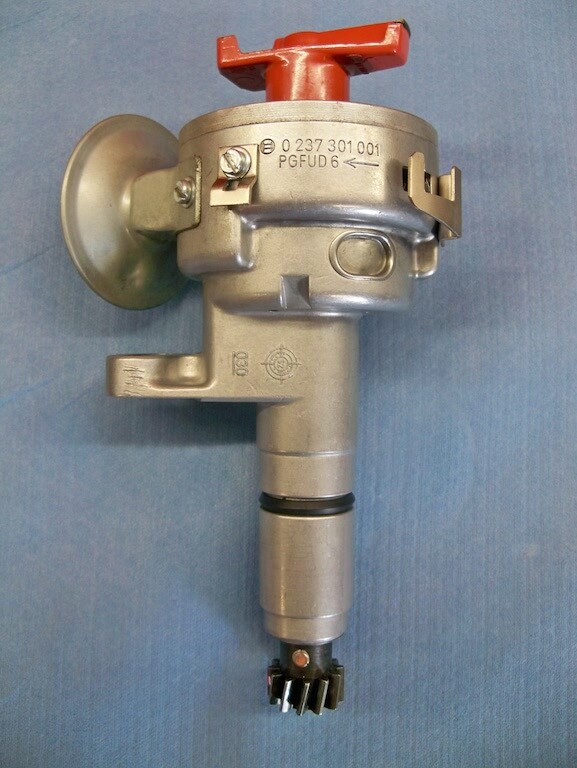 We will be putting the air injection back on the engine. 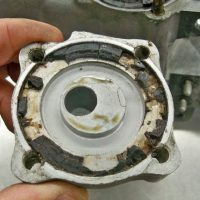 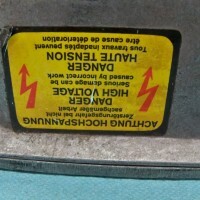 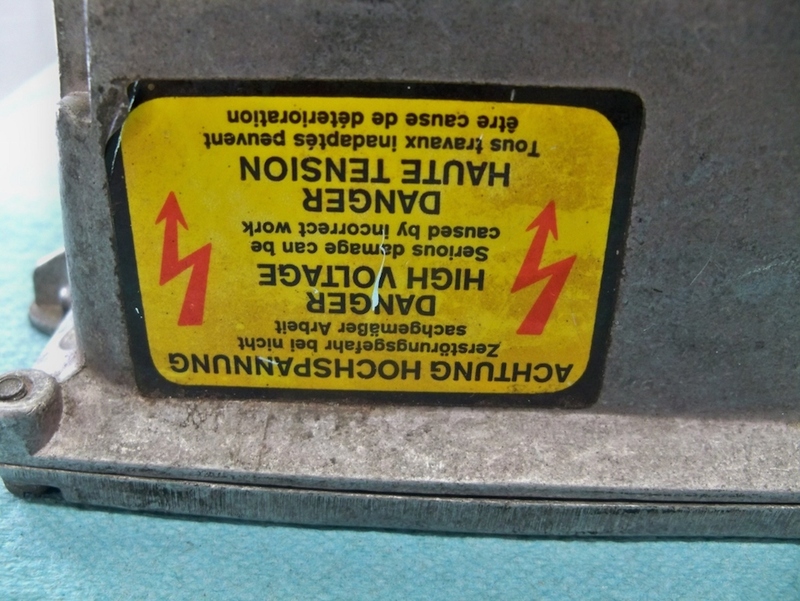 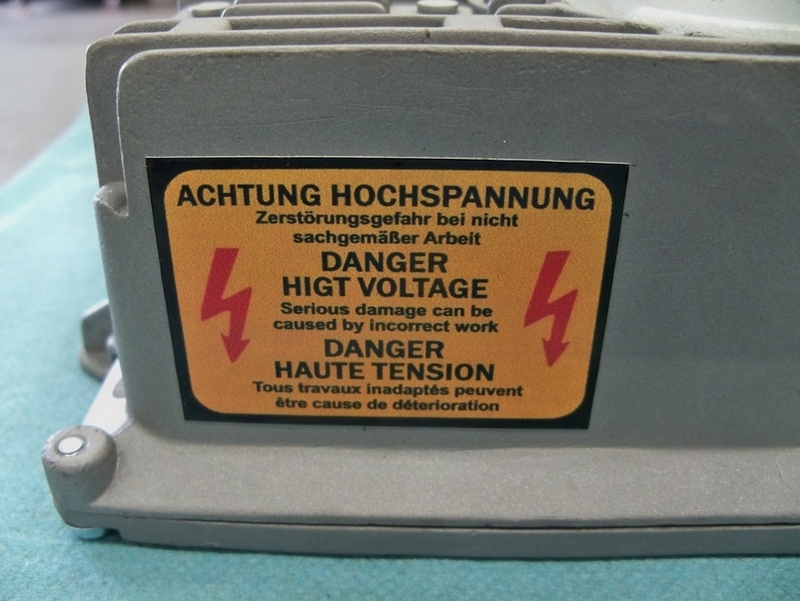 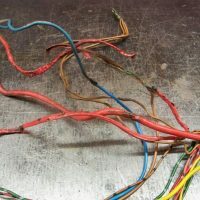 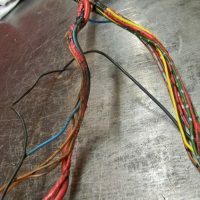 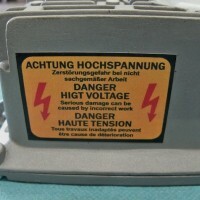 Here you can see this plug broke as it was being removed. 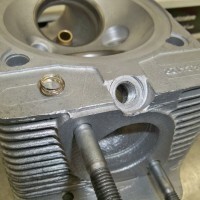 We then drilled out the broken plug. 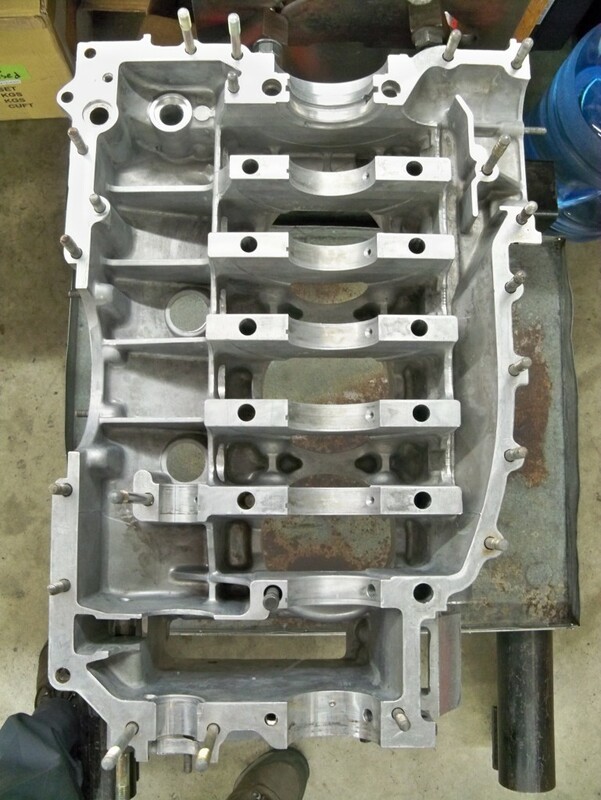 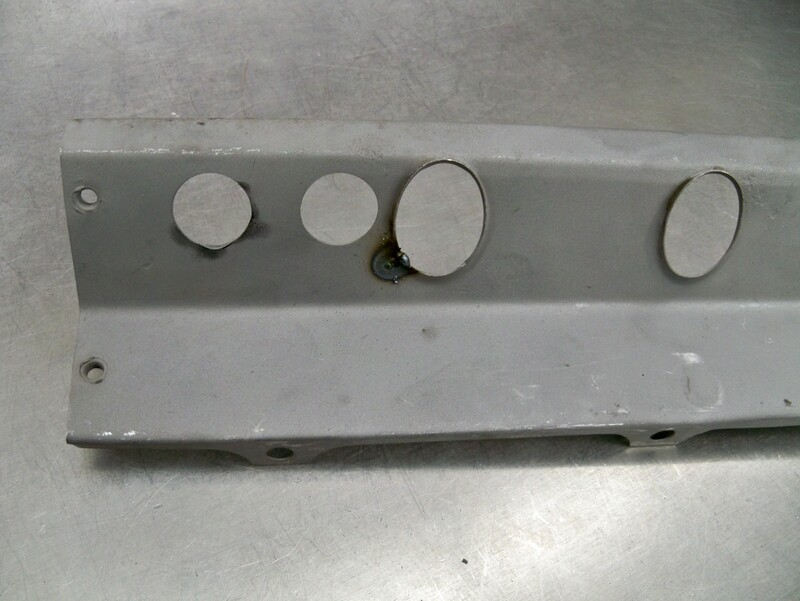 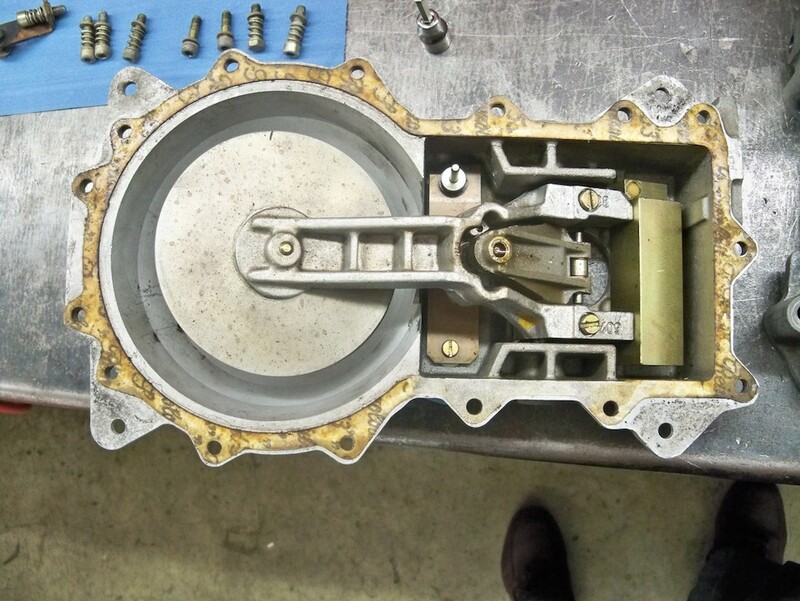 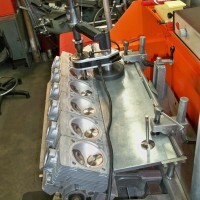 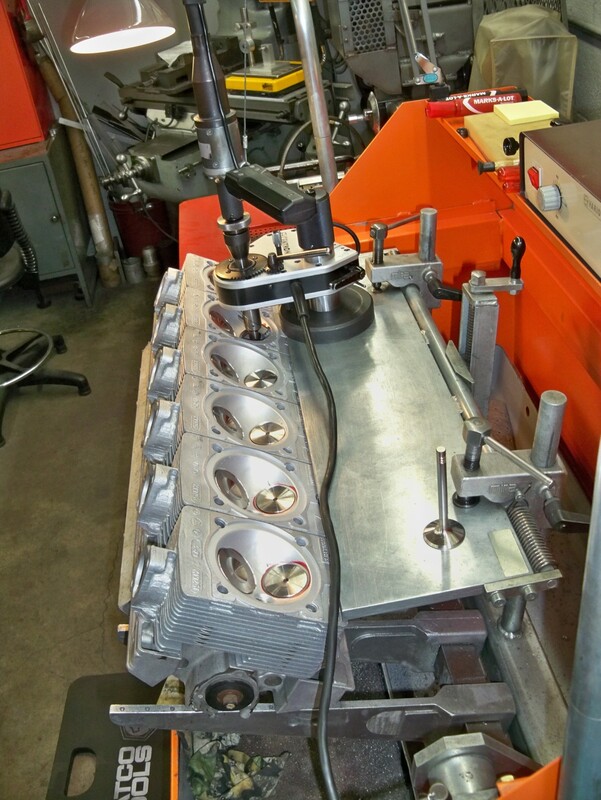 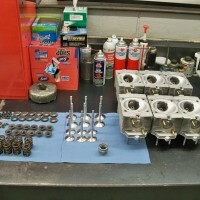 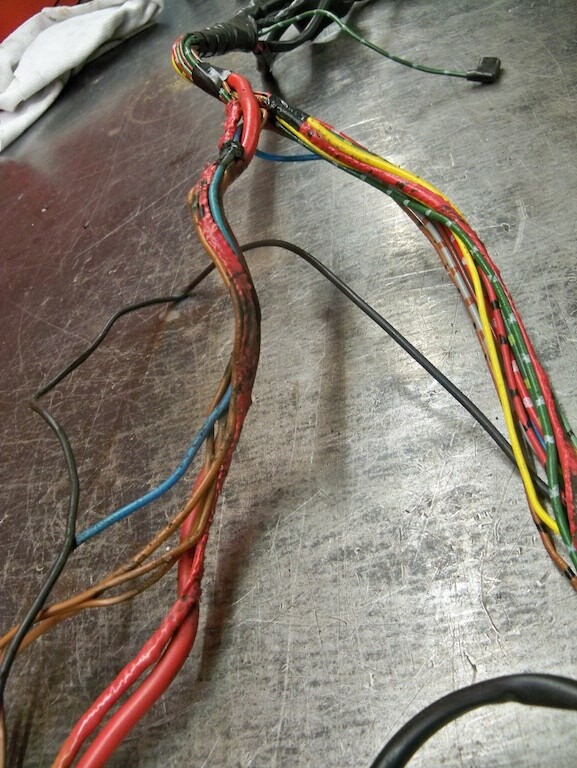 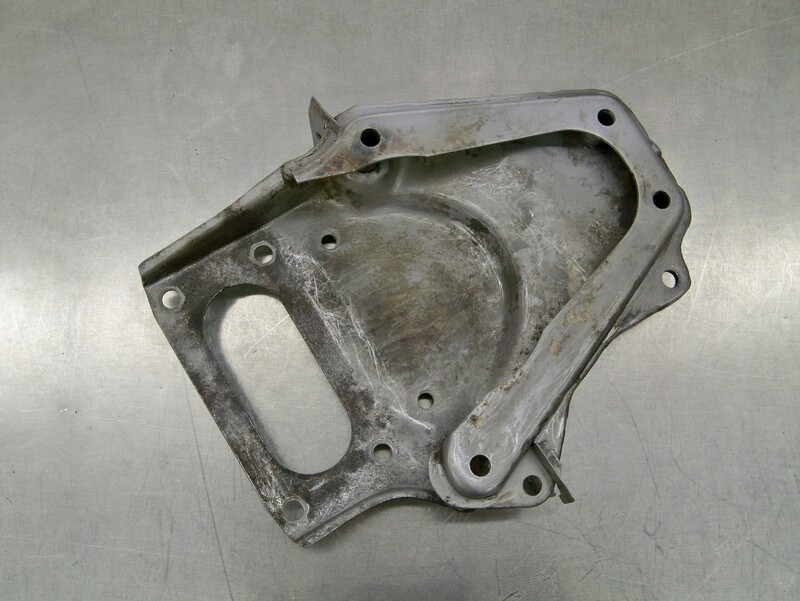 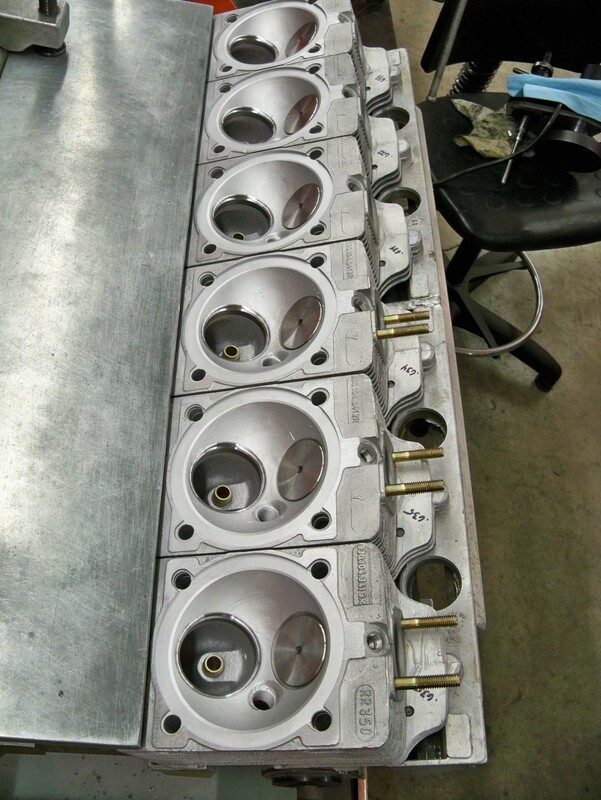 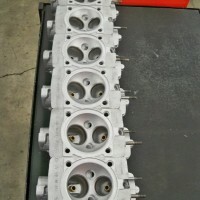 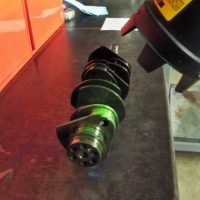 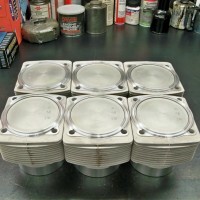 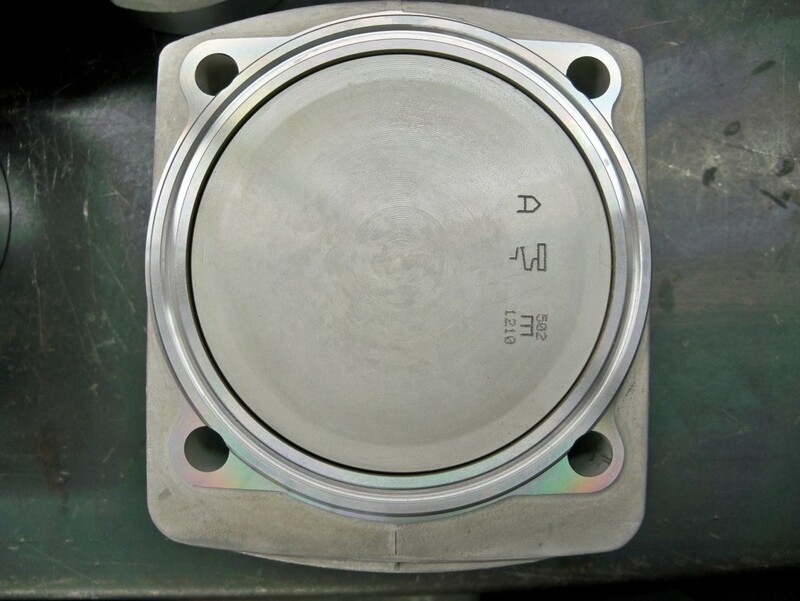 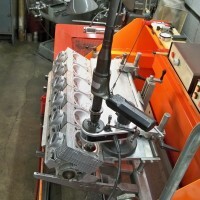 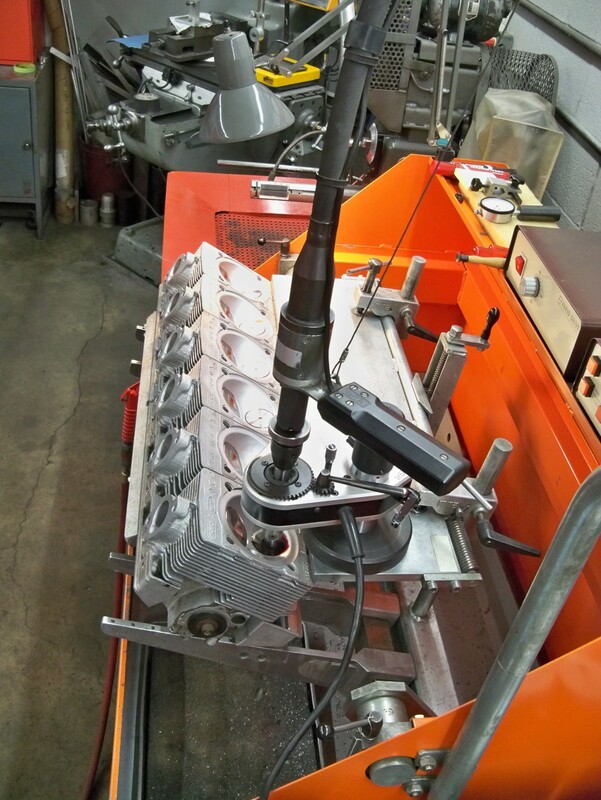 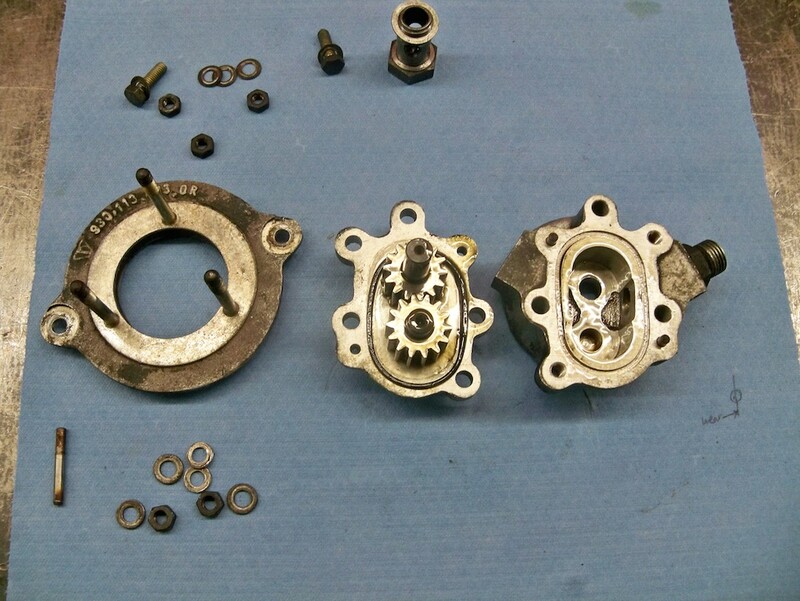 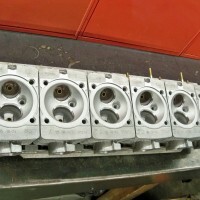 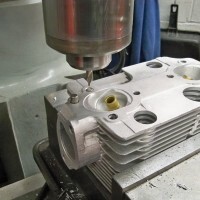 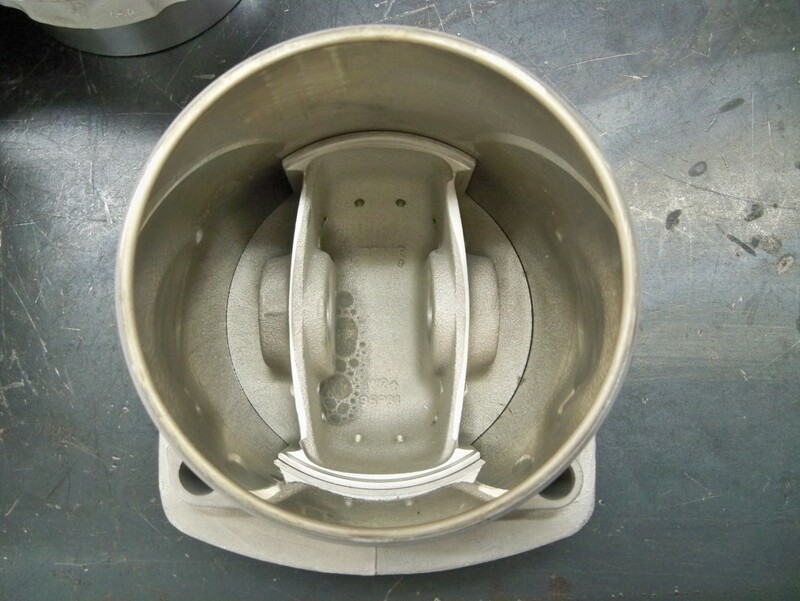 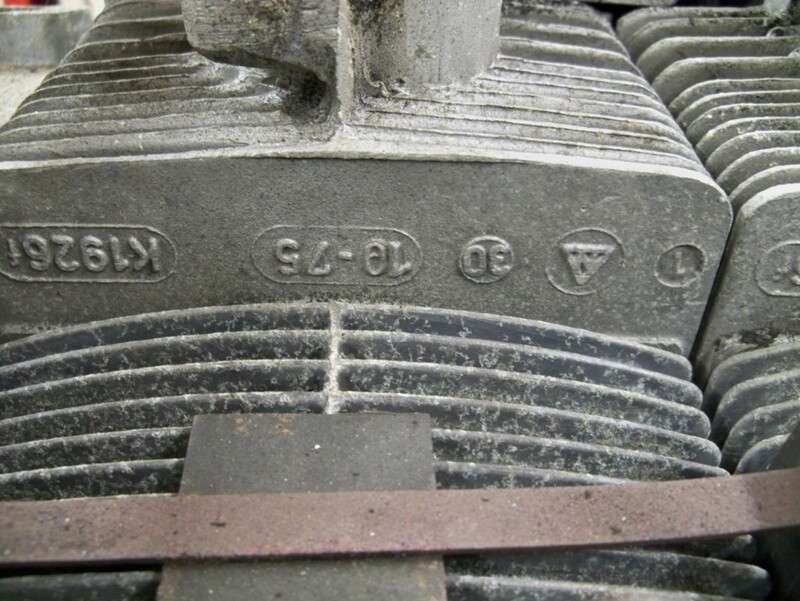 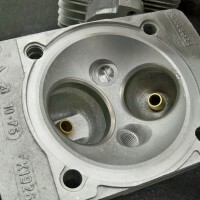 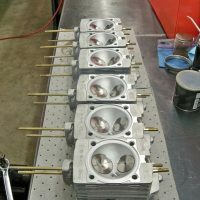 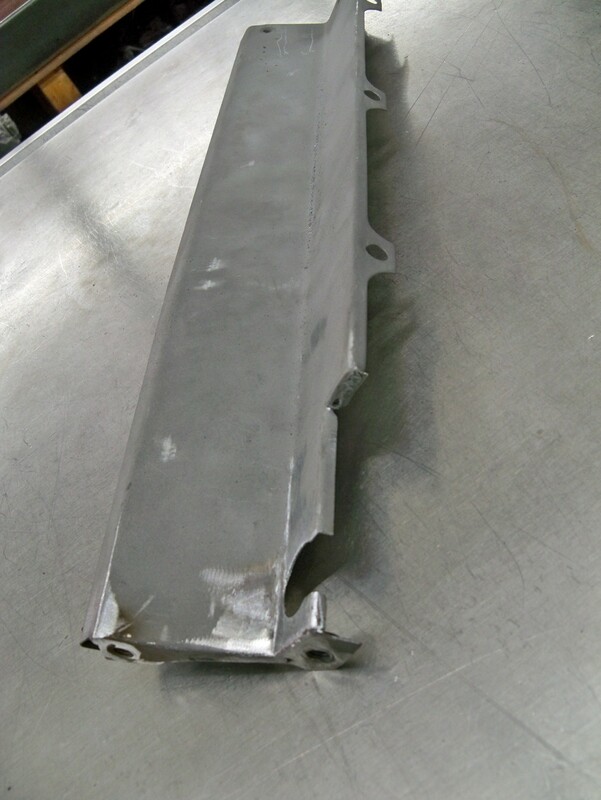 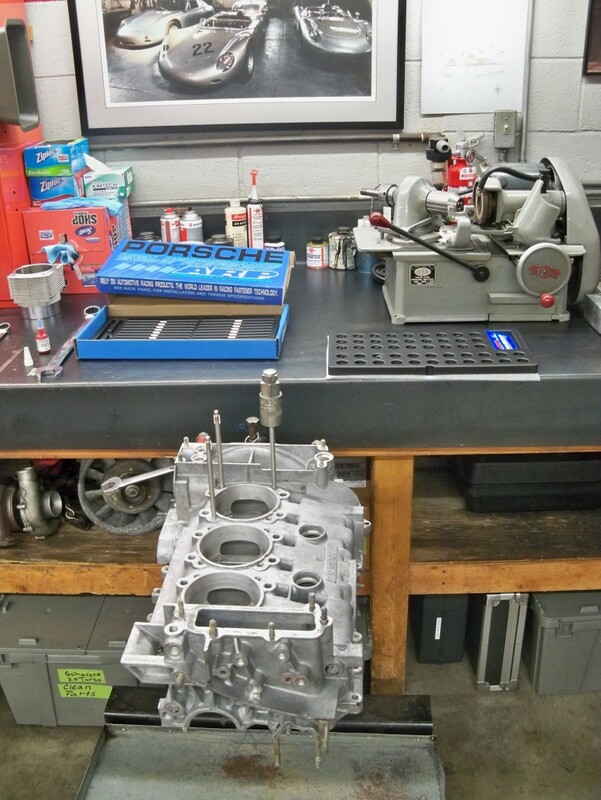 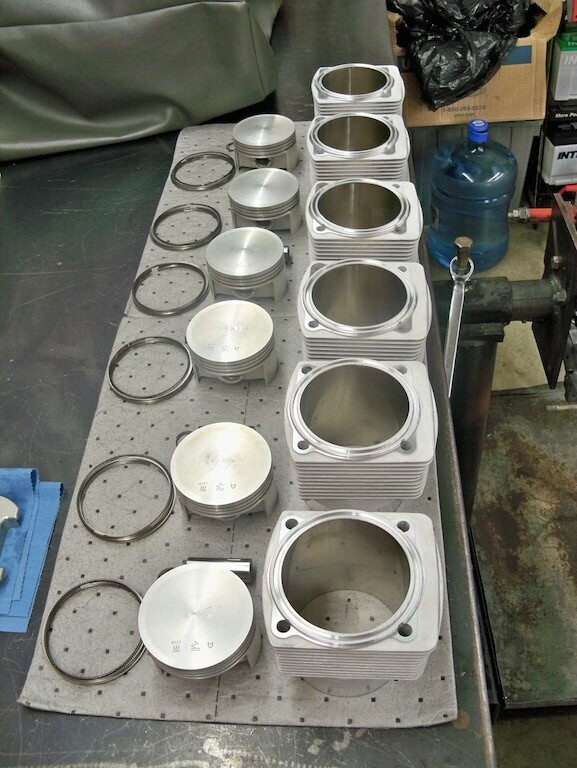 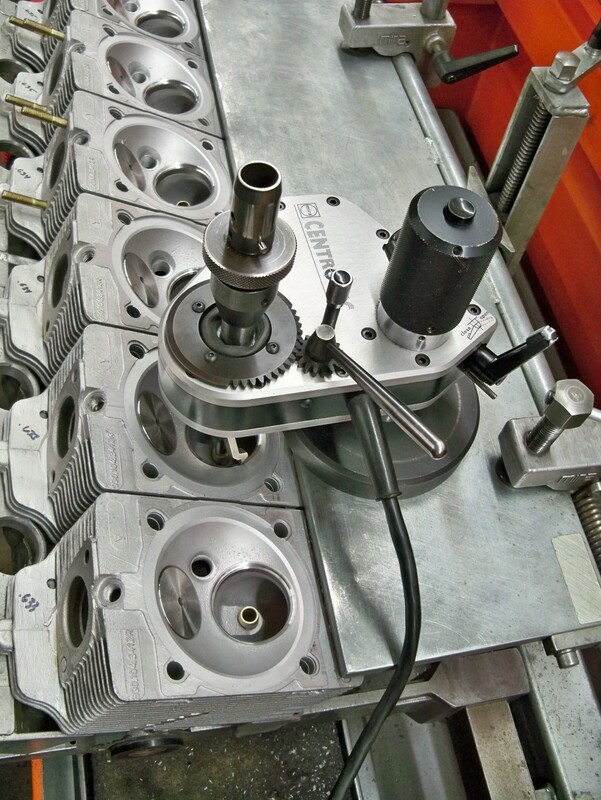 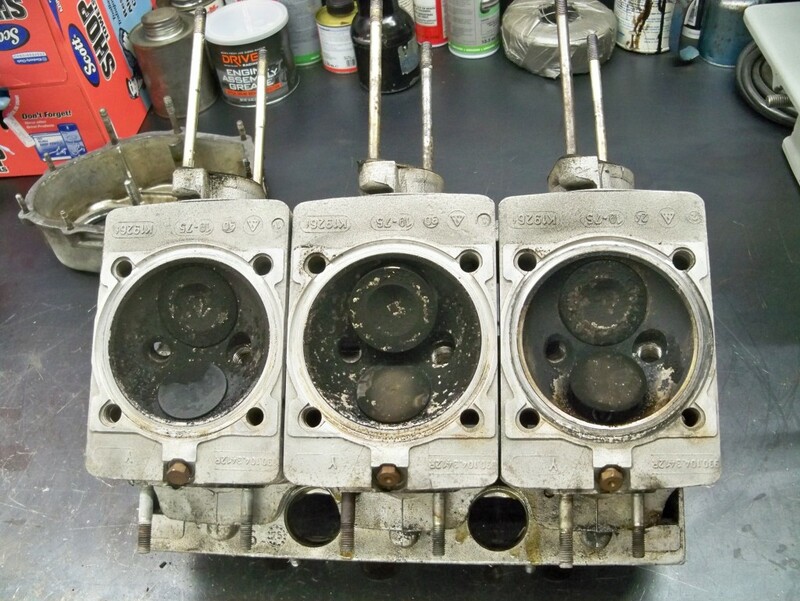 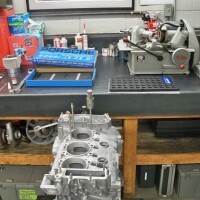 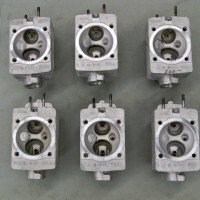 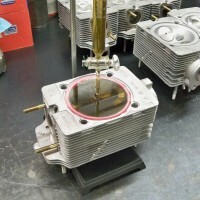 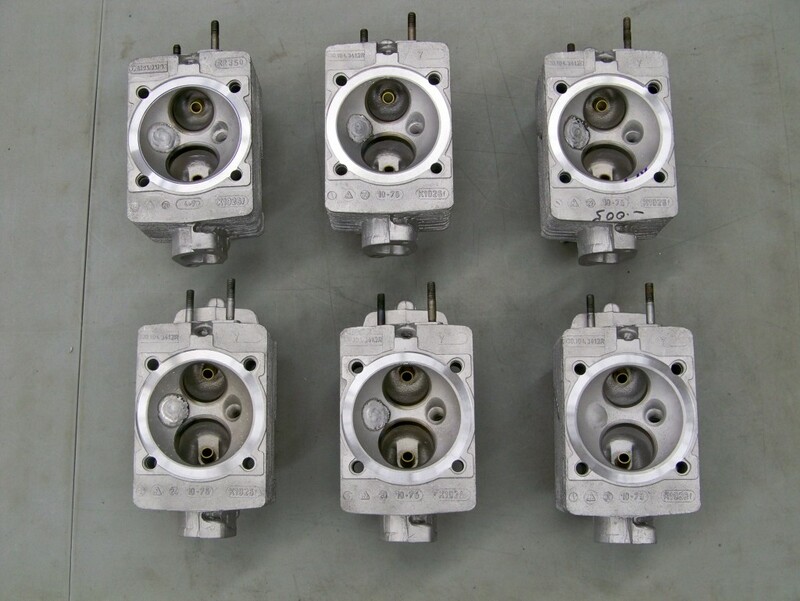 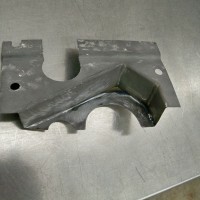 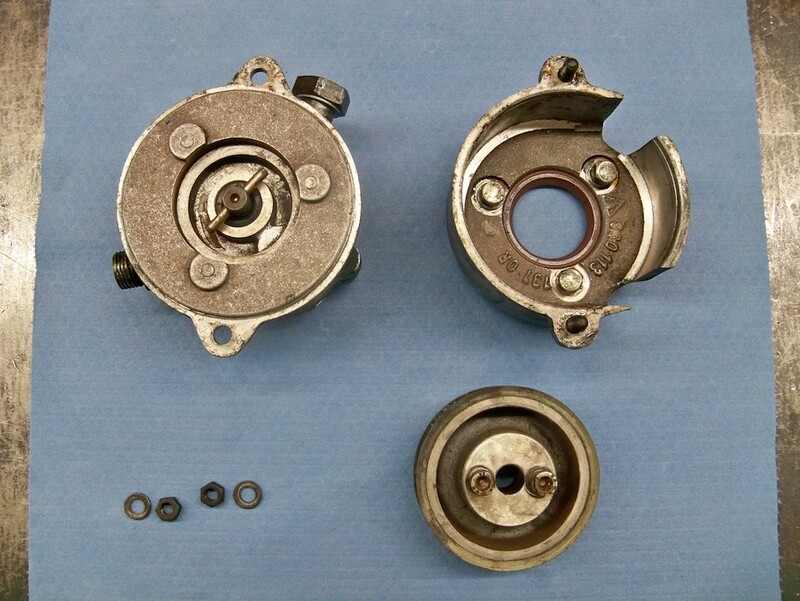 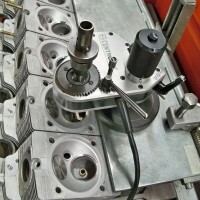 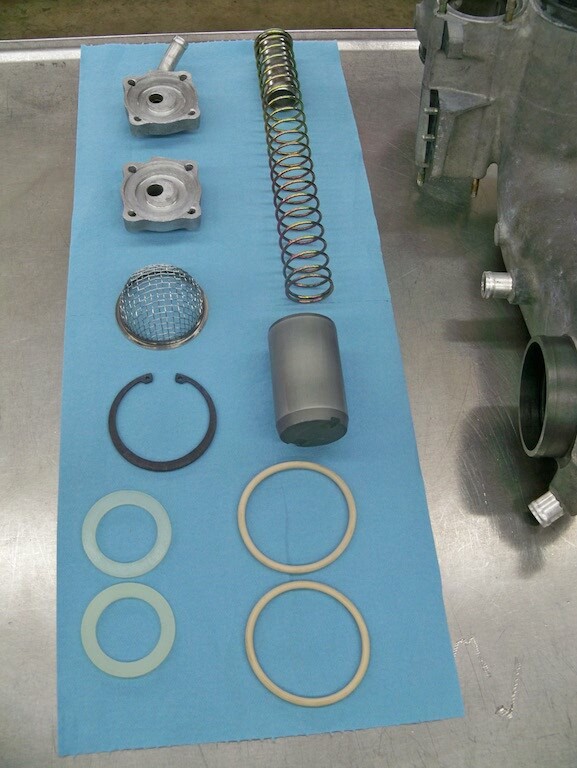 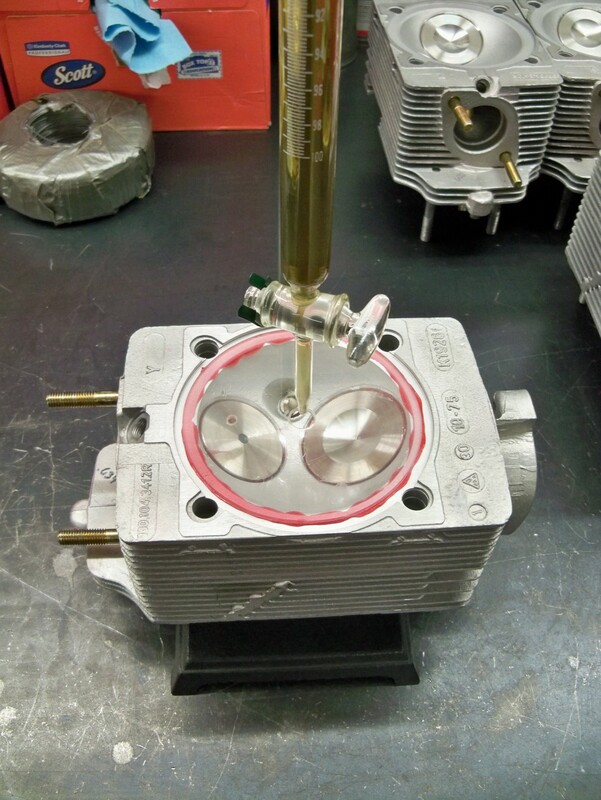 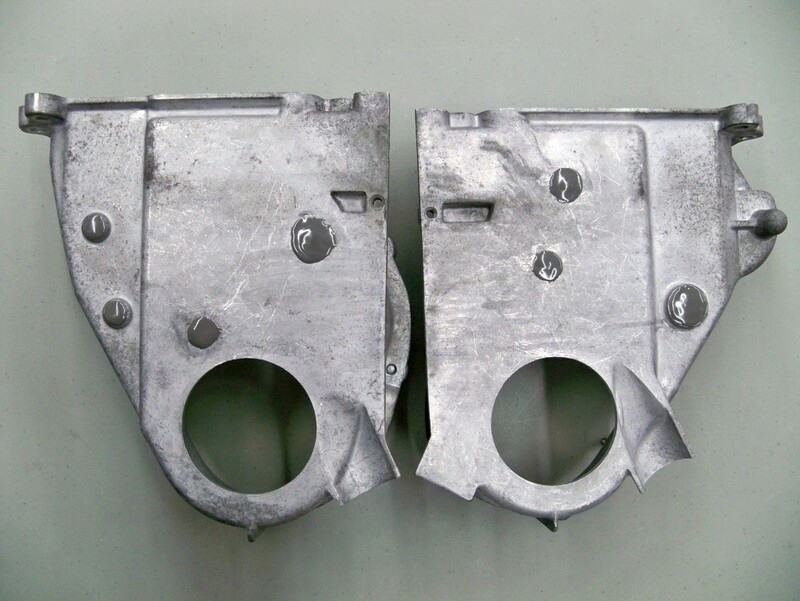 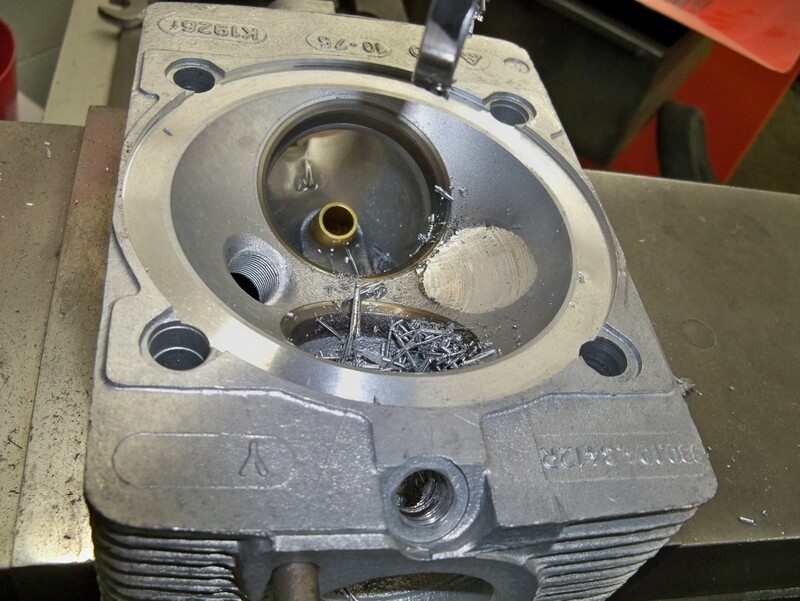 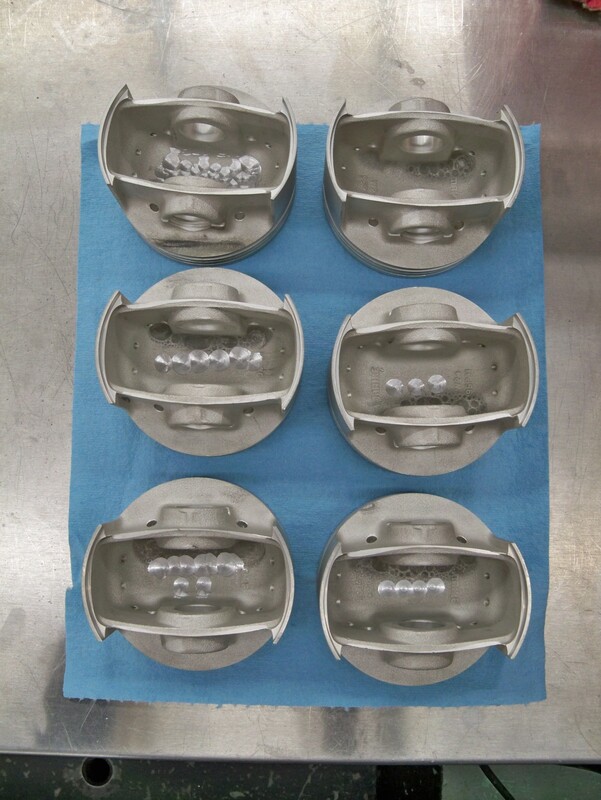 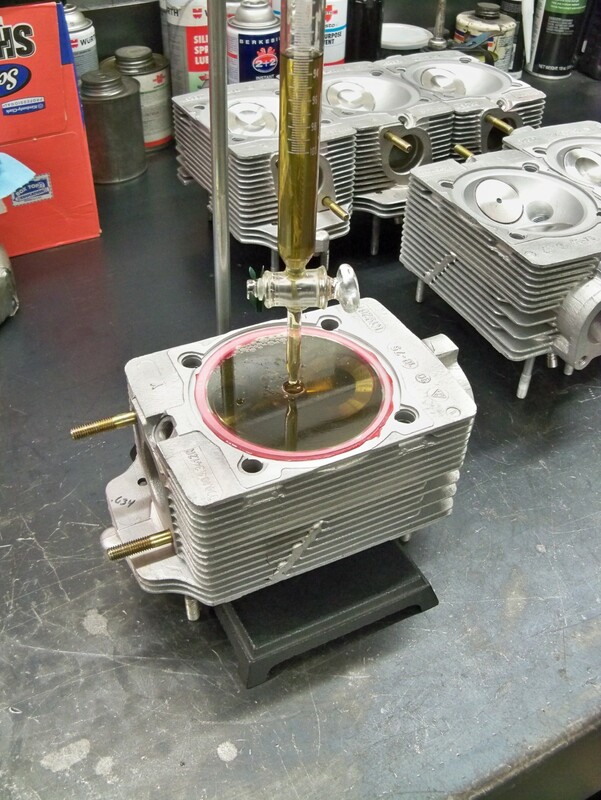 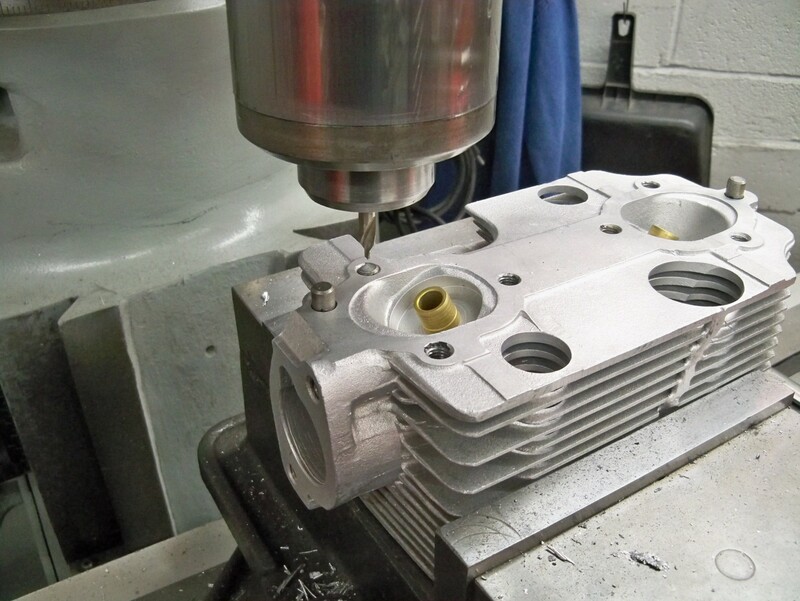 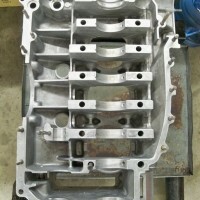 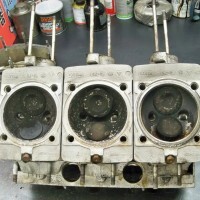 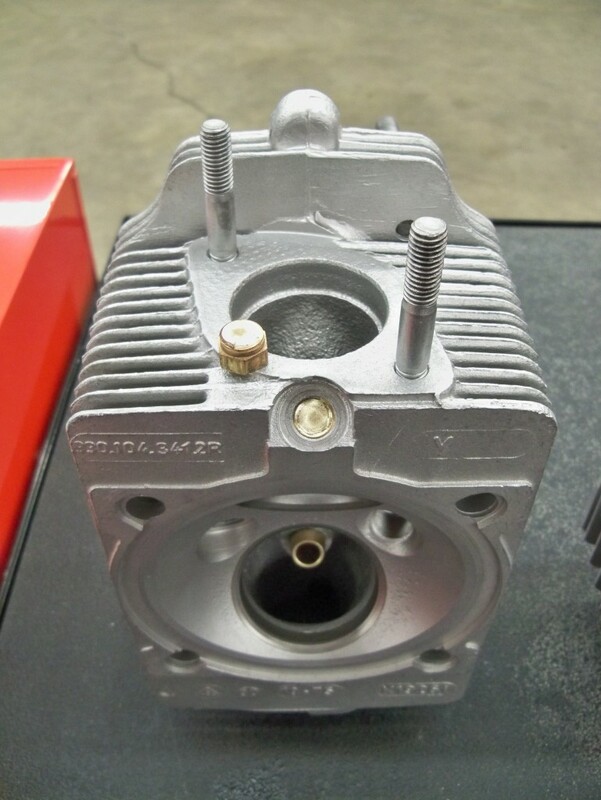 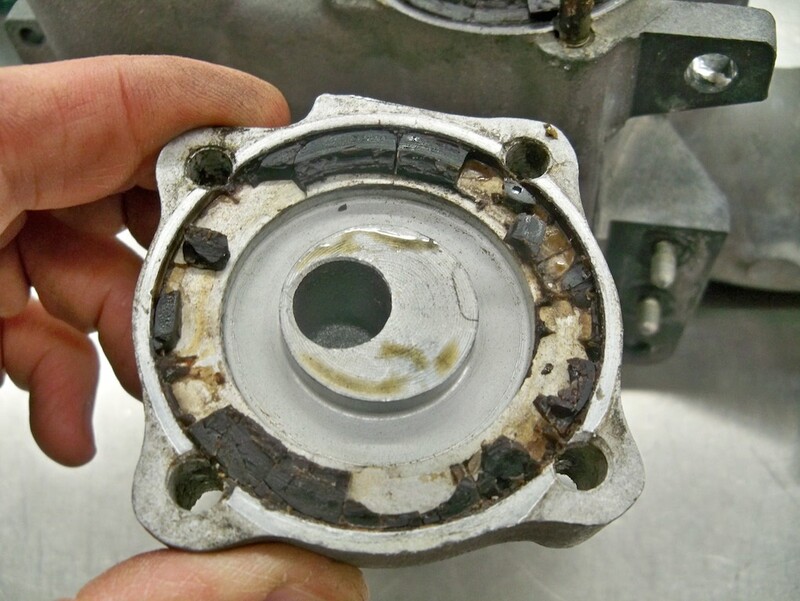 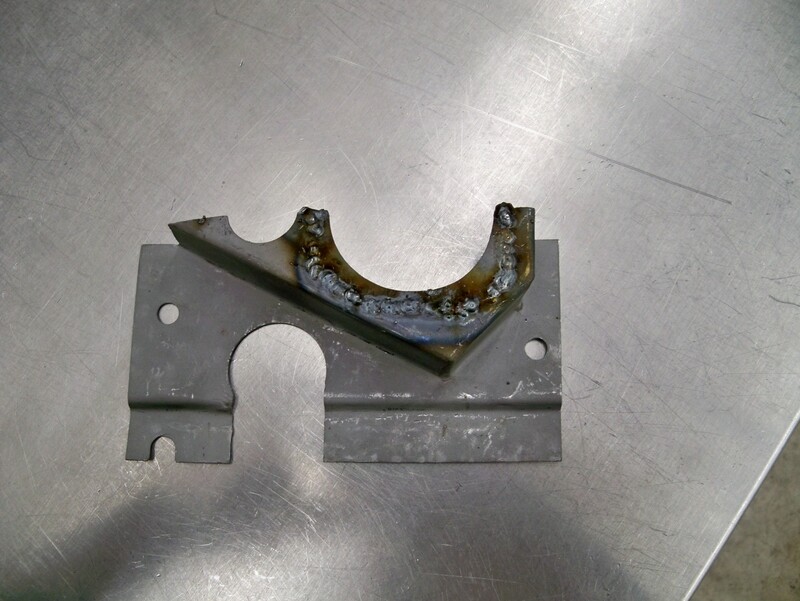 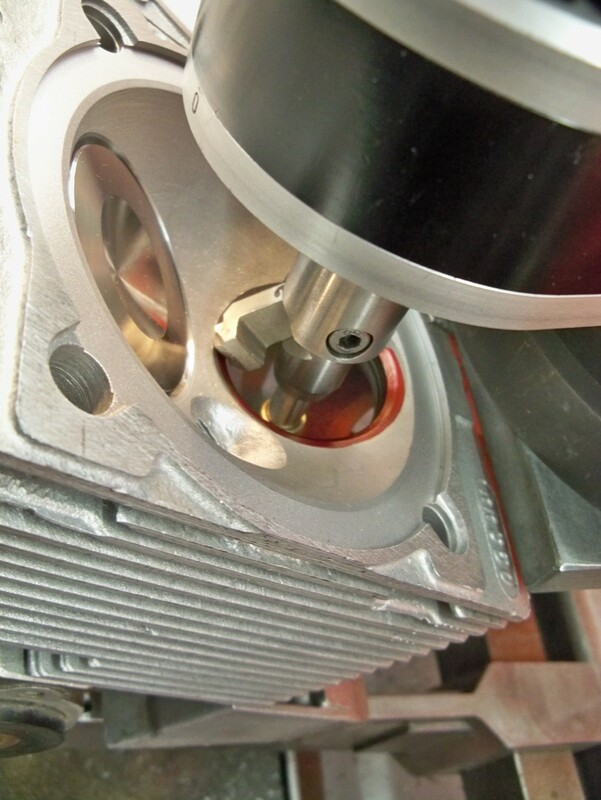 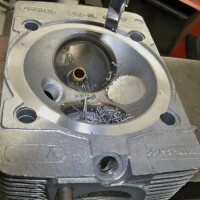 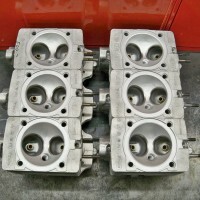 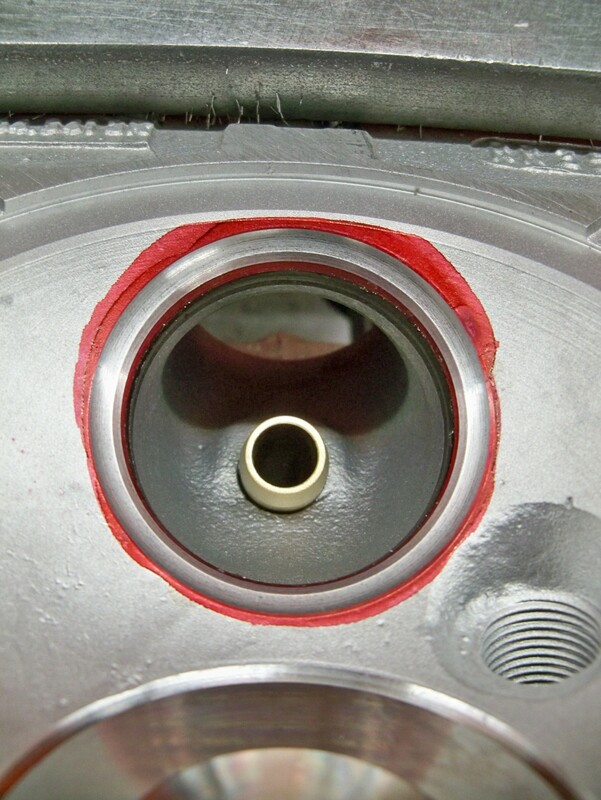 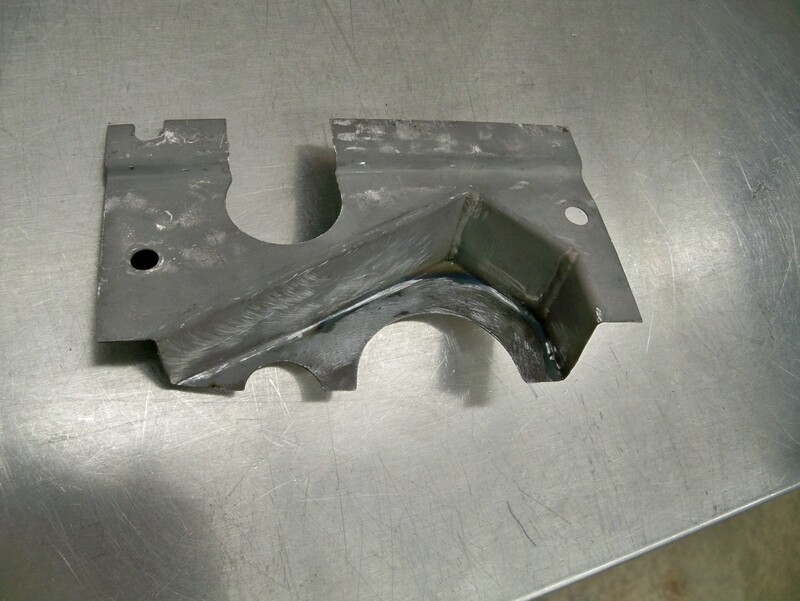 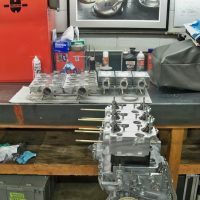 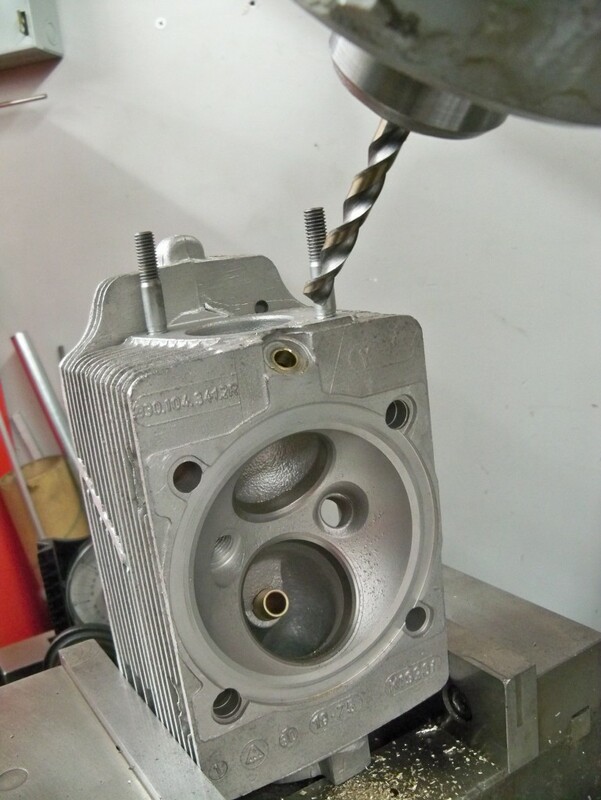 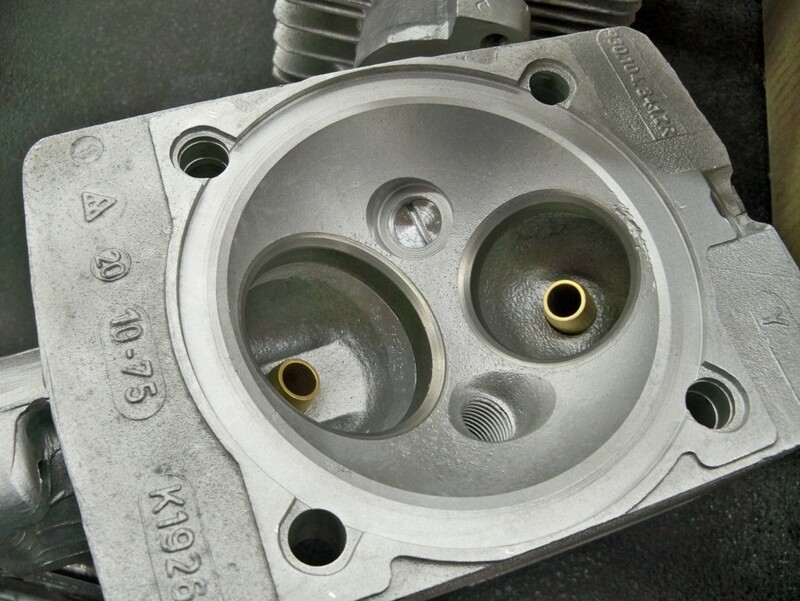 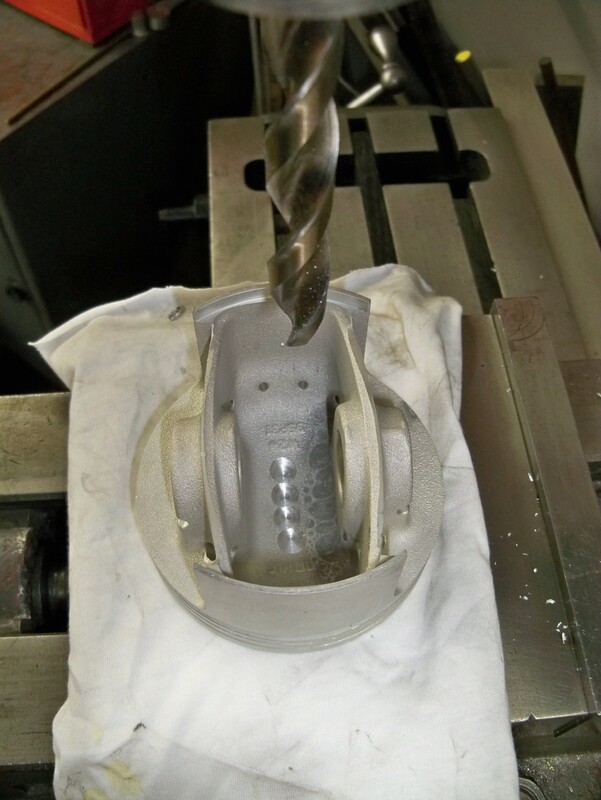 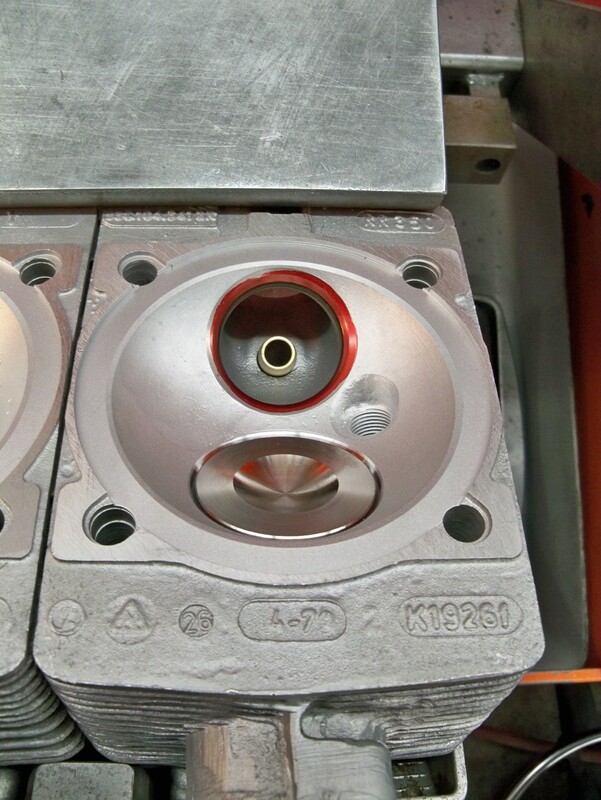 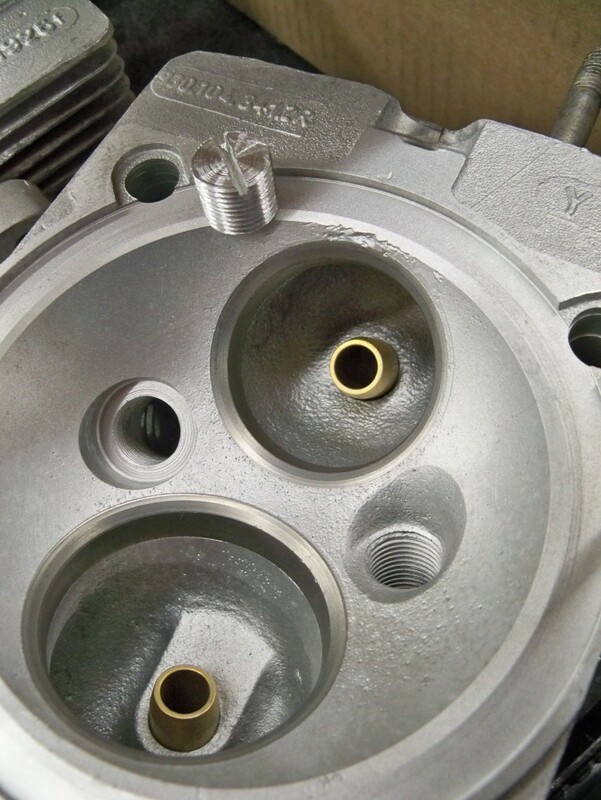 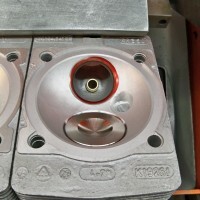 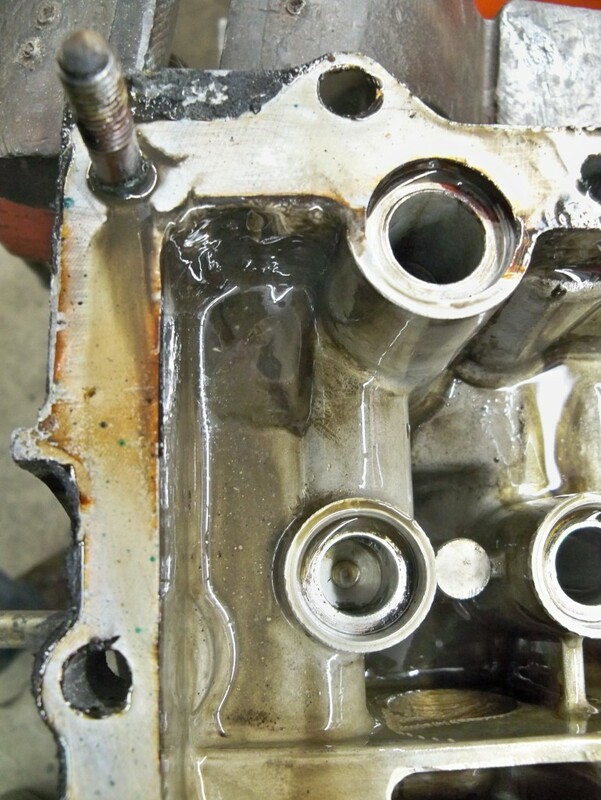 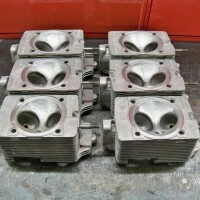 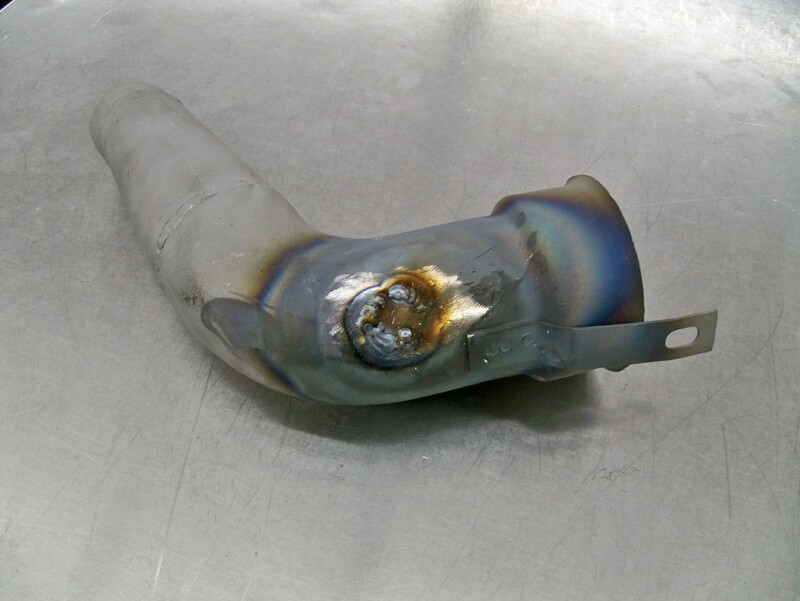 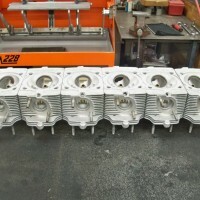 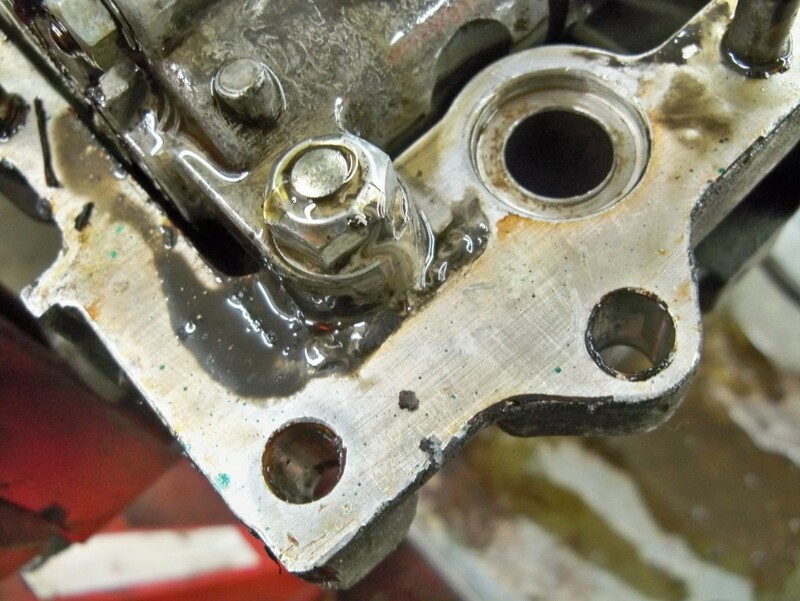 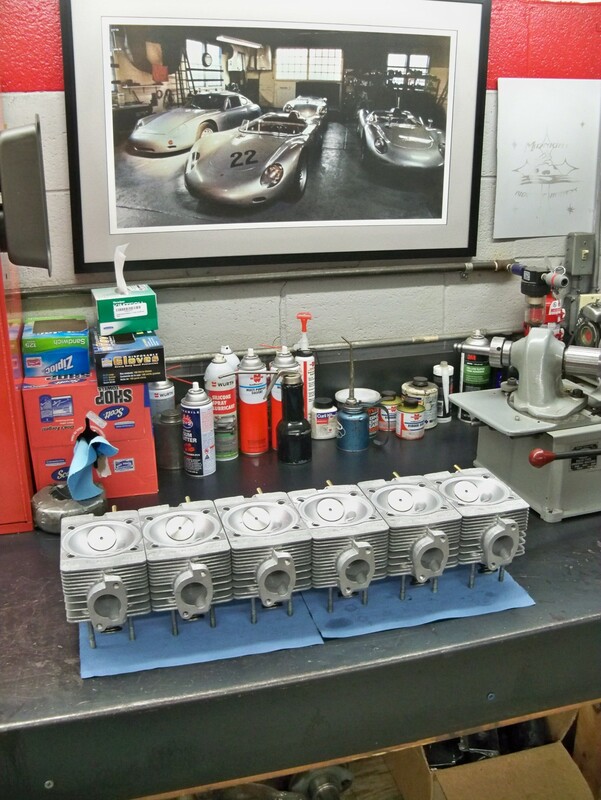 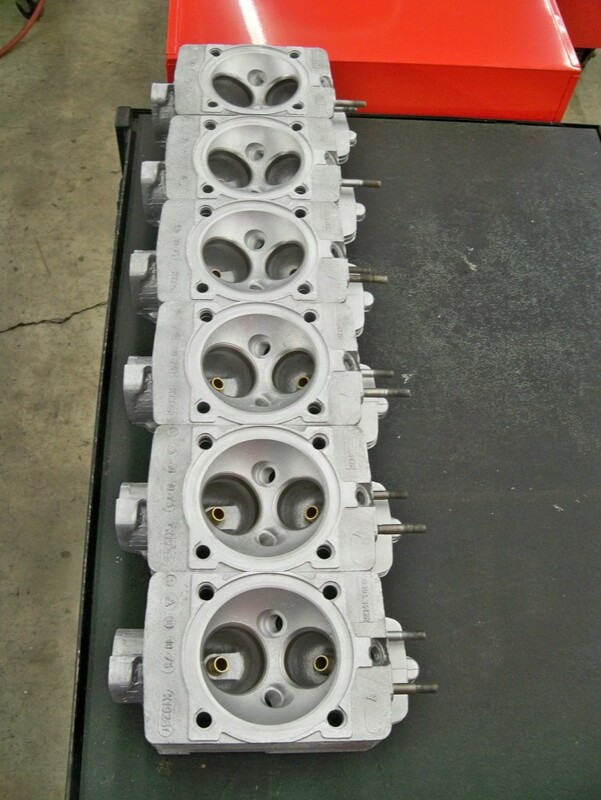 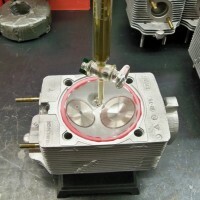 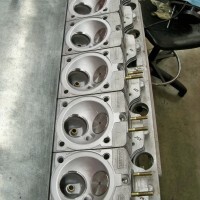 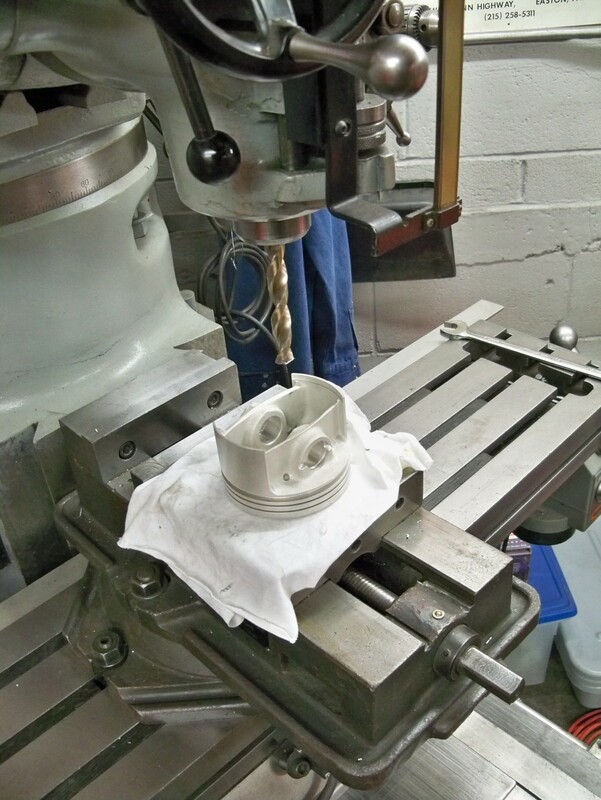 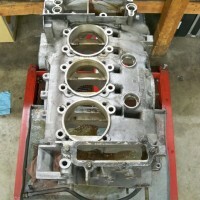 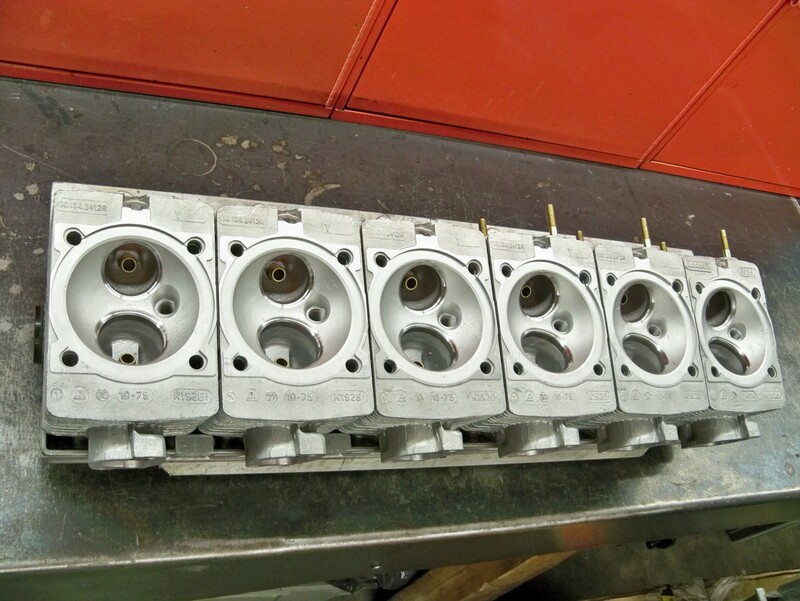 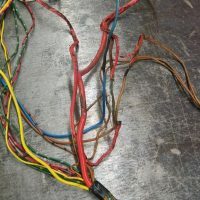 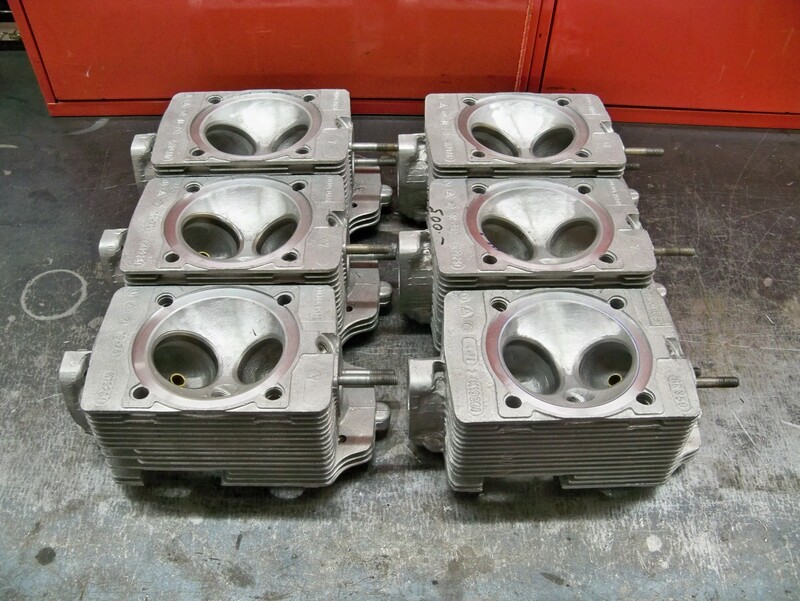 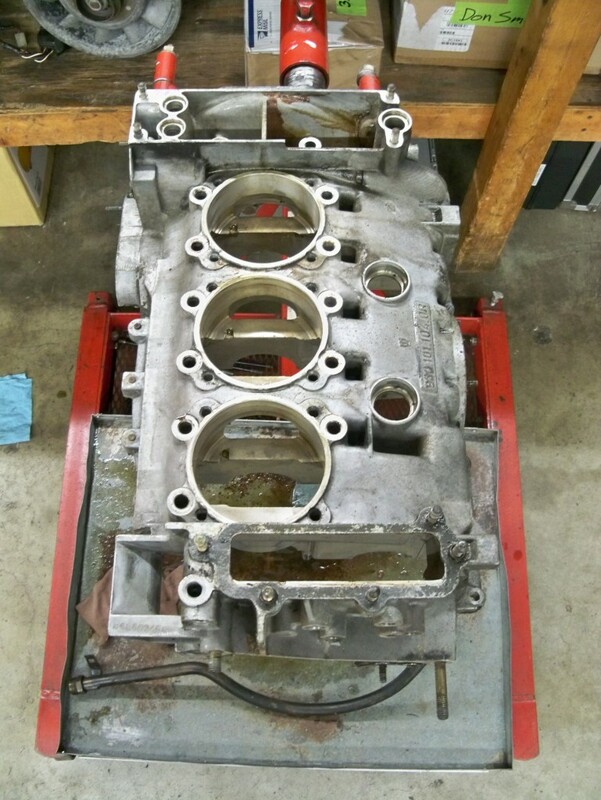 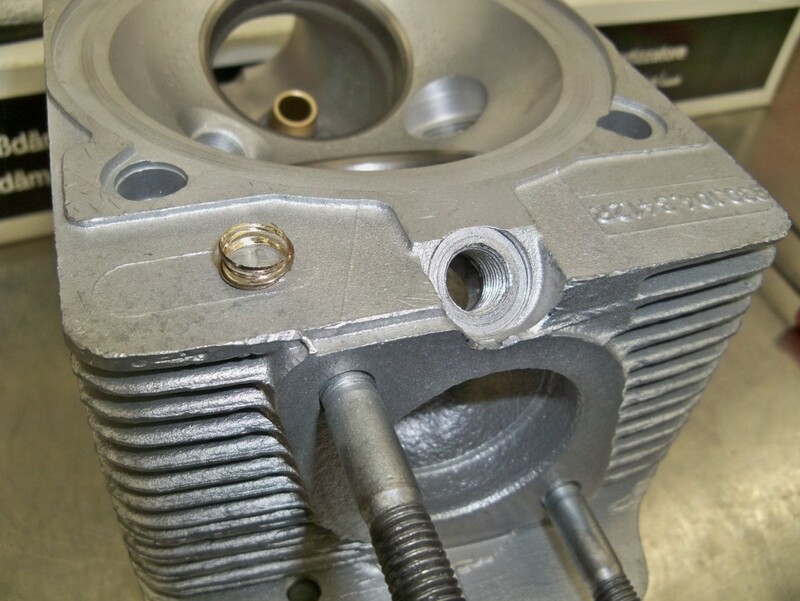 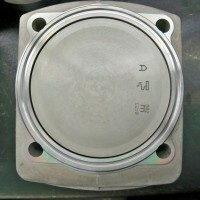 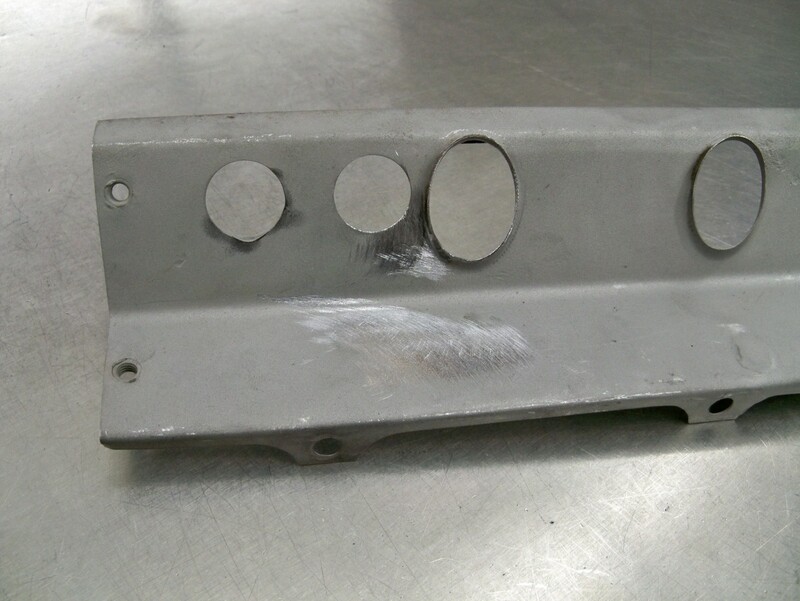 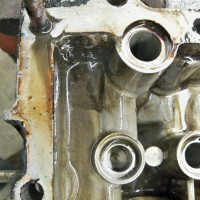 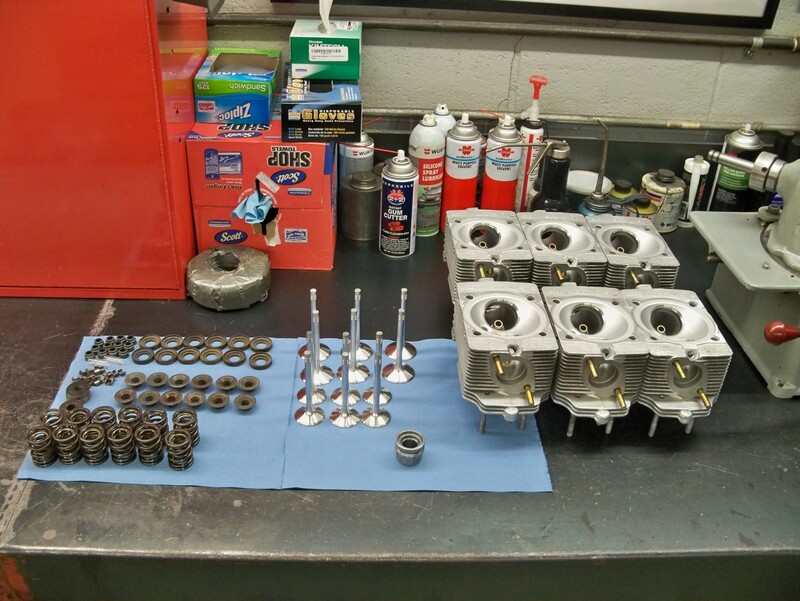 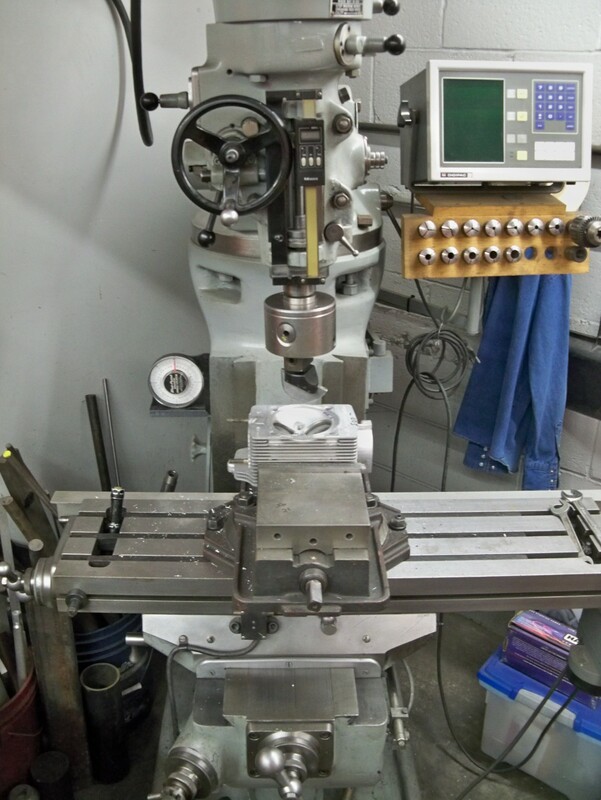 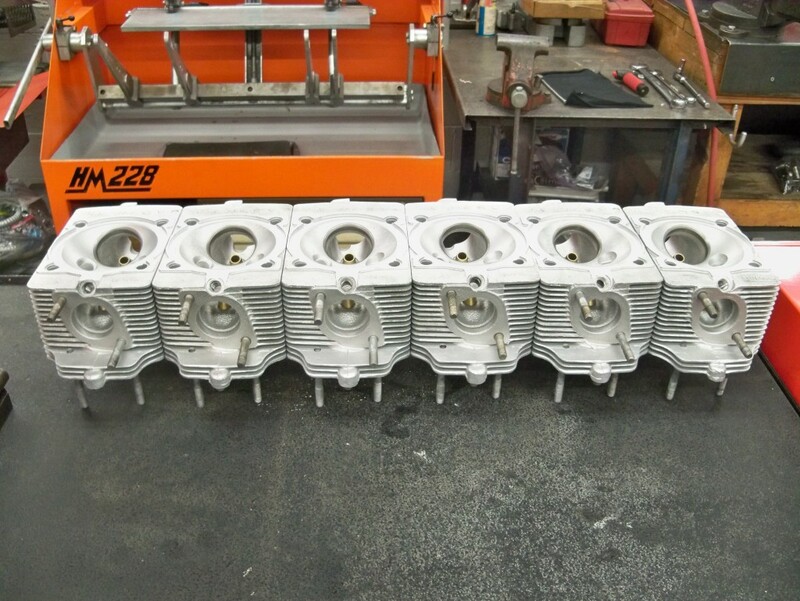 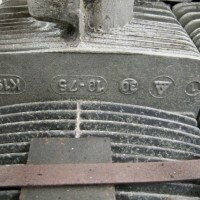 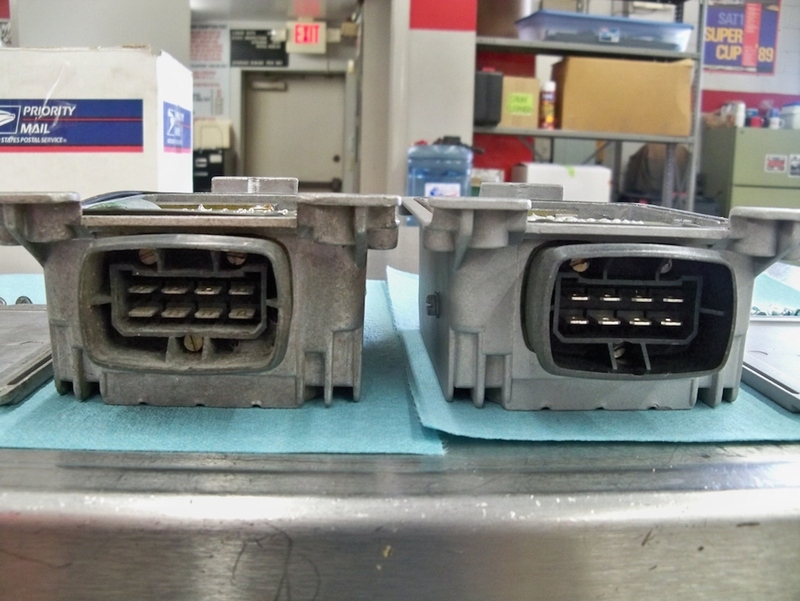 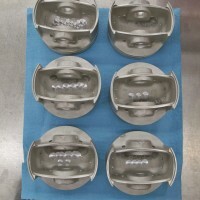 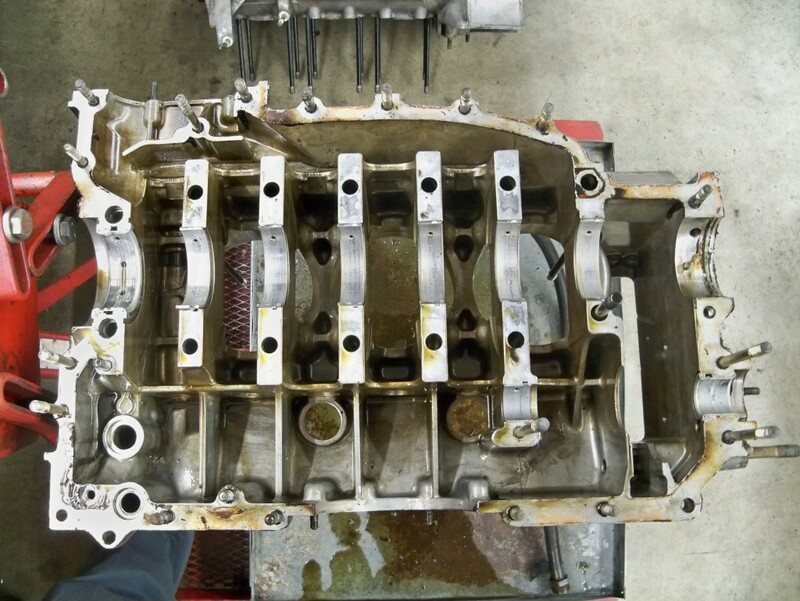 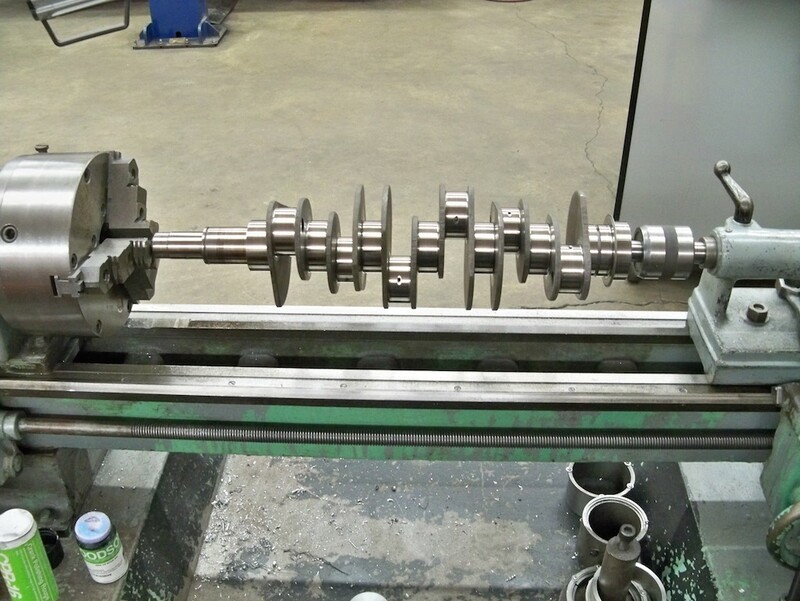 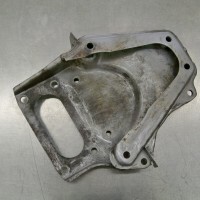 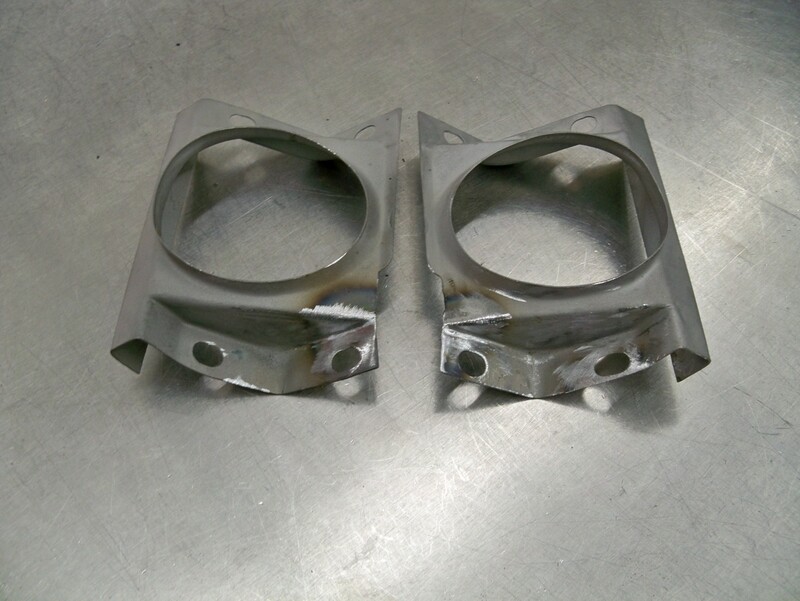 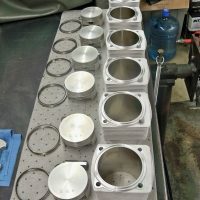 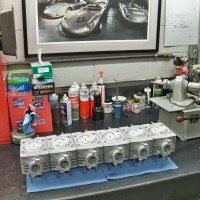 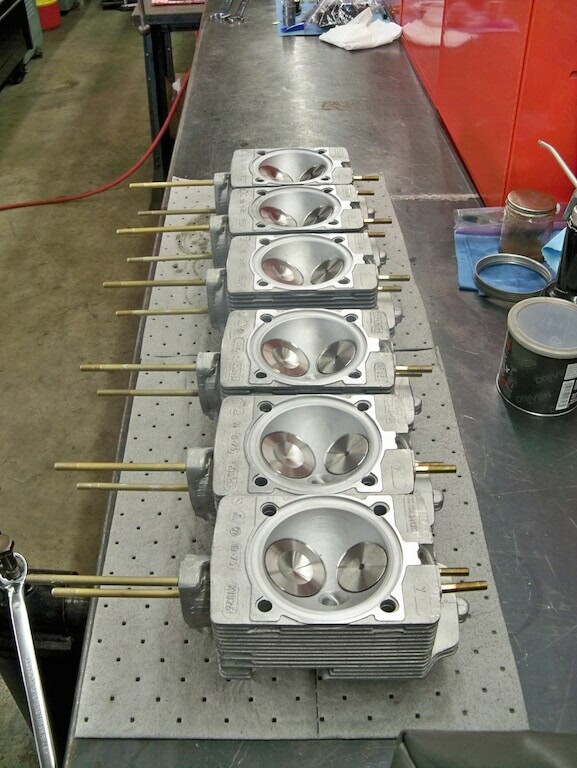 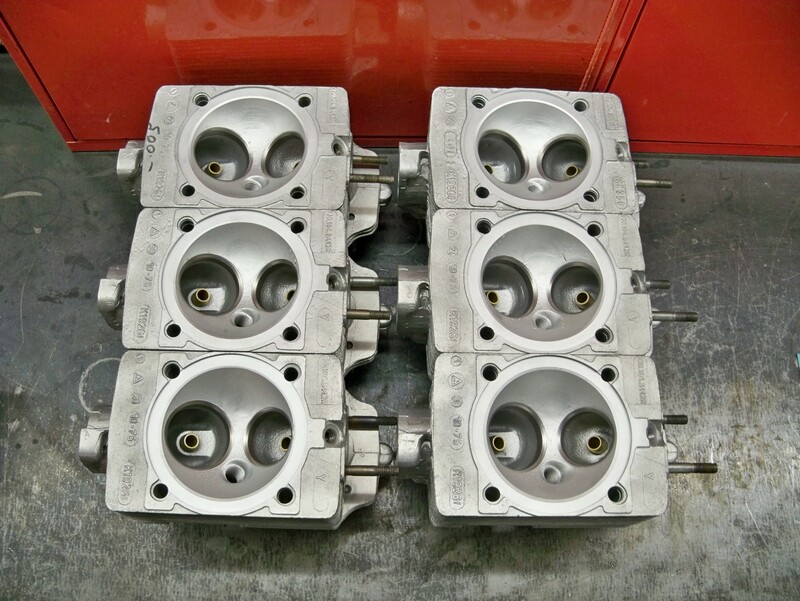 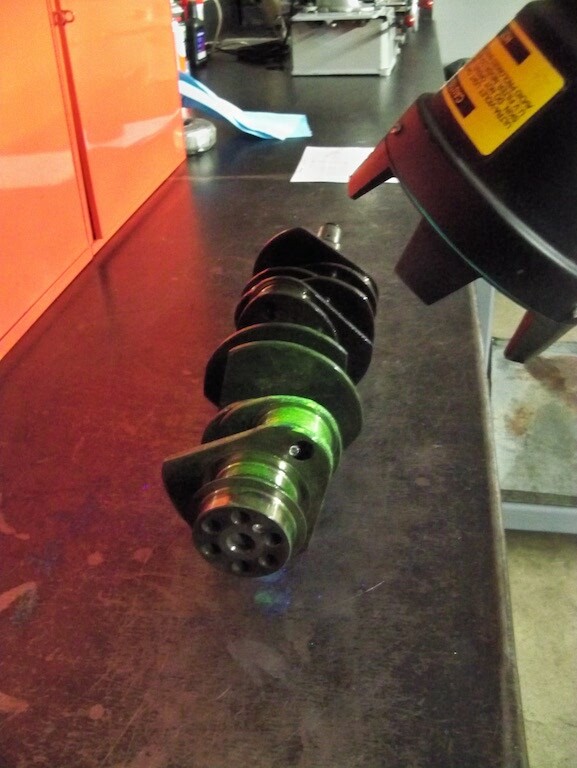 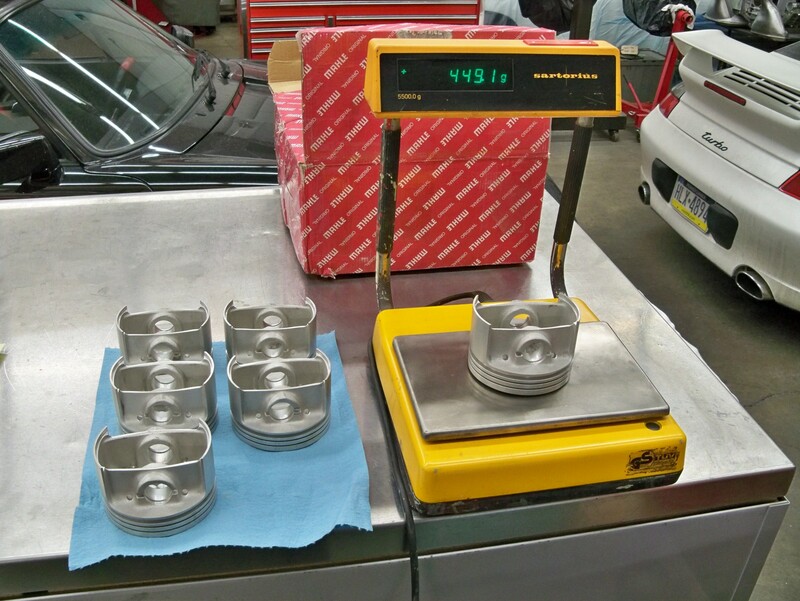 The cylinder heads were cleaned using our ultrasonic parts cleaner. 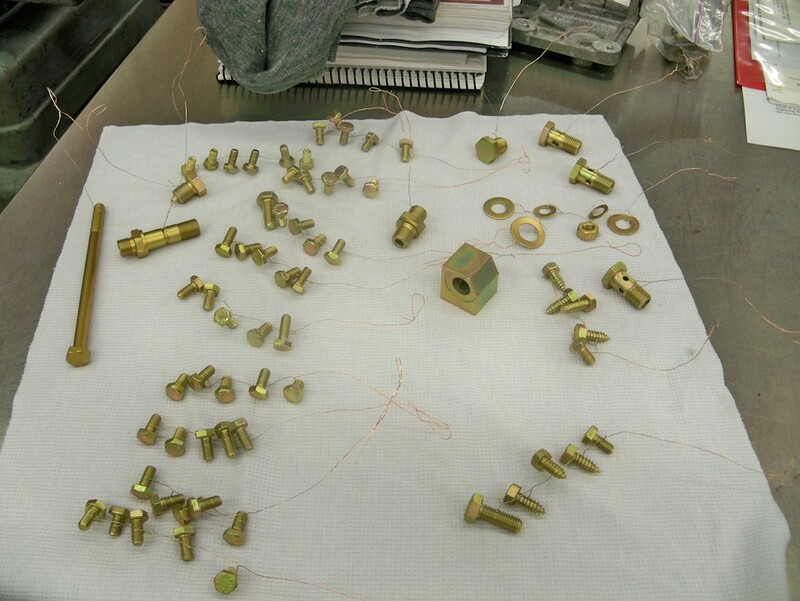 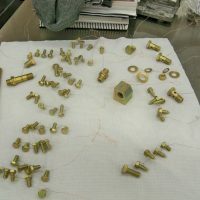 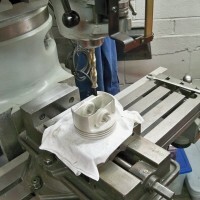 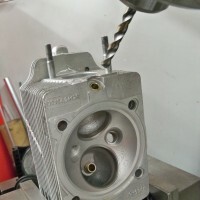 Here we machined plugs for the additional spark plug. 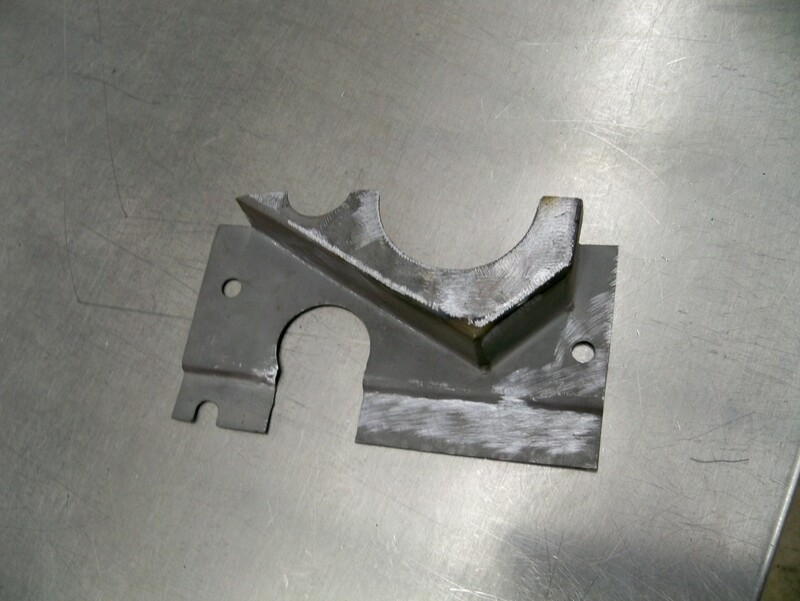 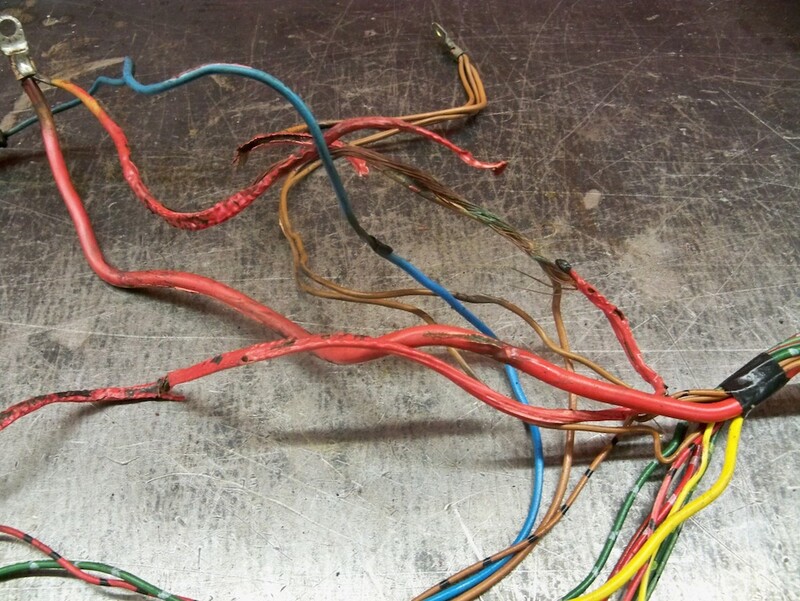 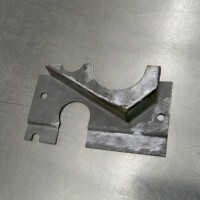 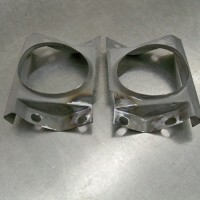 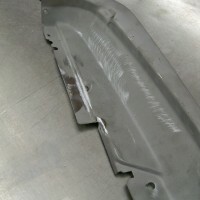 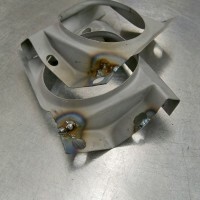 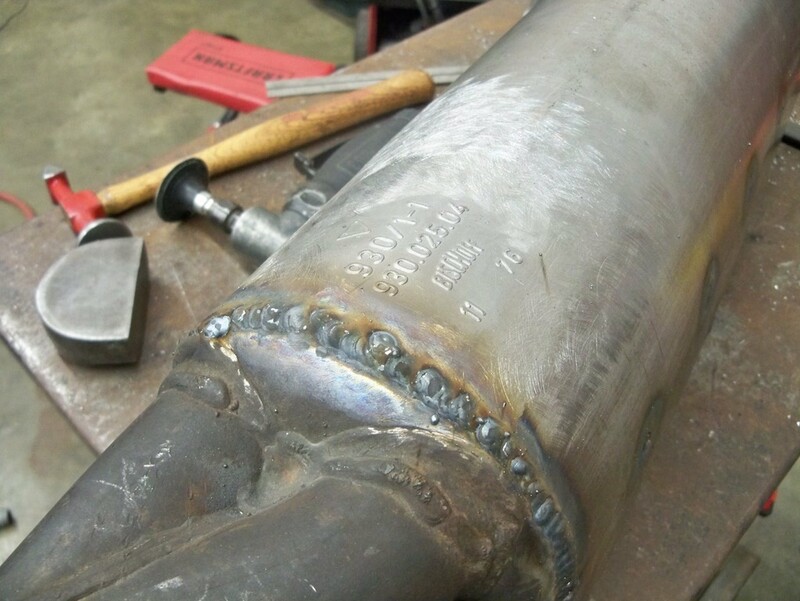 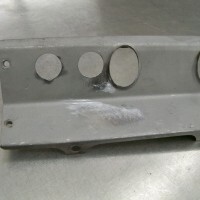 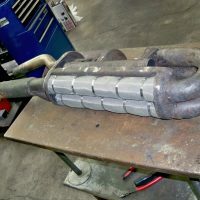 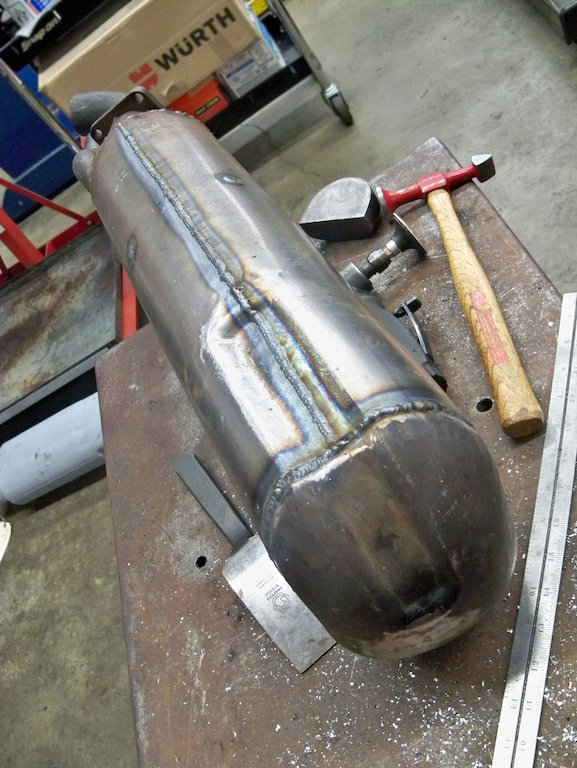 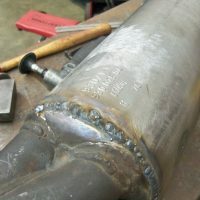 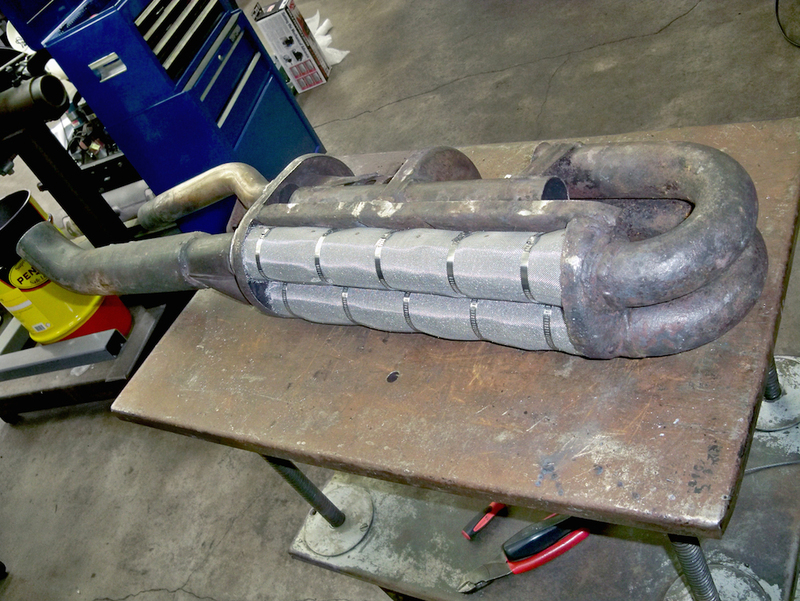 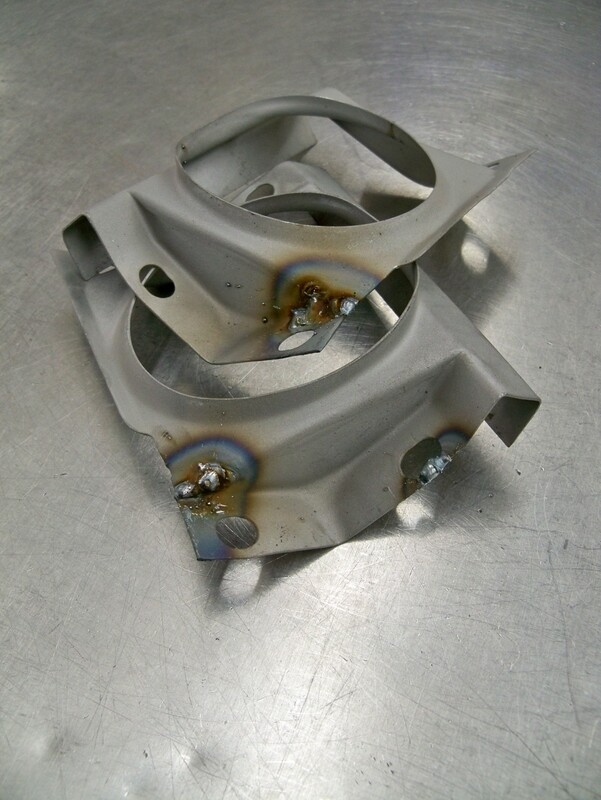 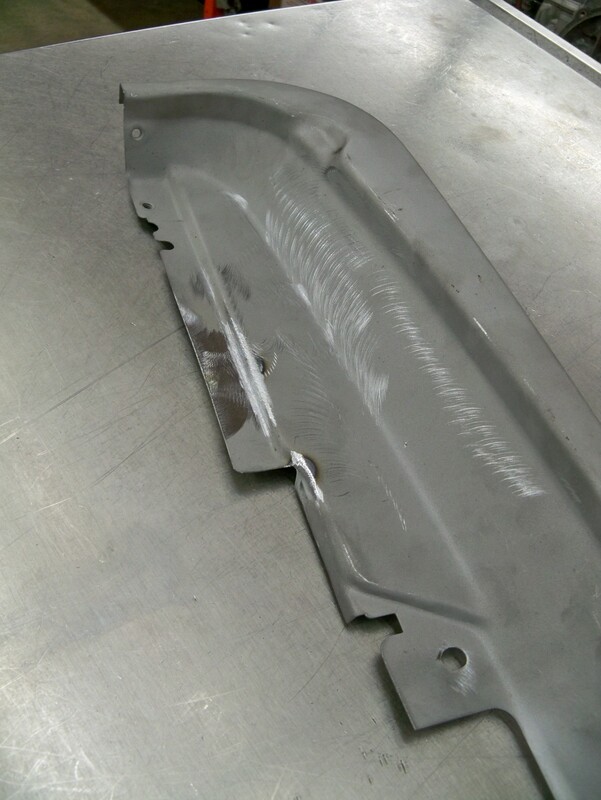 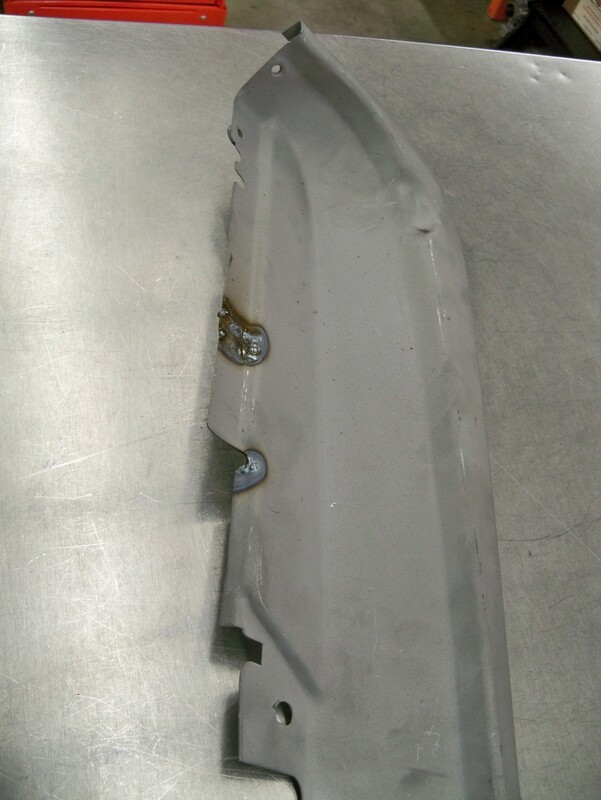 We will be welding these in place. 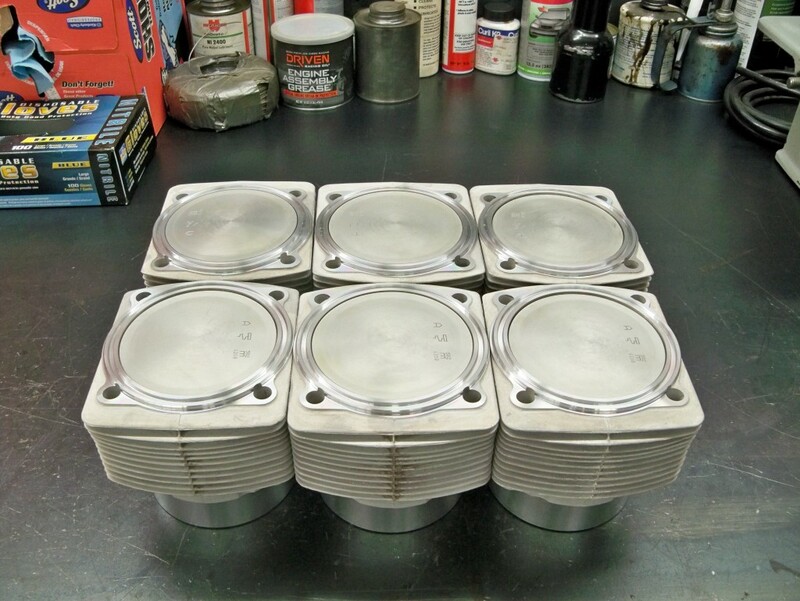 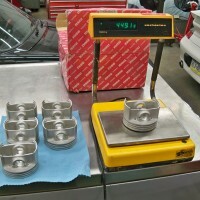 New original 95mm 6.5 – 1 compression ratio Mahle pistons and cylinders. 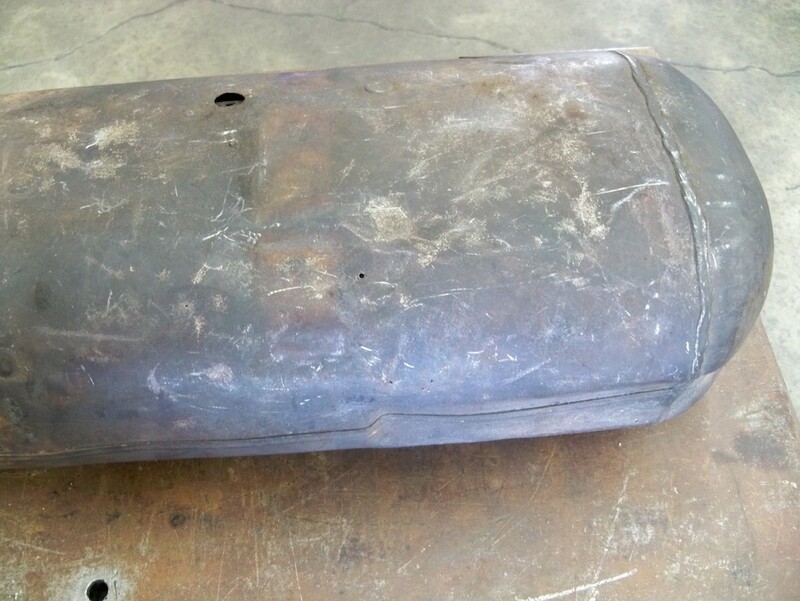 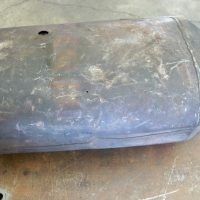 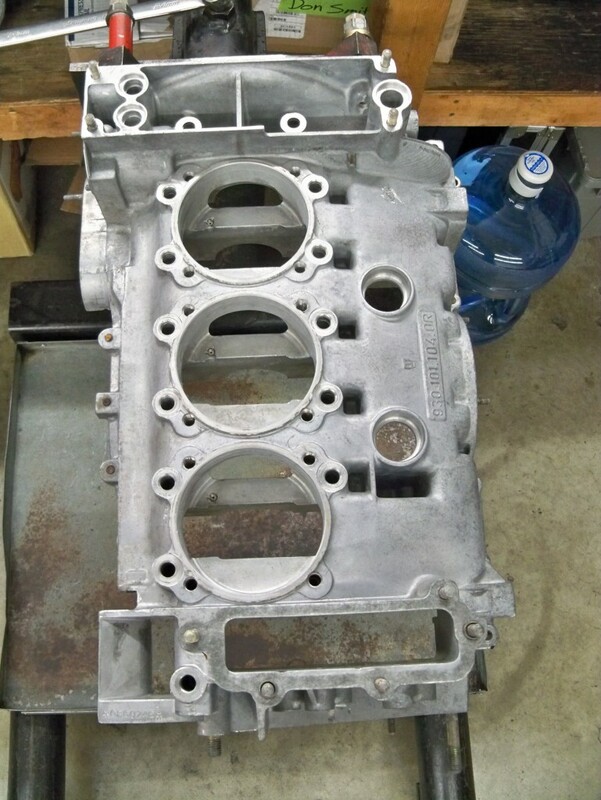 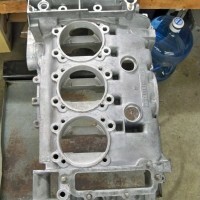 Engine tin is ready to be sand blasted and refinished. 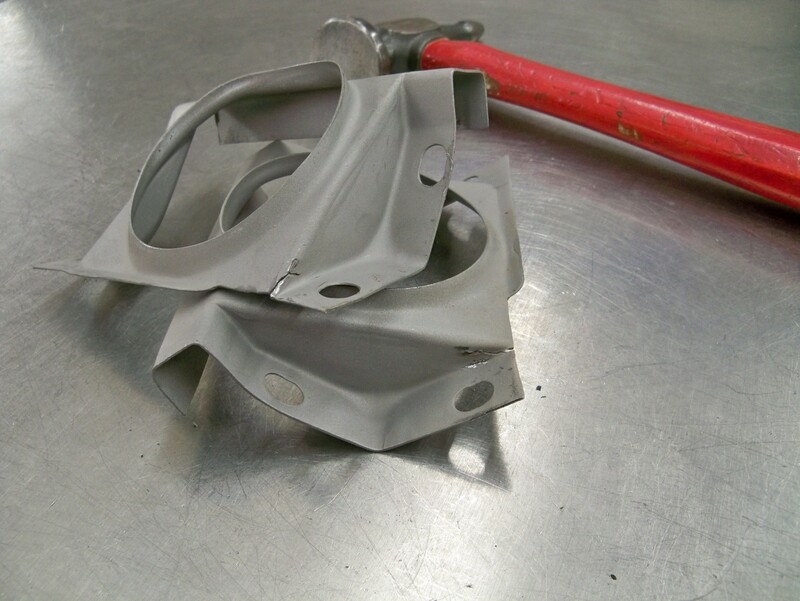 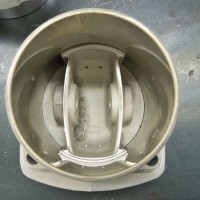 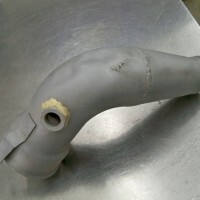 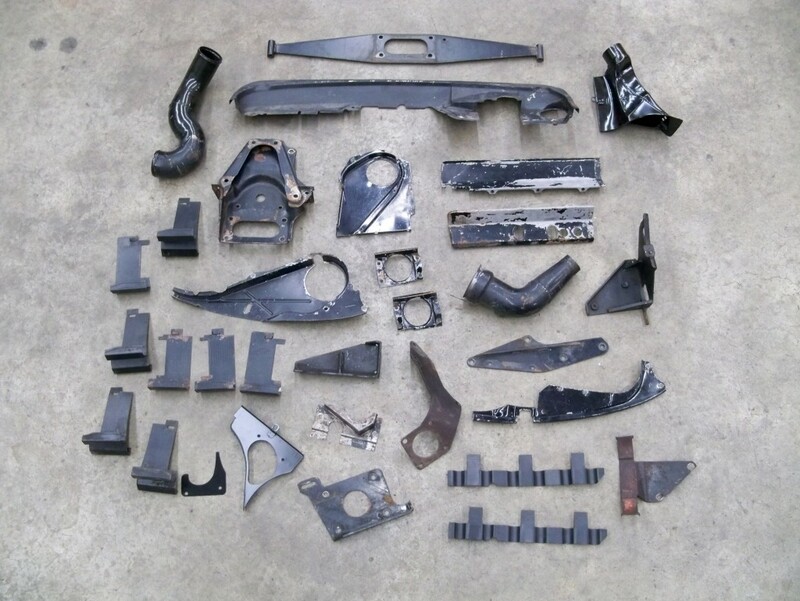 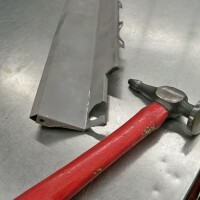 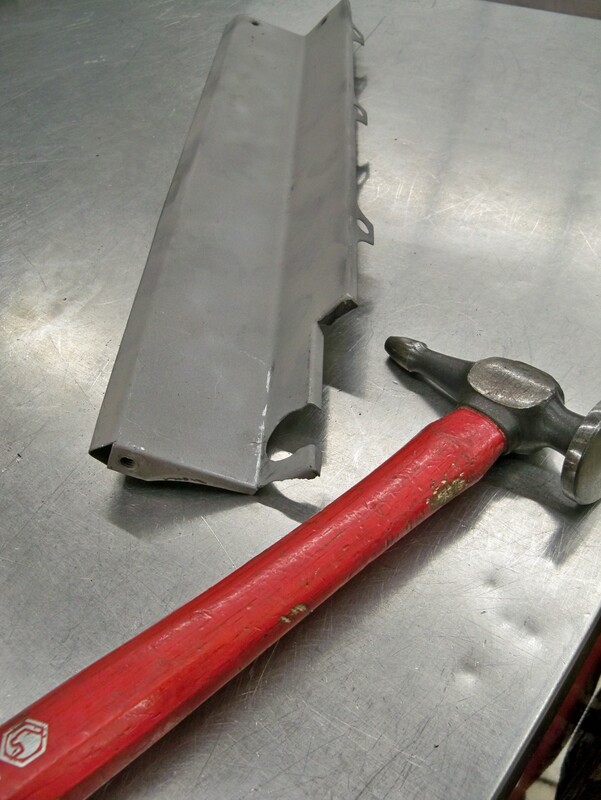 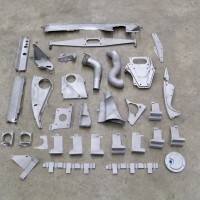 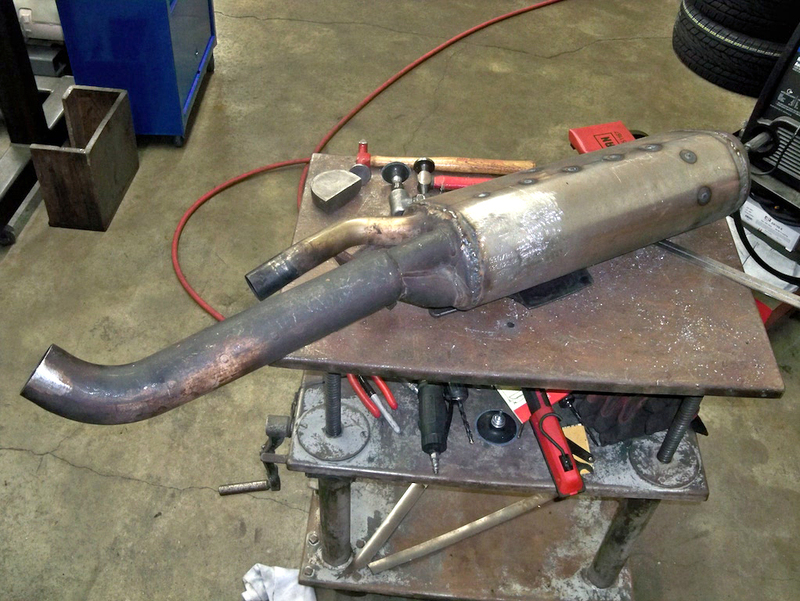 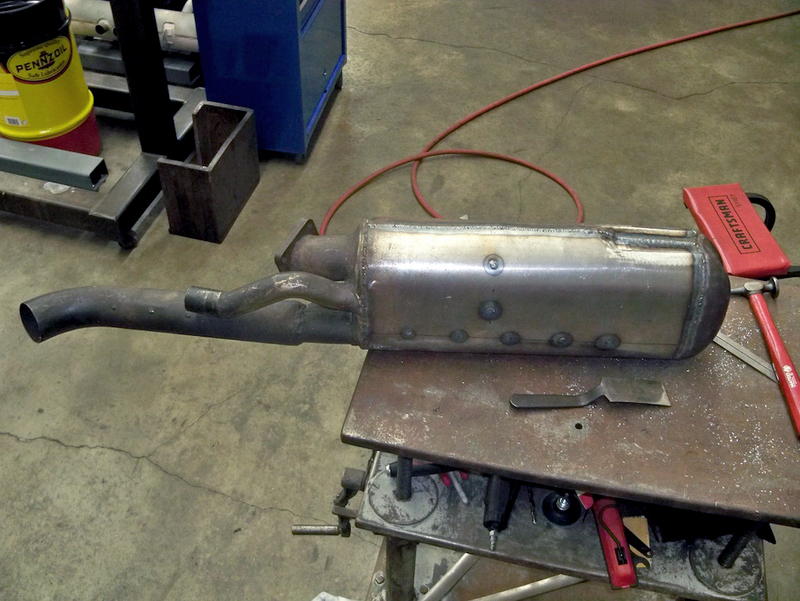 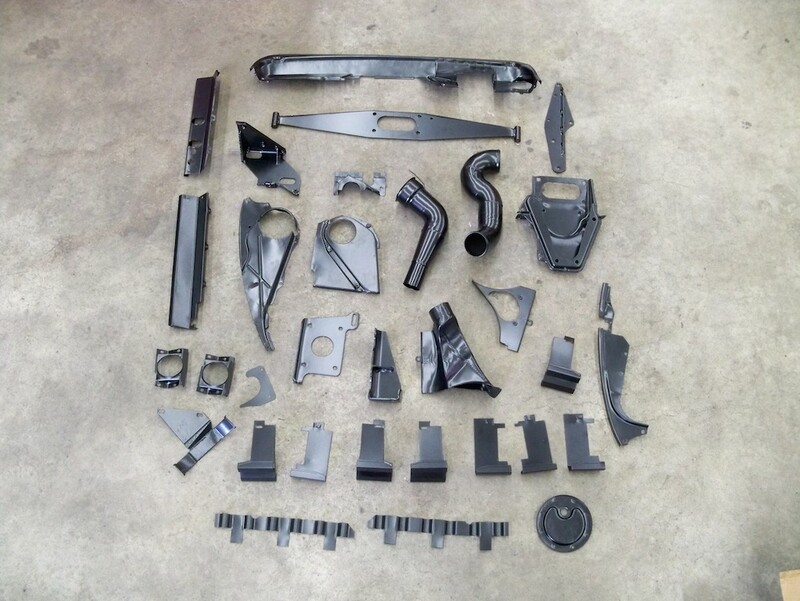 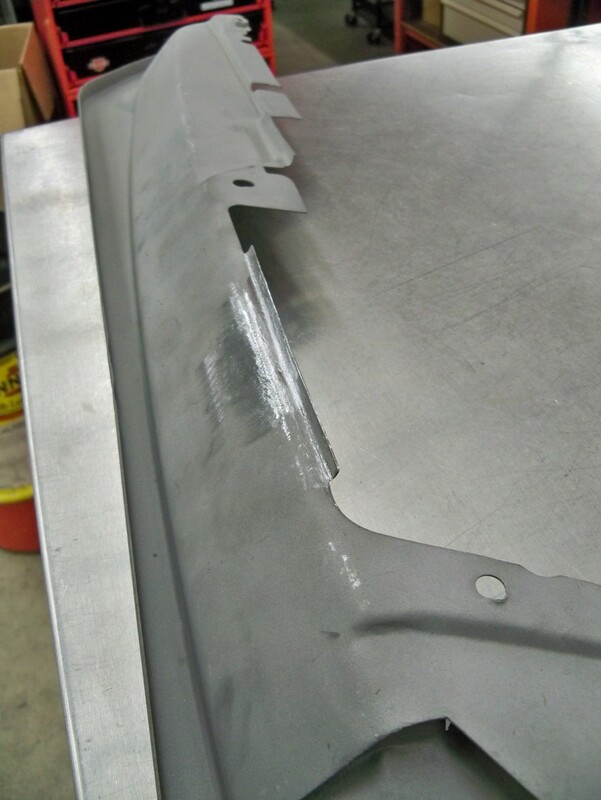 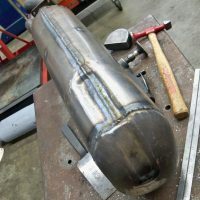 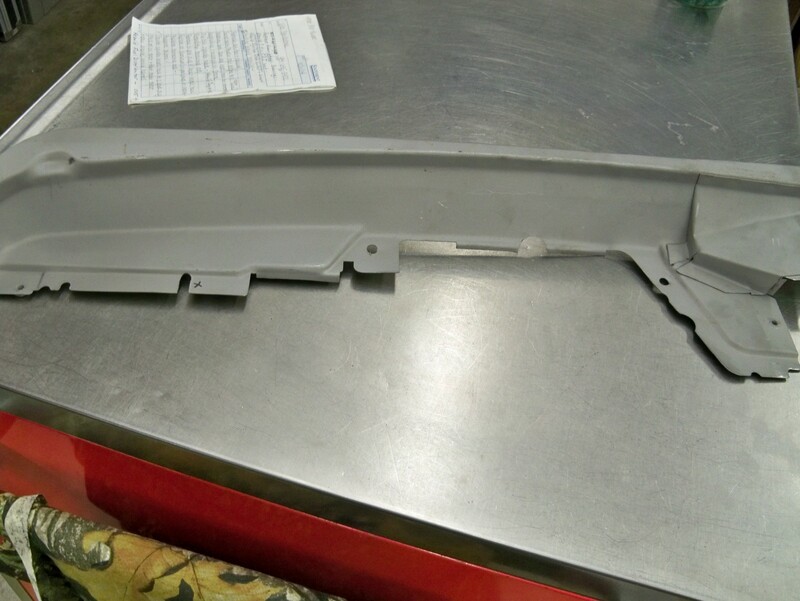 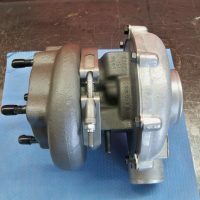 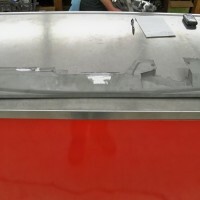 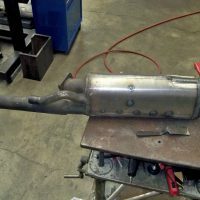 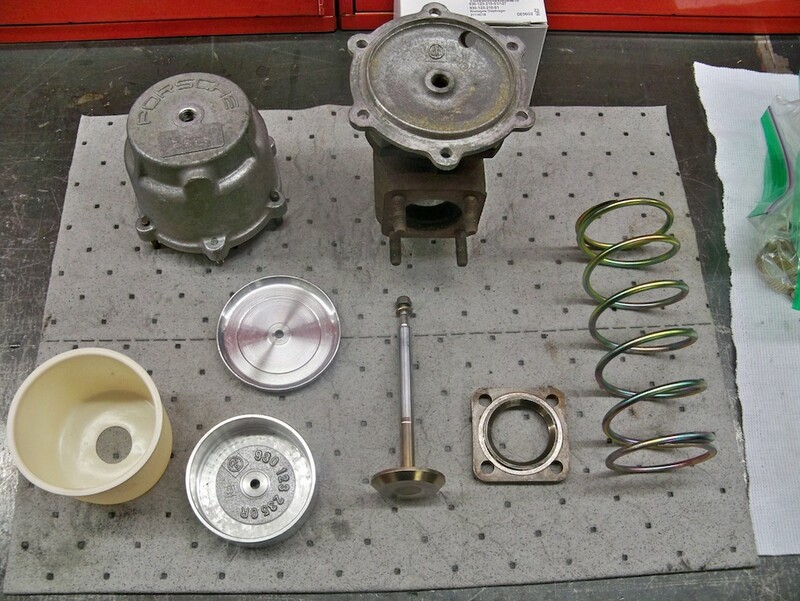 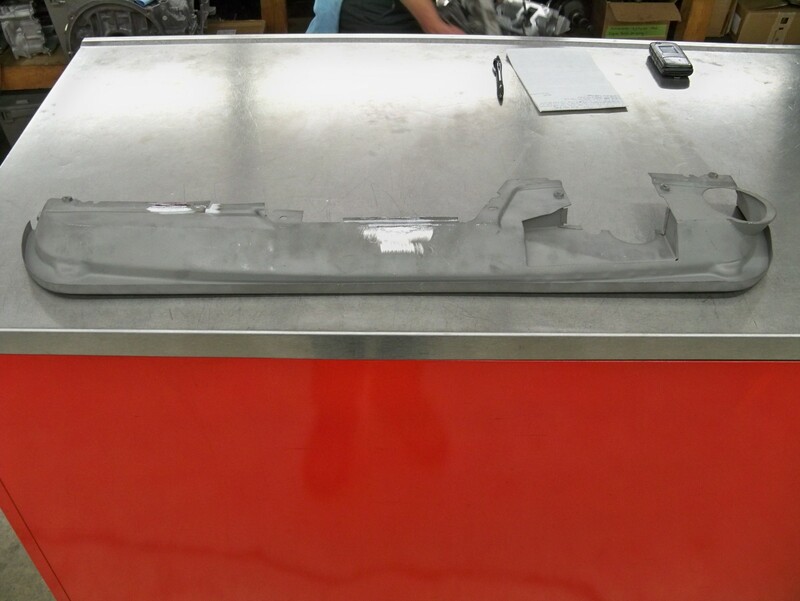 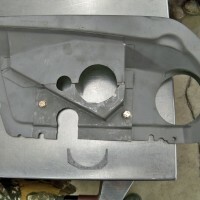 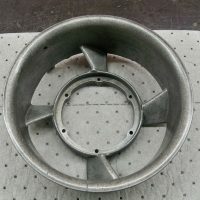 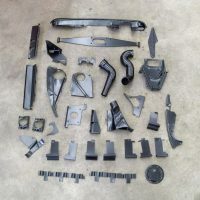 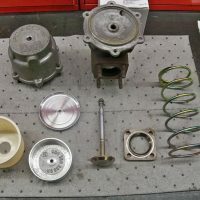 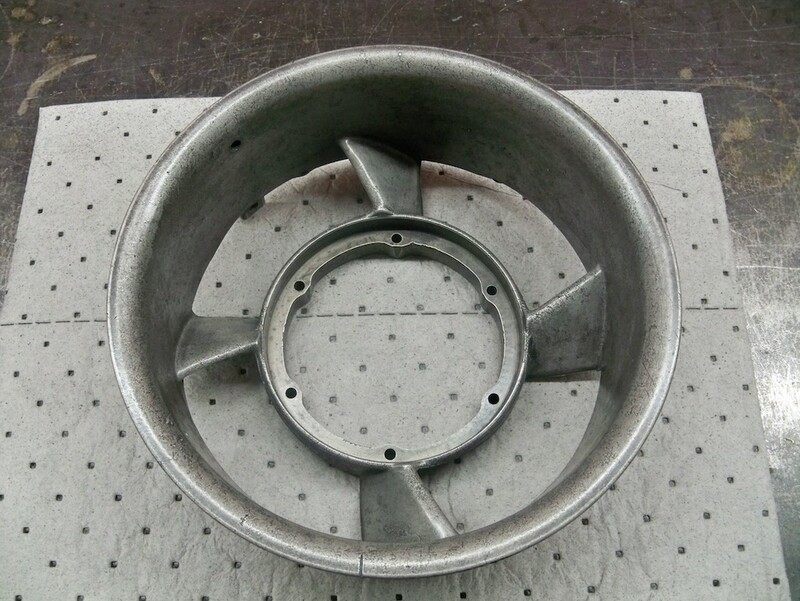 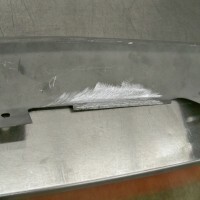 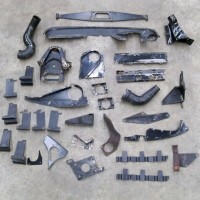 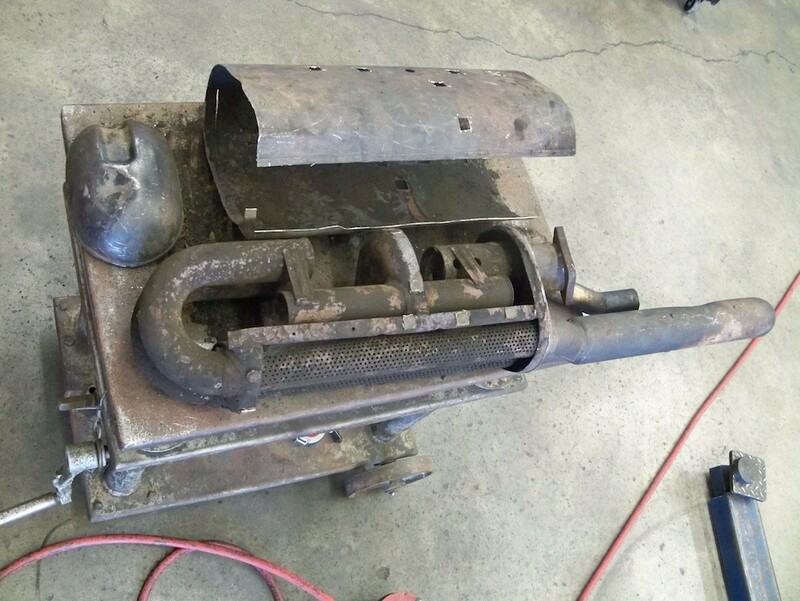 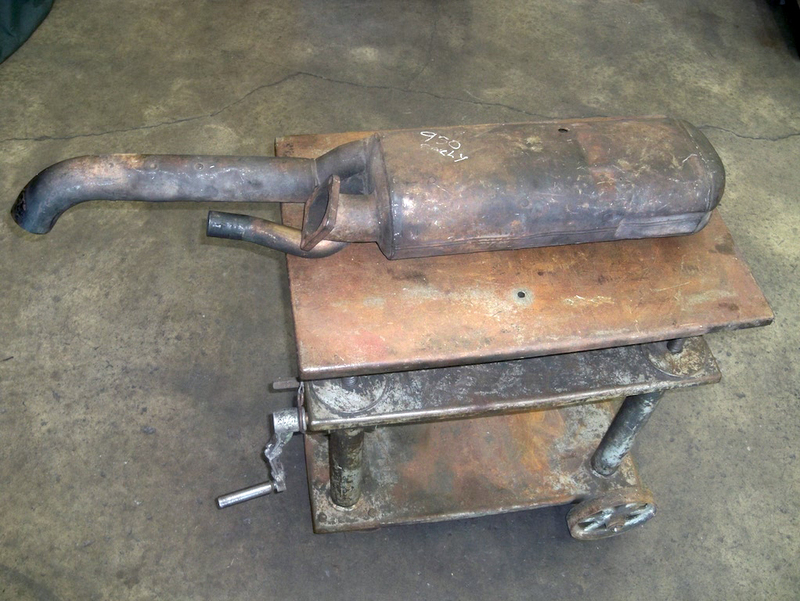 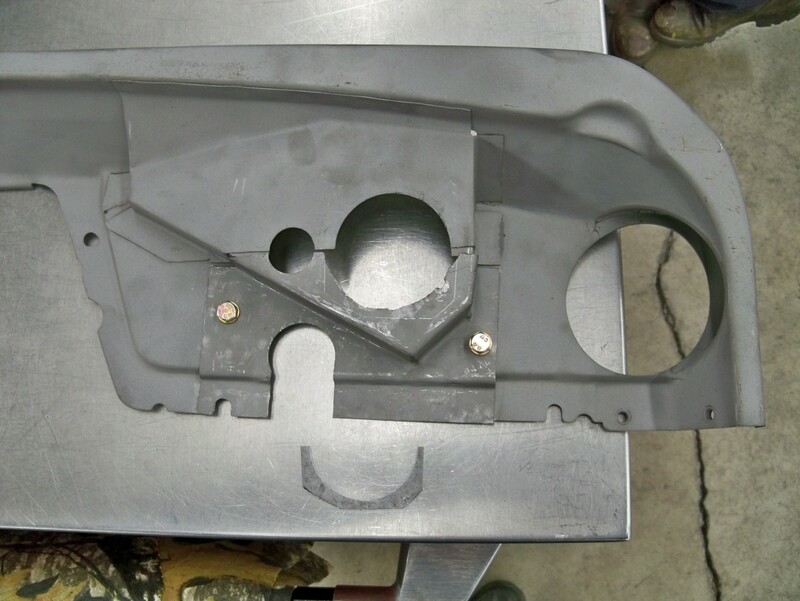 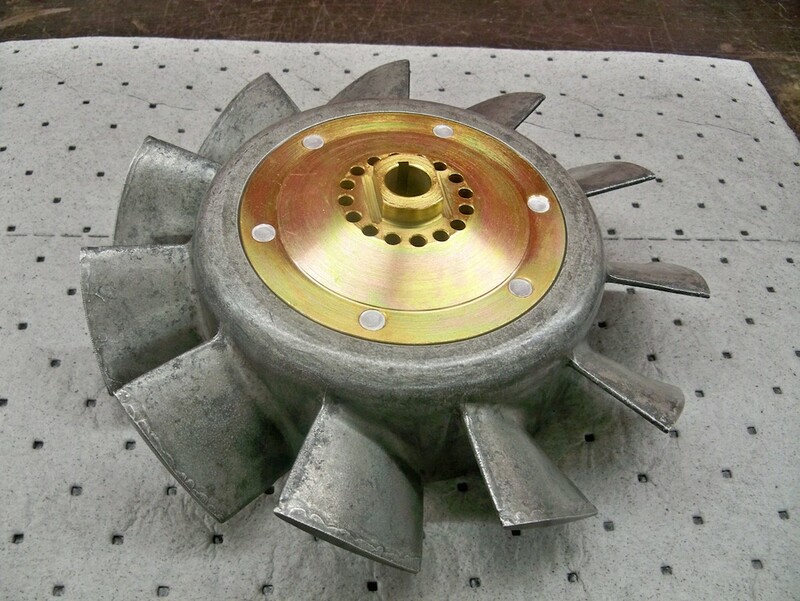 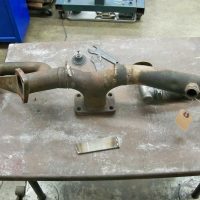 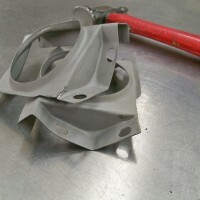 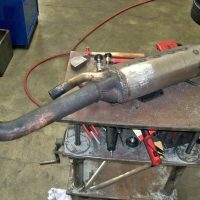 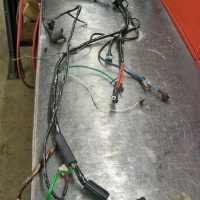 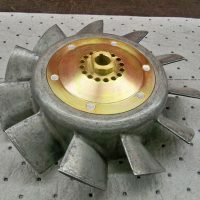 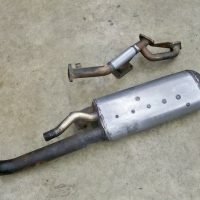 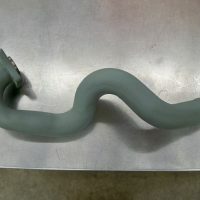 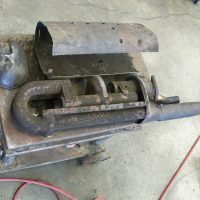 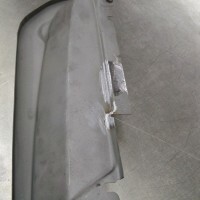 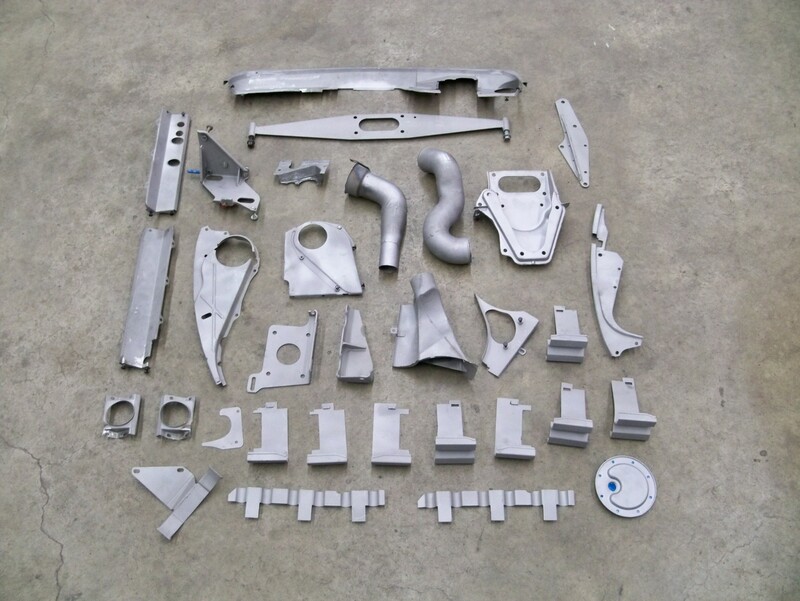 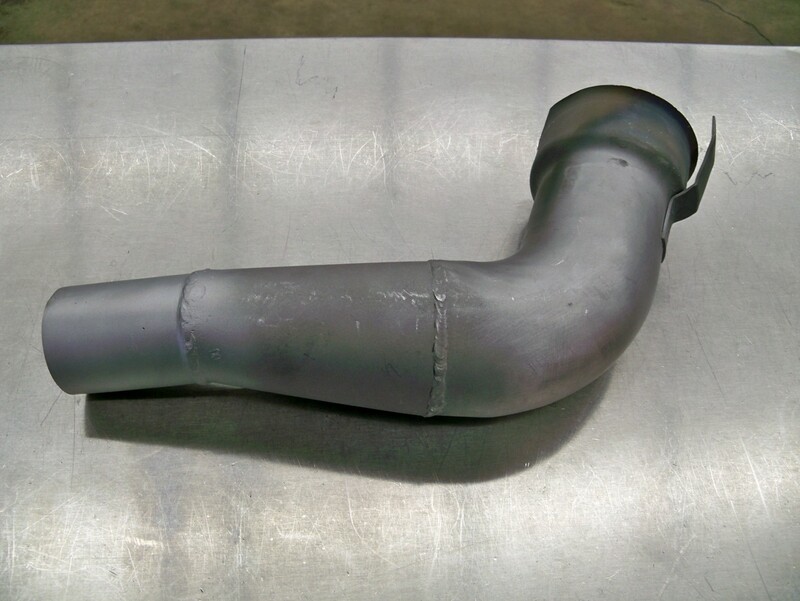 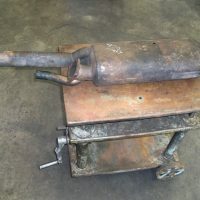 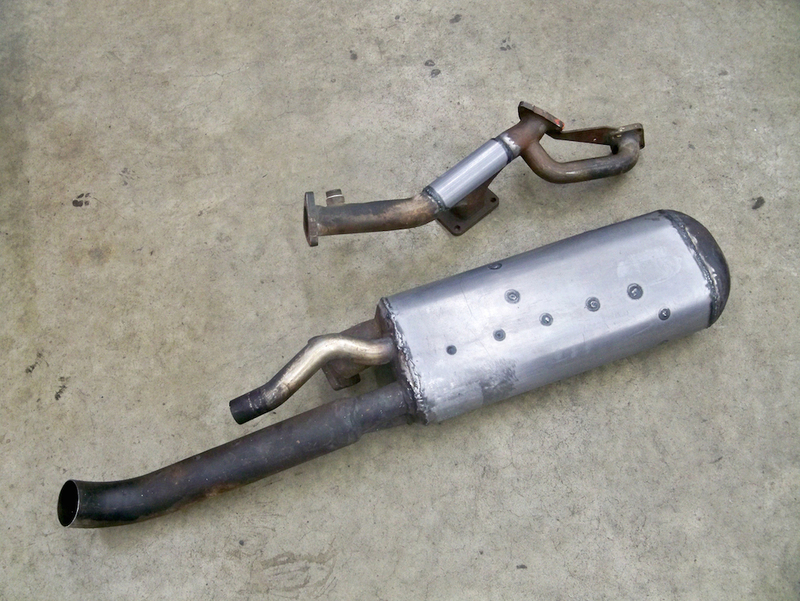 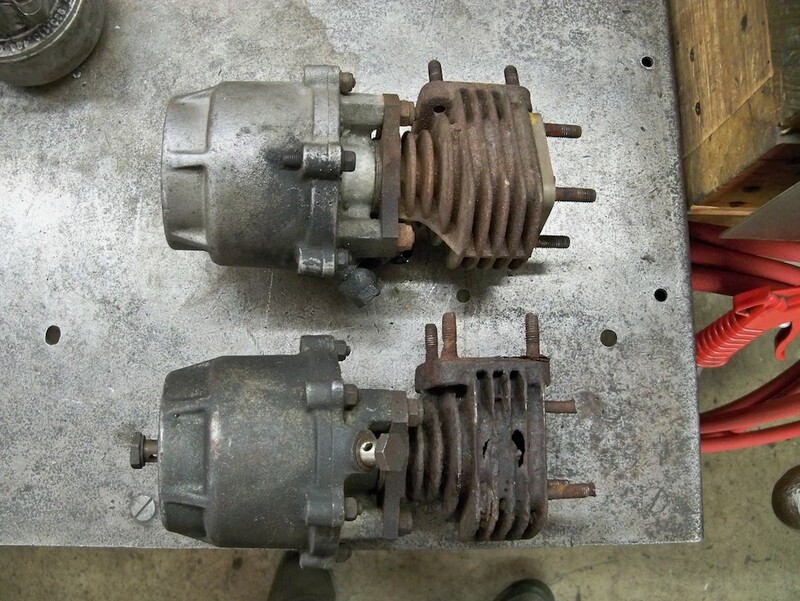 Parts have been sand blasted and metal fabrication & restoration is now complete. 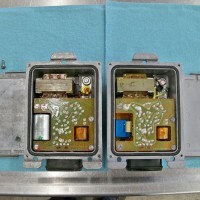 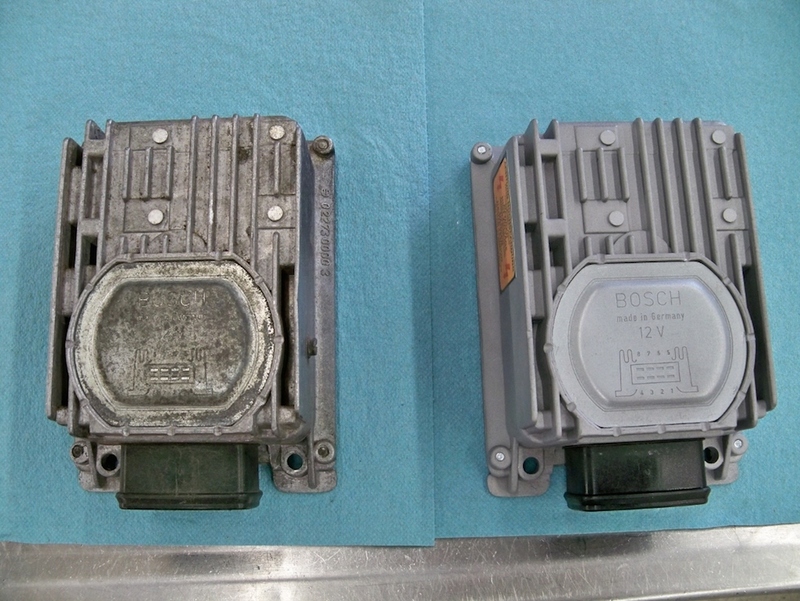 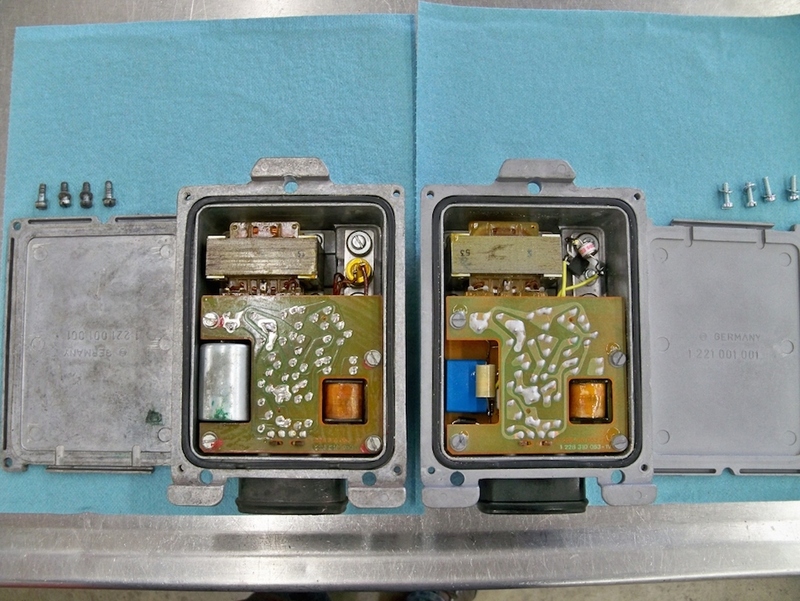 Side by side view of an untouched original CDI unit, and the newly completely rebuild one. 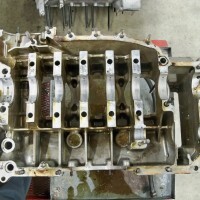 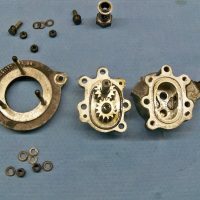 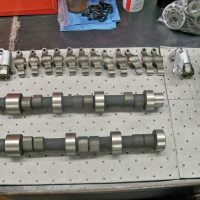 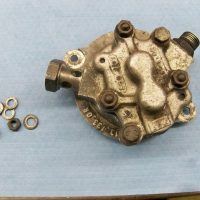 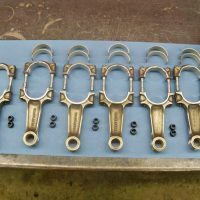 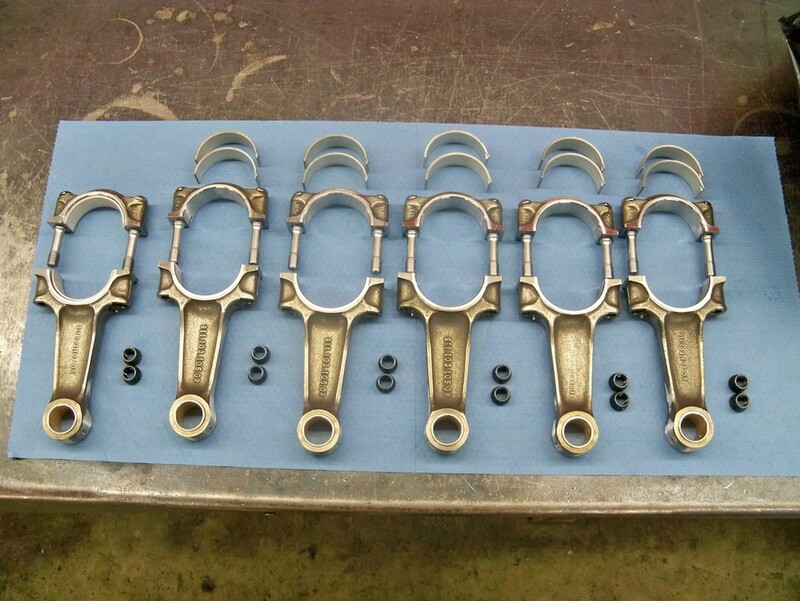 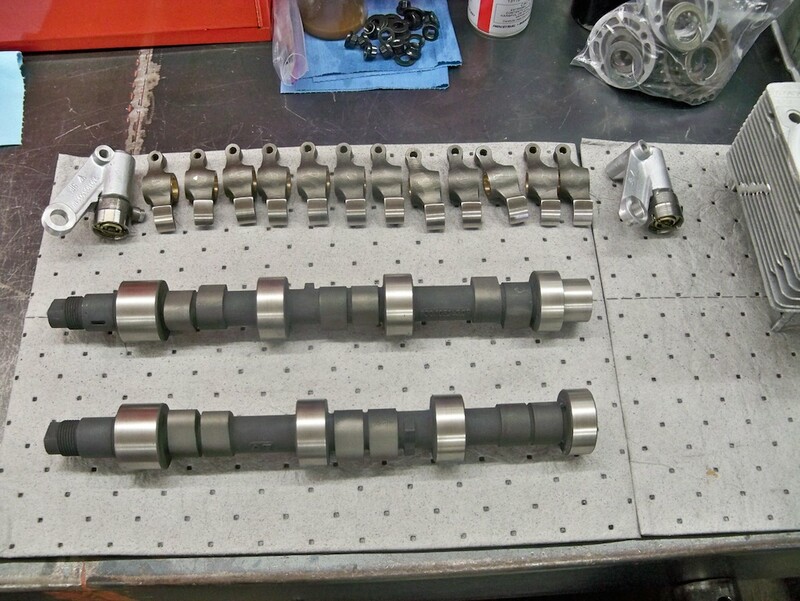 The timing chain housings have been cleaned and re-epoxied.